Click here to move to the Organization & Structure Summary for this page. A bottle closure is, simply stated, the device that seals the contents inside of a bottle, protecting those contents from dust, spilling, evaporation, and/or from the atmosphere itself (Munsey 1970; Jones & Sullivan 1989). The finish and closure are interrelated entities of any bottle. The closure must conform to the finish in order to function, and vice versa. The invention of some closures correspond to certain finishes and a closure may be adapted to old finishes; or both the finish and closure are invented together (Berge 1980). 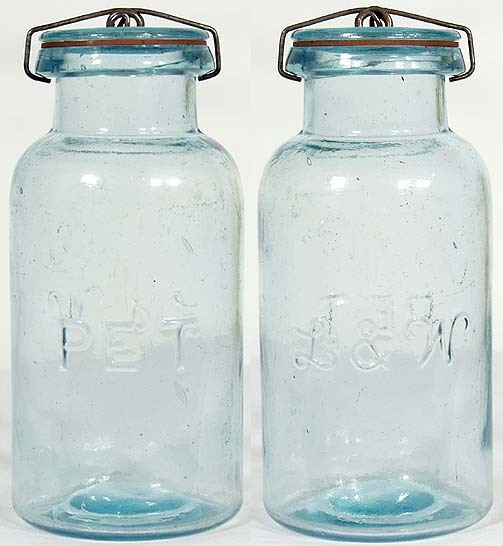 During the early 19th century there was only limited demand for glass bottles & jars since most goods were sold in bulk by general stores out of barrels, pottery jugs, wooden boxes, burlap sacks, and the like. Most people also lived off the land and had limited need for glass bottles; they also lacked the resources to pay for such luxuries. Thus, the incentive to develop varying closures was limited as cork sufficed for virtually all of the bottled products of the time. The use of bottles - and the need for varied closures to seal them - arose with an expanding city based market and even then for just a few types of bottled goods - primarily liquor, wine, and patent medicines in the early 19th century. As cities and relative affluence spread, the market and demand for bottled goods increased rapidly. At the same time, the expansion of the ever growing population into the farming regions of the Midwest created a need for methods and equipment to preserve foods. Thus, the need for canning jars. With the expansion of these demands came the need for suitable containers all of which had to be properly sealed to function. Parallel with the creativity of bottle & jar makers in satisfying this demand for glass containers, the creative juices of closure designers were unleashed. The thousands of different closure designs patented during the 19th century are a testament to that creativity, though most probably never made it into widespread manufacture (Lief 1965; Toulouse 1969a). This variety is illustrated later on this page with links to several dozen canning jars exhibiting a kaleidoscope of closure types most of which saw very limited popularity and use. Like finishes, the subject of closures is a complicated one with the variety of closures exceeding the variety of finishes. Though thousands of closure designs were patented, and many hundreds used, just a handful achieved widespread popularity based on inherent simplicity and effectiveness. The major closure types are what is covered on this page. Minor and obscure closure types are beyond the scope of this website as such information would at best only marginally assist in the goals of the site (dating & typing a bottle) and would occupy an inordinate amount of space (see Reference Notes below). 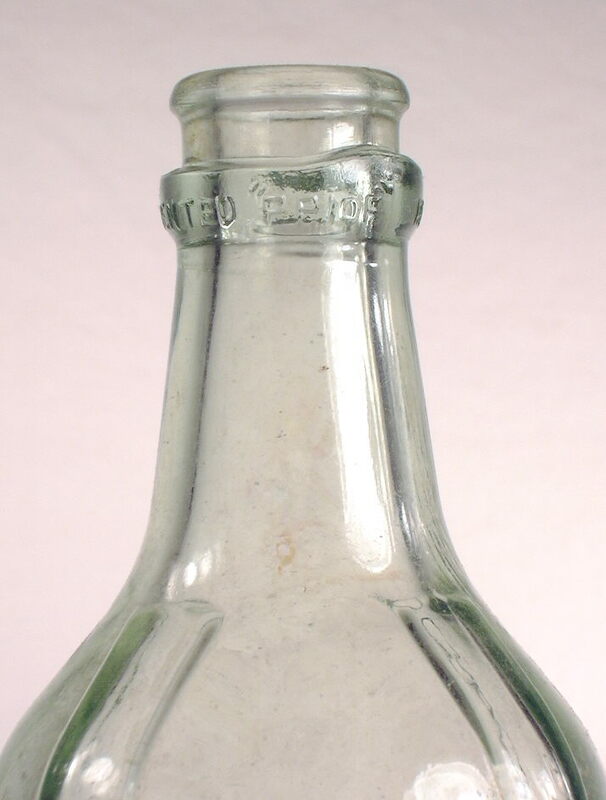 Closures are a useful subject to explore since the type of closure that a bottle had can often provide some dating refinement when used during a relatively narrow time frame. This is particularly true of canning jars and beer & soda bottles during the last half of the 19th and early 20th centuries. Others, like the Lightning closure, was invented in the 1870s and is still in use today. 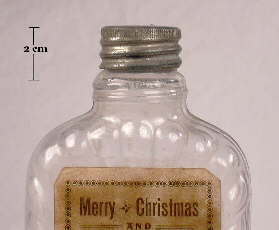 Closures can also often assist in determining what type of bottle one has, i.e., what the bottle was most likely used for if (e.g., liquor, soda) it is not otherwise obvious. Closures are covered as a part of the "Bottle Finishes & Closures" group of pages since closures are very closely related to the subject of bottle finishes as the finish is where the closure was almost always located. The closures on this page are not listed in any particular order, though the first covered closure (cork) is the oldest closure type covered. Reference Notes: One of the better general references on closures is a small booklet entitled "A Close-Up of Closures: History and Progress" by Alfred Lief (1965), which was published by the Glass Container Manufacturers Institute, New York. In addition, a particularly useful recent (2016) work with an emphasis on commercial food bottles/jars is "Historic Bottle and Jar Closures" by Nathan Bender. The other primary references used for the preparation of this page included: Riley (1958), Toulouse (1969a), Munsey (1970), Ketcham (1975), Feldhaus (1986), Bender (1986), Elliott & Gould (1988), Jones & Sullivan (1989), Peters (1996), Fike (1998), Graci (2003), and others along with a lot of empirical observations over time. A. General Closure Types - This section covers closure types that were utilized on a relatively wide array of bottle types. B. Bottle Type Specific Closures - This section covers closure types that were primarily used on one bottle type or at least a limited range of types. 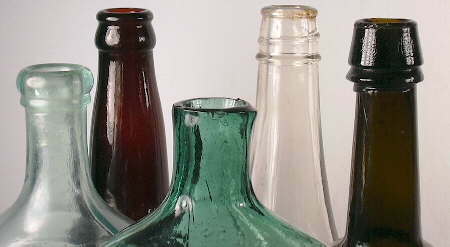 This section covers closures that were used on a wide array of bottle types, i.e., closures which are generally not identified with only one or two types or classes of bottles. Inherently these closure types saw wide use for many types of bottles - implying higher than usual functionality - and because of that also experienced a long time span of use. This unfortunately limits the utility of the closure adding much refinement to the dating of a bottle that these closures are found on. 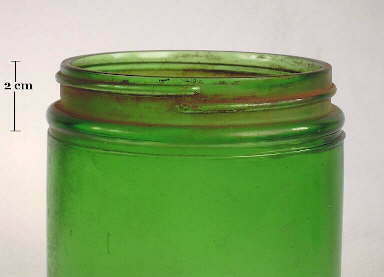 There have been many kinds of closures for bottles, ever since glass and pottery have been used for container materials. Roman and Grecian containers used straw, rags, leather, and the like, luted (sealed) with clay, resins, natural waxes , and other binders. Some of those newly discovered had their closures intact. I well remember the potato that closed the spout of the coal-oil can, and the pottery jug of something or other that grandfather kept hidden in the barn, stoppered with a corn cob. When home and commercial preparation and packaging of preserves, jams, and jellies started in the early 1700s with the greater availability of sugar, one closure method was simply a cover of waxed paper, cloth, parchment, leather, or skin, stretched across the opening, tied, and shorn off just below the tie. It was usually then dipped into hot wax. It was not paraffin as some have stated, because paraffin had not yet been discovered. Neither was this hermetic sealing to preserve sterility - the products involved did not need such protection, nor had the principle of heat sterilization itself been discovered. All that was needed was to keep the contents from drying out, and to keep them clean, as from dust and other unwanted materials. These products did not need the more expensive, handcut, cork stoppers, and such closures were not immediately used. Traditionally the monk, Dom Perignon, cellerer and butler at the Benedictine Abbey at Hautvillers, France, from 1700 to 1715, is supposed to have started the use of whittled cork stoppers to hold the internal gas pressure of the wine that became known as champagne. With that said we move on to the closures most commonly found on bottles made during the era covered by this website - the 19th through mid 20th centuries. The first is the ubiquitous cork closure, the use of which was at least partially pioneered by Dom Perignon. The most common closure during the mouth-blown bottle era was the simple and highly effective cork or cork stopper. Virtually all major bottle types from the mouth-blown bottle era can be found with finishes that accepted some type of cork closure, so there is little if any cork closure related typing utility for mouth-blown bottles (empirical observations). Because of its familiarity and versatility, the cork was popular well into the machine-made bottle era of the early 20th century (Illinois Glass Co. 1920; Obear-Nester Glass Co. 1922; Bender 2016). Cork comes from the bark of the cork oak tree (Quercus suber and Q. occidentalis) and is still, of course, in use today. Cork as a stopper for vessels goes back to antiquity, being mentioned for such use by the Greek author Pliny the Elder during the first century A. D. (Faubel 1938). The elasticity of cork - the ability to assert its normal size after compression - was its primary attribute allowing it to be squeezed into the bore of a bottle and create a seal (Faubel 1938; Jones & Sullivan 1989). In addition, its chemical inertness made it ideal for sealing almost any type of bottled product - liquid or solid - while imparting no flavor to that product (Faubel 1938). Cork when kept moist by the contents of the bottle would also stay plumper and maintain its seal over a long time, which is one of the reasons cork is still used for wine bottles today (Riley 1958). The properties of cork were perfect for the irregularly formed mouths of mouth-blown bottles which had finishes that were hand tooled with a commensurate lack of precision. The author of this website has many cork sealed bottles which are well over 100 years old but still have their contents virtually totally intact. (Cork being somewhat porous does breathe ever so slightly so some evaporation occurs over a long period of time even though securely sealed.) 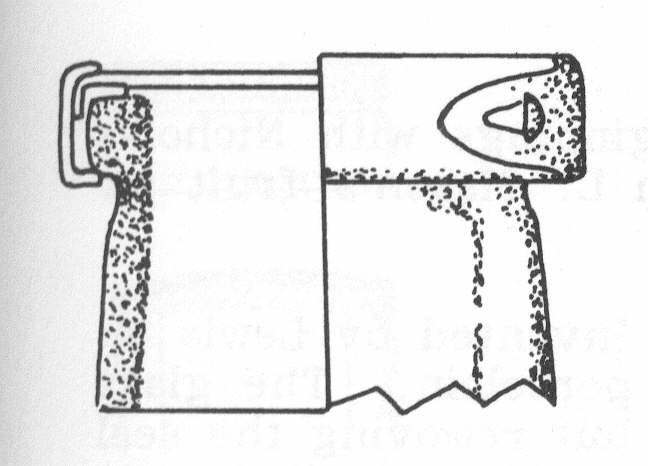 Corks were soaked in water and then squeezed into the proper shape for insertion in bottles with a tool called a "cork press" - see the illustration to the left (Richardson 2003). Click cork press for a picture of an ornate, late 19th century, small hand operated cork press. While wax and resin mixtures were used in the 15th century as a stopper, the cork is also mentioned in English literature in the early 1500s for the same purpose, in connection with bottles. And it was the stopper which permitted the development of the true champagne. The cork was not immediately "tied-on" in the early period for, in England, at least, the wired-on cork dates from 1675-1700. 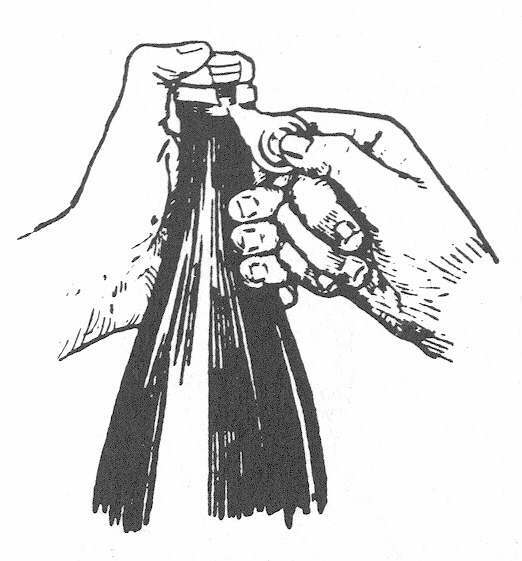 In the early champagne and wine days, the corked (sealed) bottle section was inverted in a wax, compound, or oil to coat the cork; the seal was thus improved. Wax stoppers, used in Mid-Continental Europe for alchemy and medicine, were replaced by tight corks after the latter's discovery. Thus, corks became the common bottle stopper during a 300 year period, from early development before 1600 to almost complete use following 1900. 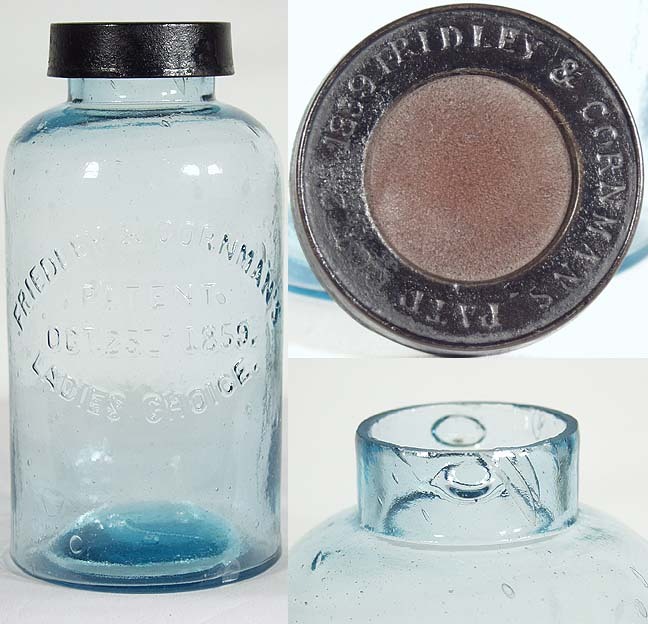 The top illustration shows a cork finish (i.e., cork accepting) on a prescription druggist bottle. The bottom illustration shows the same type bottle with a screw thread finish with the metal cap on. 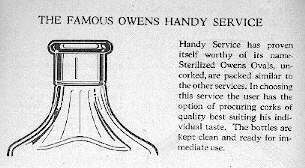 These illustrations are from a 1928 Owens Bottle Company "Want Book and Catalog of Owens Bottles...for Druggists". This catalog shows the availability of both closure types from the same manufacturer in the late 1920s with the note that the screw caps are "...growing more popular every day." 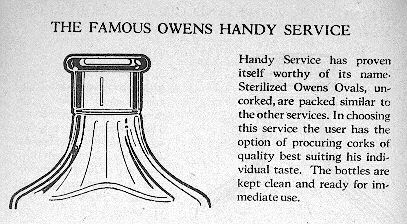 The company (the Owens-Illinois Glass Co. after 1929) still offered cork finishes on prescription bottles until at least the early 1940s, though much diminished in importance in their catalogs. Because of this wide span of use and popularity, the presence of a cork accepting finish is not indicative of age for the majority of bottles made up until at least the 1920s - mouth-blown or machine-made. The utility of cork closures for dating is that certain types of machine-made bottles made the transition from cork accepting to screw-thread (or other non-cork) finishes primarily from the 1920s into the mid-1930s; see the 1928 illustrations to the left (Berge 1980; empirical observations). The bottle types that mostly made the switch during this era are a large majority of medicinal/druggist, food, and ink bottles; the majority of liquor/spirits bottles; and some non-alcoholic, non-carbonated beverage bottles, though there are exceptions with just about all these categories. Cork is still commonly used for sealing bottles containing wine and champagne, occasional "higher end" liquor/spirits bottles (i.e., single malt Scotch), and rarely some specialty food product bottles. Corks were held in place in a lot of different ways. The most common and easiest method was simply the compression induced friction of the cork against the inside of the bottle bore and sometimes upper neck. 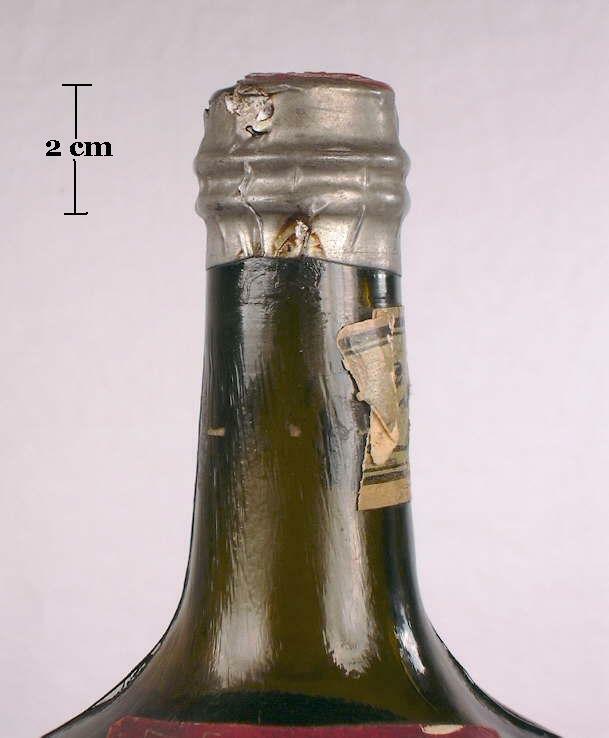 An additional sealing safeguard entailed the placement of a lead or foil wrapper or "capsule" over the upper neck, finish and cork much like champagne and some liquor bottles are sealed today. This foil wrapping held the cork quite firmly in place for most non-carbonated liquids and helped seal the bottle from the atmosphere. A capsule by itself would be inadequate for carbonated products; wire was often used under the capsule to more fully secure the cork. 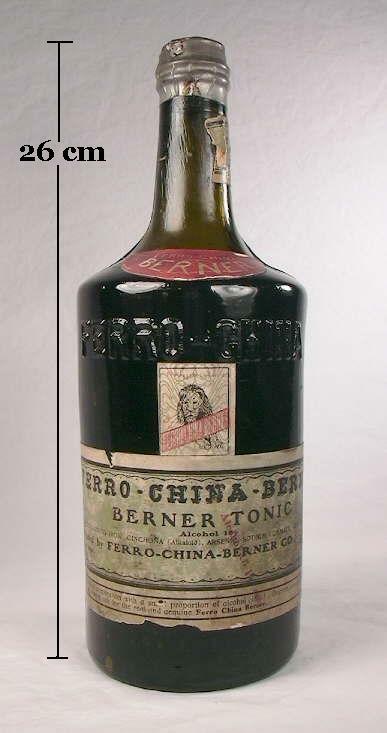 The picture to the right shows an alcohol laced (18%) medicinal bottle (Ferro-China-Berner Tonic) with the full contents and sealed with a foil capsule over the cork. 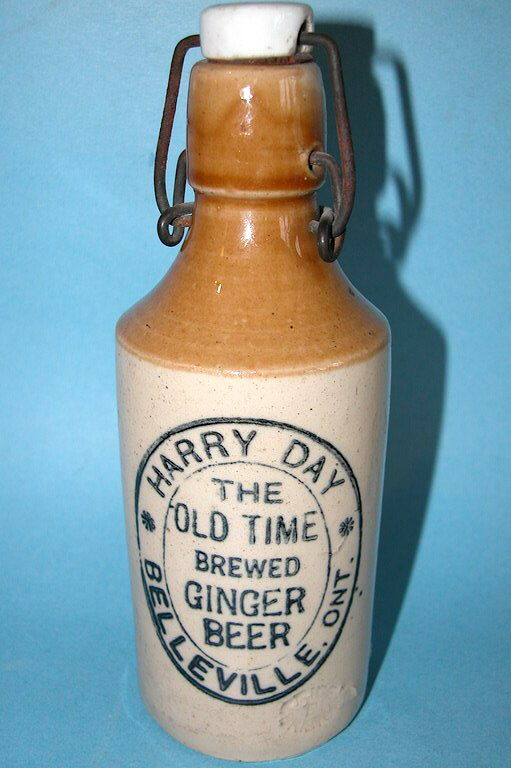 This bottle dates from the early 20th century. Click Ferro-China-Berner tonic bottle to view a picture of this entire bottle, which the label states is from New York, though the bottle (and possibly contents) were probably manufactured in Europe. A similar cork sealing method was to dip the corked finish in hot wax instead of a foil wrapper (Jones & Sullivan 1989). With carbonated beverages (soda, beer, champagne) the cork had to be secured more positively to prevent the content pressure from loosening the cork and slowly leaking the carbonation or even popping out prior to consumption of the contents. 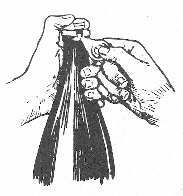 To accomplish this some type of tightened wiring or strong cord or string was wrapped in various ways around the upper neck and finish area with a portion looping over the cork to maintain it securely in the bottle. The picture to the lower right shows an early 20th century (1900-1910) King's Pure Malt "beer tonic" bottle (Boston, MA.) with a blob finish and the cork in place. Though somewhat loose now, the wire that held the cork secure is also still present. The upper, thicker wire looped over the top of the cork (which was pushed in level with the top of the bore) and was held tightly in place by the smaller wires tightly (originally) encircling the neck just below the lower portion of the finish. This type closure is called a "wired cork stopper." 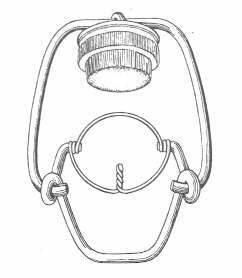 Another popular type of simple cork retainer was the more solid wire Henry Putnam patented (1859) design as pictured below. 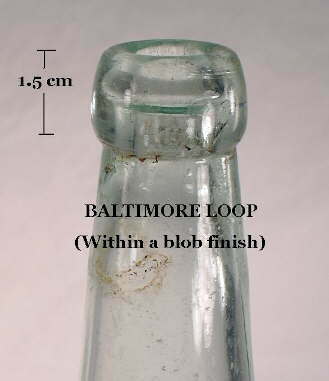 This type wire bail had the benefit of being reusable and was particularly popular on soda and mineral water bottles during the 1860s through 1880s like the Hoffman & Joseph "blob-top" soda pictured which dates from the mid-1880s (Fowler 1981). The utility of the blob type finish was that it provided a large ridge for properly securing the wire below the finish. Many variations on these basic themes can be found on 19th and early 20th century cork sealed bottles (Lief 1965; Jones & Sullivan 1989; Graci 2003). An early method of bottling carbonated drinks was called "Hand and Knee Bottling", and involved an operator who sat at a hand operated bottle filling machine. Holding a bottle to the machine he raised a board under his knee, pressing the bottle's mouth to a tight fit and manually filling it, allowing excess pressure out before inserting a cork, which was then driven into the bottle with a wooden mallet. In this manner 200 dozen bottles a day could be filled by a skilled knee bottler..."
Undoubtedly, that mallet strike broke many bottles. It was this type of relatively slow, labor intensive method in hand with the other noted problems of cork that lead many pioneering inventors to thinking and tinkering towards making both better closure types and machines to speed up and make more safe the process of bottling products. Though cork was effective, most of the early closure efforts by inventers and bottlers were directed at finding a substitute for cork (Graci 2003). The rest of this page discusses some of the more successful "substitutes." One of the most common, non-cork closures is the large and diverse group of threaded closures. They come in both externally threaded and internal threaded versions. The internal or inside thread closures have a couple main variations that are fairly similar except for the materials the closures are made from: primarily hard rubber or glass. The closures for externally threaded finishes vary widely and are made from many materials - typically various metals and more recently plastic, but on occasion glass, rubber, and likely others. Externally threaded closures (and related finishes) are arguably the most significant closure method of all time given that is has had one of the longest runs of any closure method with ubiquity to this day. The distinctive feature of this closure/finish combination is the continuous type threads which are found on the inside of the finish. The outside of the finish looks similar to other finishes of the era. There were two primary types of internal or inside threaded closures: hard rubber and glass. Both are covered separately below. Hard Rubber: This closure/finish is by far most commonly found on U.S. made mouth-blown, tooled finish liquor bottles produced between the late 1880s and National Prohibition in 1920; and in particular between 1895 and 1915 (Wilson & Wilson 1968; Root 1990). The tooled inside thread finish to the left (inside of a "straight brandy" finish) is on an S. A. Arata & Co. (Portland, OR.) pint flask that dates between 1905 and 1911 (Thomas 1998a). Inside thread finishes on flasks were much less common than on cylinder fifths and quarts of that era, but common enough to warrant mention here. The amber tooled inside thread finish (what would otherwise be called a brandy finish without the threads) below left is on an Old Castle Whiskey (San Francisco, CA) that was, according to Wilson & Wilson (1968), produced by the F. Chevalier Company between 1895 and 1901. This is an era typical inside threaded cylinder liquor bottle. 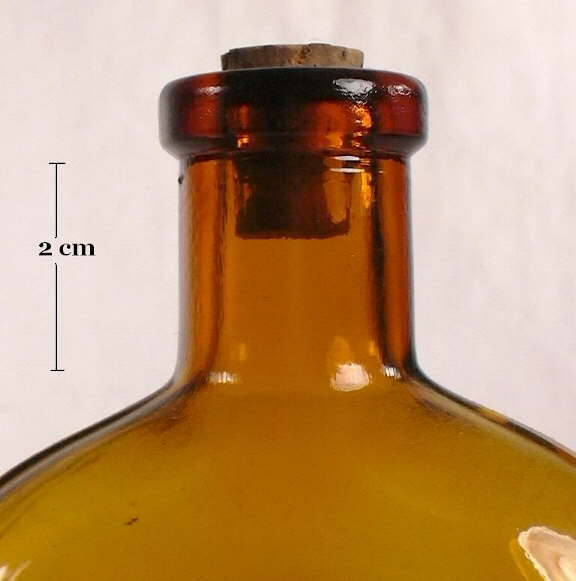 This era's bottles usually had the standardized hard rubber type stopper with rounded and somewhat vague thread ridges as shown close-up in the picture to the right (Wilson & Wilson 1968; Munsey 1970). The stoppers also included a softer rubber gasket right below the head of the stopper which sealed against the rim of the finish (missing on the pictured stopper). These are much easier to screw tight (and unscrew) than the inside thread stopper noted next. 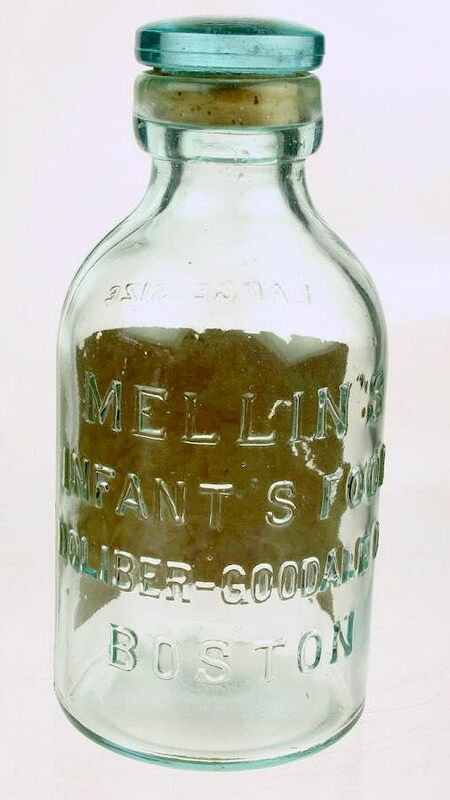 During this era a few other types of bottles were made with inside thread finishes including some soda/mineral waters (most were foreign - English - made), chemical and/or ammonia bottles, perfumes and colognes, some ink bottles, and even some baby nursing bottles (Elliot & Gould 1988; empirical observations). This style of closure/finish combination appears to have been used most commonly on liquor bottles from Western American companies made between 1895 and 1915, though inside threads are known on occasional liquor bottles on the Eastern Seaboard - most notably on the South Carolina Dispensary bottles (Wilson & Wilson 1968; Teal & Wallace 2005). Most if not all of these hard rubber stoppers were made in England and imported for use on American made bottles (Jones 1961). 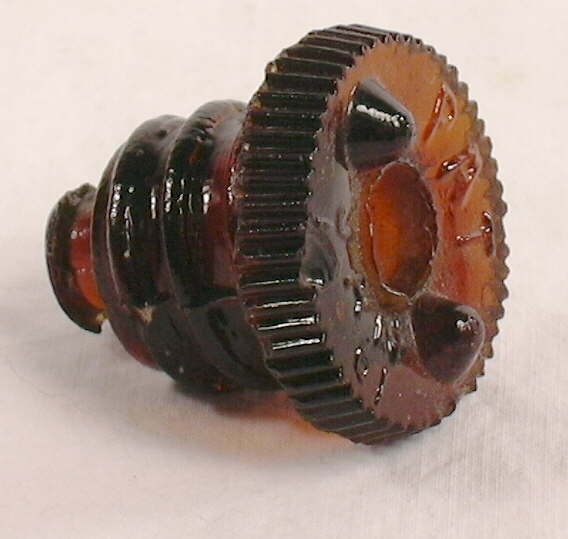 This type of threaded stopper/finish was also very common on English ale and mineral water bottles during the same general era - mid to late 19th to early 20th century - though not covered by this website. The finishes that accepted this type of stopper on American made bottles are almost always tooled finishes, though there some exceptions which have Western American product identification embossed on them but have applied finishes. These were likely foreign made and imported (Thomas 2002). 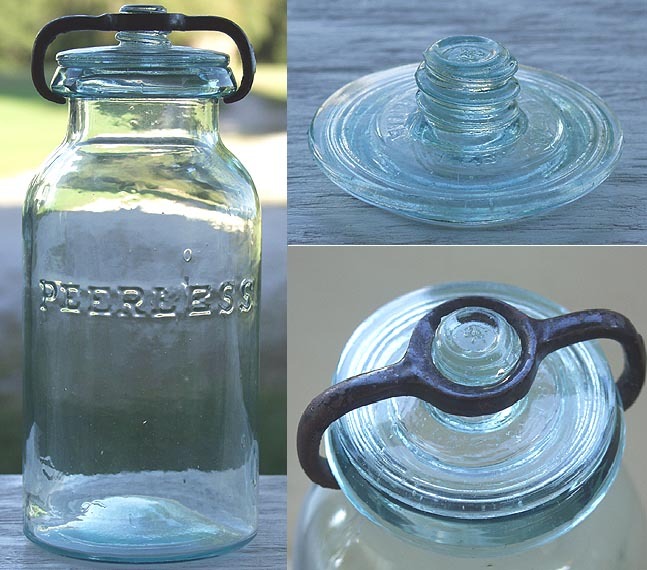 Glass: An earlier and less common type of inside thread finish/closure which utilized a threaded glass stopper was used primarily on liquor bottles and flasks dating from 1861 to probably the late 1870s. 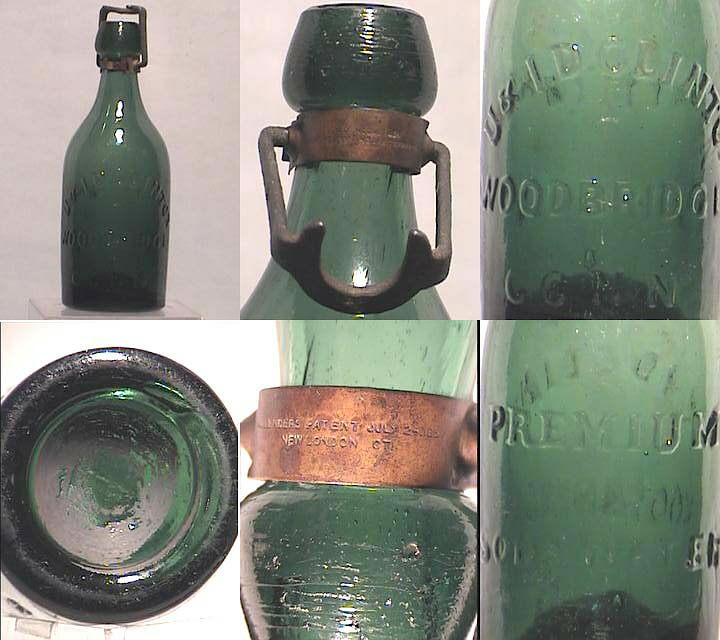 The applied inside thread finish (inside of a "straight brandy" finish) in the two pictures here are on a Weeks & Potter (Boston, MA) liquor bottle that dates between 1861 and about 1870. 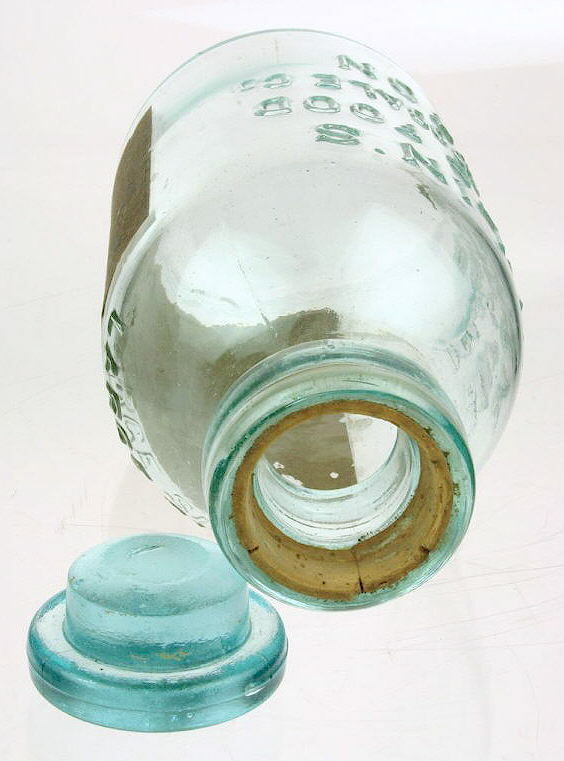 This bottle has the Samuel A. Whitney patented (Patent #31,046, January 1, 1861) inside thread finish that accepts a glass threaded stopper. The patent noted that this finish arrangement was "...applicable to a variety of bottles and jars...(but) is especially well adapted to and has been more especially designed for use in connection with mineral-water bottles, and such as contain effervescing wines, malt liquors, &c..." (McKearin & Wilson 1978; U. S. Patent Office 1861). A later, subtle variation of this type closure and finish was patented in 1872 by Himan Frank (one of the sons of the William Frank & Sons Glass Company [Pittsburgh, PA.]) and was comprised of two patents - one for the finish and stopper (Patent #130,208) and one for the tool that formed the finish (Patent #130,207) (U. S. Patent Office 1872; Lockhart et al. 2008b). In the experience of the author, bottles with the Frank closure and finish are much less common than the Whitney version. These earlier glass inside thread stoppers have much more distinct thread ridges than the later rubber stoppers. This made it a bit harder to screw tight (as well as unscrew) from the finish. Click Whitney glass stopper for a close-up picture of the glass stopper showing the patent date embossed on the top (the stopper is about 3 cm long). As with the hard rubber stopper, these had a soft rubber gasket just below the top cap part of the stopper, that sealed against the top surface of the finish. 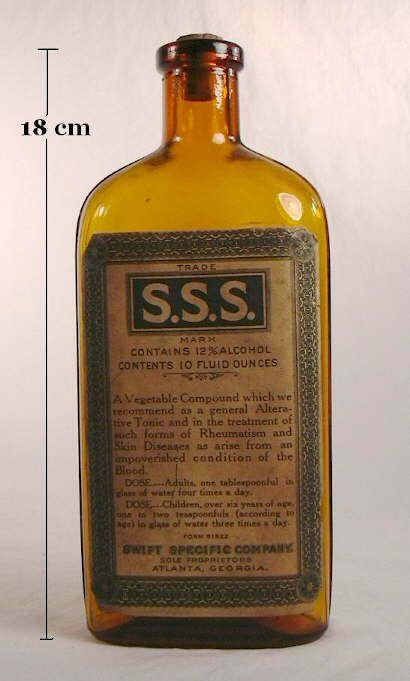 Weeks & Potter was a Boston proprietary medicine (and apparently liquor) concern, founded in 1852 and operating well into the 20th century (Odell 2000:92). These bottles most definitely held liquor as labeled ones have been observed by the author noting that they contained "Old Bourbon Whiskey." This stopper is seen rarely on U. S. produced mineral water and/or ale bottles and even on at least one bitters bottle - Old Homestead Wild Cherry Bitters (Ring & Ham 1998; Graci 2003). It is most often observed (though rarely seen overall) on pint & half pint liquor flasks as well as tall cylinder liquor bottles like the Weeks & Potter bottle, all of which often (but not always) have Whitney Glass Works embossed on the base. 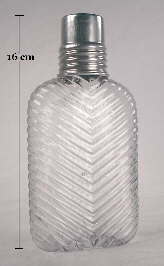 Images of a pint union oval type flask with WHITNEY GLASS WORKS embossed on the base is available at the following links: Whitney Glass Works pint flask; close-up pictures of the base, finish, and stopper. Glass inside thread stoppers were occasionally used on English nursing bottles; click English nursing bottle for a picture of an example. The external threaded finish/closure combination is one of the most common bottle closures of the 20th century and has a wide array of variations. This ubiquitous finish/closure combination is distinguished by having some type of raised ridge or ridges on the outside surface of the finish that accepted an appropriately shaped cap which tightened and sealed the bottle when twisted. External thread finishes are so commonly used today that further explanation is probably not necessary; everyone is familiar with "screw-top" bottles. For more information on some of the varieties of externally threaded finishes and their closures, click Bottle Finishes & Closures: Part II: Types or Styles of Finishes. That information is not repeated here since the major differences between varieties is related more to the finish conformation than the cap. Plastic caps for external threaded finishes: an excellent bottle dating feature! Plastic caps for screw thread finishes can be an excellent tool for bottle dating. Bakelite - an early thermosetting plastic - made its debut in 1927 as a screw cap closure material though was first patented in 1907 (Berge 1980). 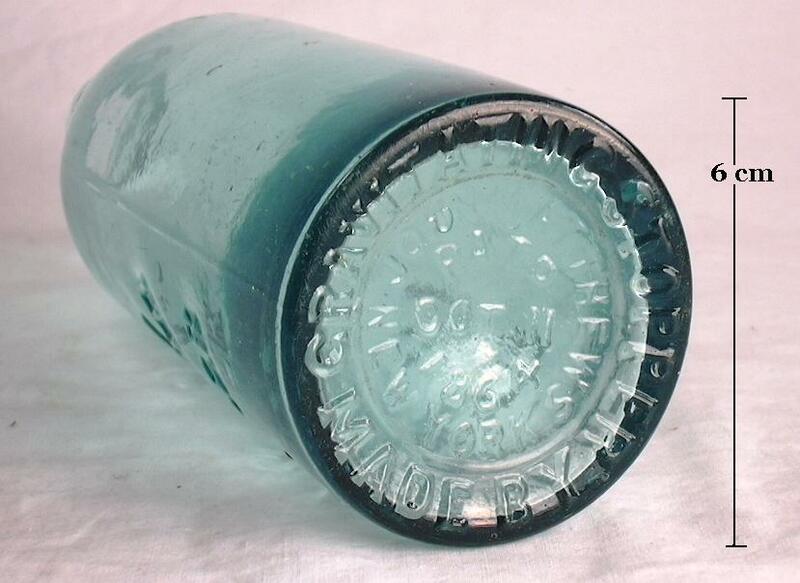 This provides a terminus post quem (earliest date of use) of 1927 for bottles with the plastic cap still present. The illustration above is from a 1932 Owens-Illinois Glass Co. (Toledo, OH.) 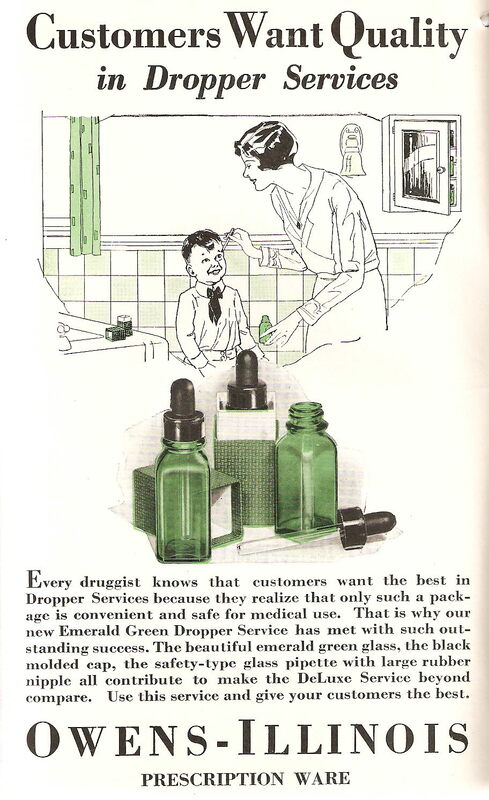 druggist bottle catalog showing green glass (the same green glass used for the jar to the right) dropper bottles with a "molded cap." The flask pictured above - with cap in place and cap removed - is a mouth-blown bottle on which the mold formed the threads. Click external screw thread flask to view an image of this entire liquor flask. 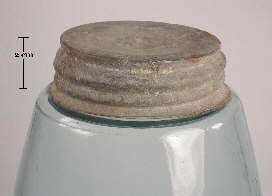 The rough top surface of the finish, where the blowpipe was removed, was ground down flat to facilitate sealing between the cork liner on the inside top flat surface of the cap and the top of the finish. This flask dates from just before National Prohibition went into effect in 1920, as it is maker marked ("M" in a circle) on the base by the Maryland Glass Co., Baltimore, MD. (Toulouse 1971). (Note: This flask also originally had a shot cup screw cap that was placed over the cap shown and tightened down on the screw threads that are just below the bottom of the small cap. See the Double Screw Thread closure section at the bottom of this page for more information.) Outside of canning and some other food type jars, liquor flasks, and a few other styles, mouth-blown bottles with external screw thread finishes are unusual. Click on the following link - true applied external screw cap finish - for a discussion of a very unusual true applied finish with external screw threads - an extremely uncommon occurrence. By about 1920, machines dominated the production of bottles (Barnett 1926). The higher levels of precision attainable with automatic bottle machines and the adoption of industry-wide standards for external thread finishes and metal screw cap closures between 1919 and 1924 spelled the end of cork as the dominant closure type (Lief 1965). Externally threaded bottles probably dominated the market by the late 1920s with cork sealed bottles becoming increasing more uncommon after that date with the exception of wine bottles, many liquor bottles, and bottles sealed with the revolutionary crown caps (Lief 1965). See the box to the left for information on plastic screw caps for bottles. The machine-made external threaded finish/closure combination pictured to the right - with and without the metal cap on - is on an ointment jar that was produced by the Owens-Illinois Glass Company in 1940 based on the mold markings on the base. These jars were produced at least as early as 1935 and probably continued to be manufactured through the 1940s (Owens-Illinois Glass Co. 1935). The dating of bottles with external screw thread closures follows, of course, the dating for the finish it fits. For more dating information, click Bottle Finishes & Closures: Part II: Types or Styles of Finishes to view the portion of that page (#16 "small mouth external threads" and #17 "wide mouth external threads") which discusses the general dating of various types of external screw thread finishes/closures on different types of bottles and jars. Click here to return to the page content links box above. The "Lightning" toggle or swing-type closure is covered under this section because of its widespread use on a lot of different bottle types, though its primary application was for carbonated beverages (soda, beer) and canning jars (both also covered later on this page). 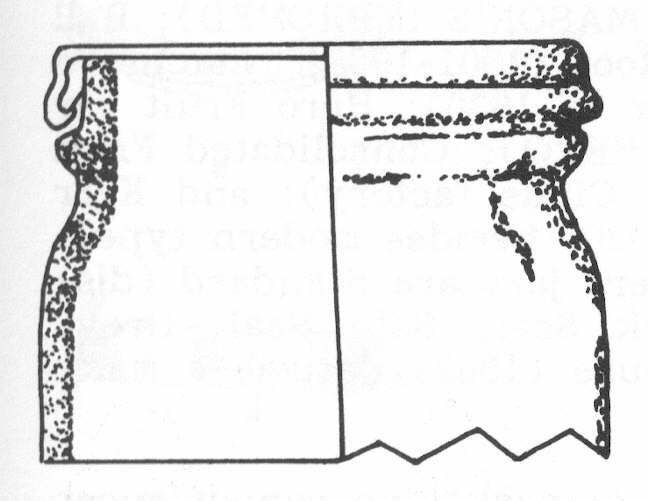 The sealing surface for these two main types of Lightning-type closures was different; that information is found below. There have been many subtle variations and imitations of this style; thus the reference to "Lightning-type" closure. This important closure was invented and patented first by Charles de Quillfeldt of New York City on January 5, 1875. The design was intended initially for beverage bottles. 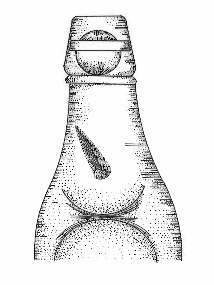 Click Charles de Quillfeldt's Bottle-Stoppers Patent #158,406 to see the original patent (U. S. Patent Office). To quote Toulouse (1969a) about the de Quillfeldt patent: "This patent covered all the basic details. The seal was composed of a neck tie-wire, a lever wire, and a bail. The bail passed through a hole in the metal, rubber faced, lid. The lever wire was hooked into loops in the heavy neck tie-wire on opposite sides of the bottle. Movement of the lever wire past the line of centers of force was stopped by the neck of the bottle." Looking at the picture to the left while reading this description is helpful. The illustration to the right shows the configuration of the closure without the bottle (Lief 1965, courtesy of the Glass Container Manufacturers Institute). 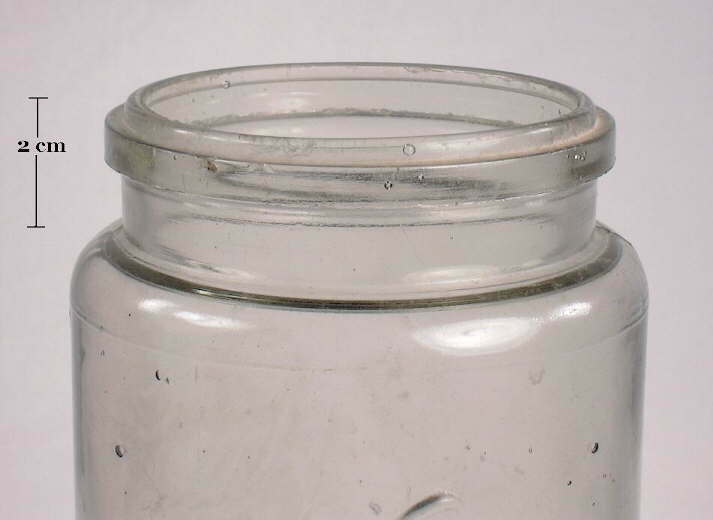 The actual "stopper" or lid portion of this closure was usually made from either metal (true Lightning closure) or porcelain/ceramic (Hutter style discussed below) with a round rubber gasket attached to the shank of the stopper to seal the bottle (gasket shows in picture below). The picture above is of a classic Lightning closure with a metal lid with the gasket missing on a Buffalo Brewing Company bottle (Sacramento, CA.) 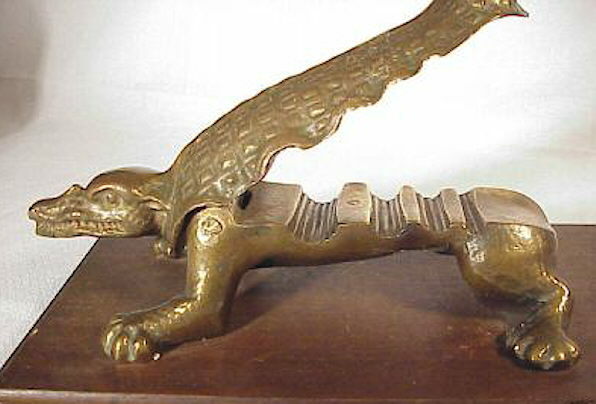 with a tooled blob finish that dates between 1890 and 1902 (Toulouse 1971; Groff 2002). Note: on this website the Lightning and Hutter type swing stoppers are just called Lightning or Lightning type. 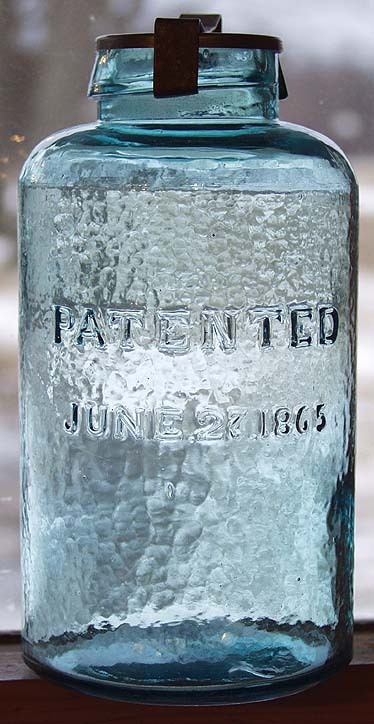 Shortly after patenting the design, de Quillfeldt sold the patent rights to several individuals, including Henry Putnam (for fruit jars primarily) and Karl Hutter (for beverage bottles; transferred June 5th, 1877). The history of competing designs, contentiousness, and lawsuits between these and other individuals using this basic form of closure is fascinating, but beyond the scope of this website. See Toulouse (1969a) or Graci (2003) for more information on this subject. Pictured to the left is a Lightning-type closure, on a pint beer bottle of a style common between 1890 and 1915, which is marked on the underside of the ceramic stopper with "Hutter's Patent" which is likely related to a later (1892) Hutter patent based on the original design. (Click Karl Hutter's Bottle Stopper Patent #491,113 to see this patent.) 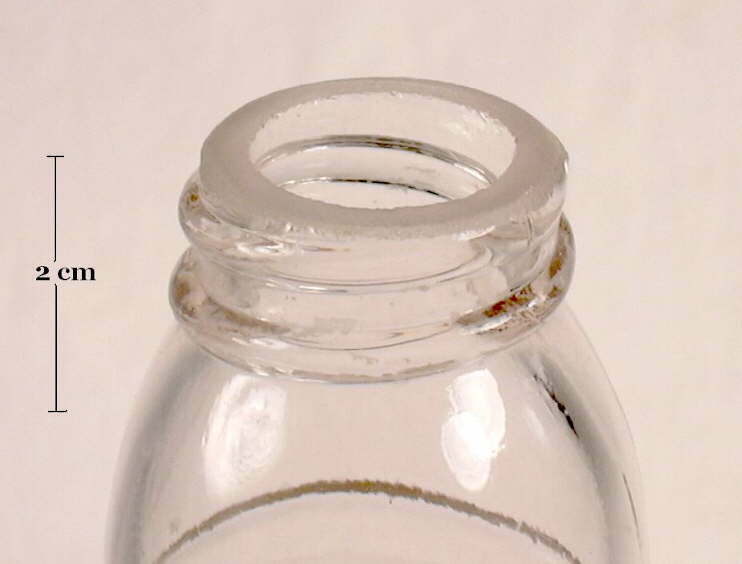 The sealing surface for small bore (beverage type) Lightning-type closures was the rim (top surface) of the finish and extreme upper portion of the bore just inside the bottle; where the rubber gasket shows to the left. As one can see in comparing the Hutter closure with the other two pictured beer bottles, there are no real functional differences between them. Click W. E. Earl beer bottle to view a picture of the entire beer bottle (W. E. Earl / Newton, N.J.) with the Hutter closure. Other Lightning-type toggle closures with variably subtle differences though still with the toggle portion at the lower part of the finish or upper neck, were patented by F. Perry (1878), N. Fritzner (1880), E. Manning (1896), L. Brome (1899), J. Alston (1900), F. Thatcher (1901), M. Landenberger (1901), W. Cunningham (1901), L. Strebel (1903), and others. Closure names included the "Electric" (1889), "Pittsburgh" (1889), "Porcelain-special" (date unknown), and others (Berge 1980). All of these variations saw some limited use during the same period as the "true" Lightning (including the Hutter) closures. The bottles these Lightning type closures are found date in the same range, though likely closer to the actual patent date since none received the widespread acceptance of the original Lightning. During this same era there were numerous related closures that utilized a toggle or "lever" on top of the closure instead of below like with the Lightning-types. Click Walker Patent stopper for an example of one - the James T. Walker 1885 patented closure. For more information on soda & beer closures, see Graci's book (Graci 2003). 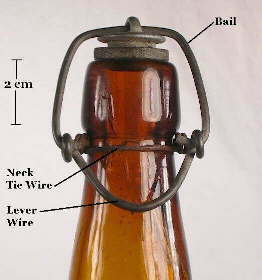 Lightning-type swing closures were most popular on beer and many soda bottles from the 1880s into the 1920s. Use after that time was limited though occasional. 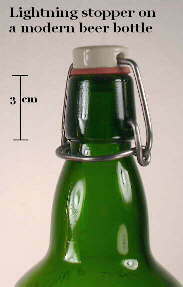 The bottle/closure pictured to the right is a modern Grolsch® Lager (Dutch) bottle having a pretty "classic" Lightning-type closure. That company's current marketing internet site calls it the "Swingtop" closure and notes that it has been used by them since 1897 (Grolsch® website: http://www.grolsch.com). The only difference between the "Swingtop" and Lightning-type closures is that the "Swingtop" has no neck encircling wire. Instead the closure is attached to the finish via two dimple holes on opposite sides of the lower finish. 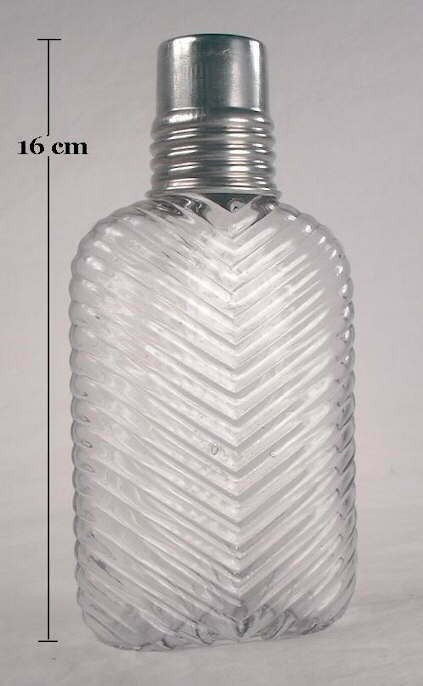 Lightning-type closures are also found today on various foreign beer bottles, some decorative storage bottles & jars sold in "import" stores, and likely other bottle types. The lid portion of modern Lightning-type closures are usually made from plastic but still have the rubber gasket for sealing. 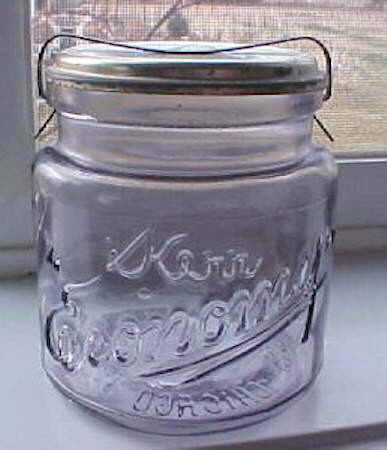 One of the best known Lightning-type variations is the closure found on canning jars (pictured below). 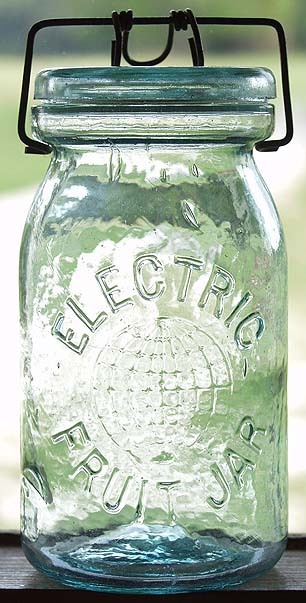 Though the term "Lightning" was used by de Quillfeldt in reference to the sealing method, its application and use on fruit jars gave rise to the actual name of the Lightning fruit jar and the popularity of the term for the closure. 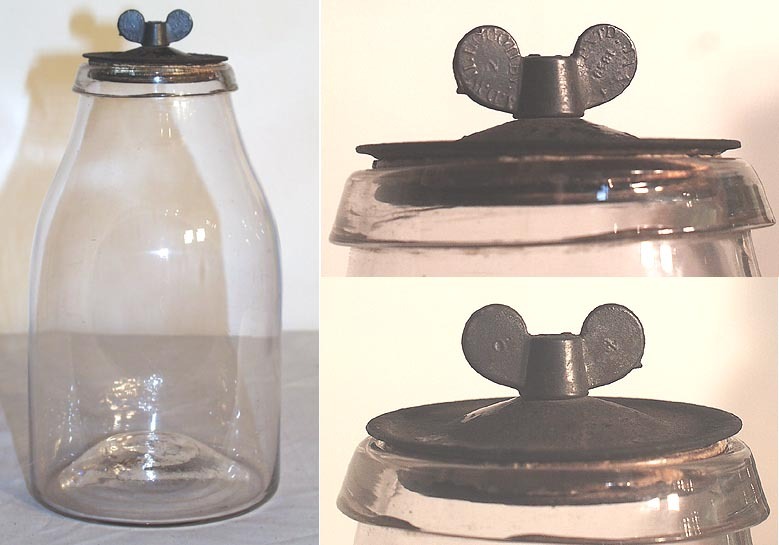 The sealing surface for the Lightning closure on fruit jars was the shelf that the lower edge of the lid sat on; a rubber gasket was placed between that shelf and the bottom surface of the glass lid which when the closure is tightened forming a seal. Henry Putnam's contribution to this world is that he slightly altered the original de Quillfeldt design in that the bail is not actually attached to the lid, which would not work on wide mouth jars. Instead, the lid is held in position by centering the bail in a groove or between two raised dots in the center of the lid. This securing point has been called a cover groove (White 1978). The other minor difference is that two metal "eyes" replaced the loops on the tie-wire as fulcrums for the lever wire. In collaboration with de Quillfeldt, Putnam patented this closure in 1882. Click Lightning jar closure and lid for a close-up picture that shows the cover groove and one of the metal "eyes" (visible on upper part of tie-wire) on a quart sized Lightning fruit jar. 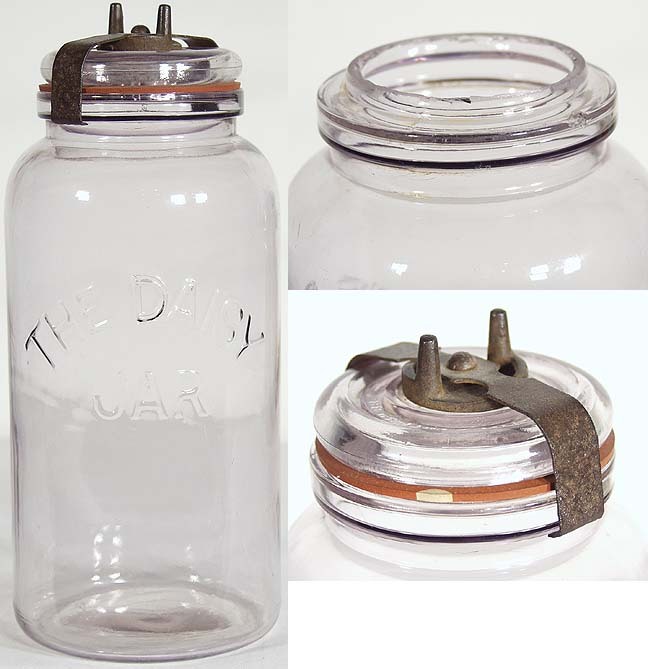 Click Henry Putnam's Stopper for Jars Patent #256,857 to see the original patent for this specific jar closure (U. S. Patent Office). The linked patent illustrations also show well the conformation and functioning of the Lightning closure. 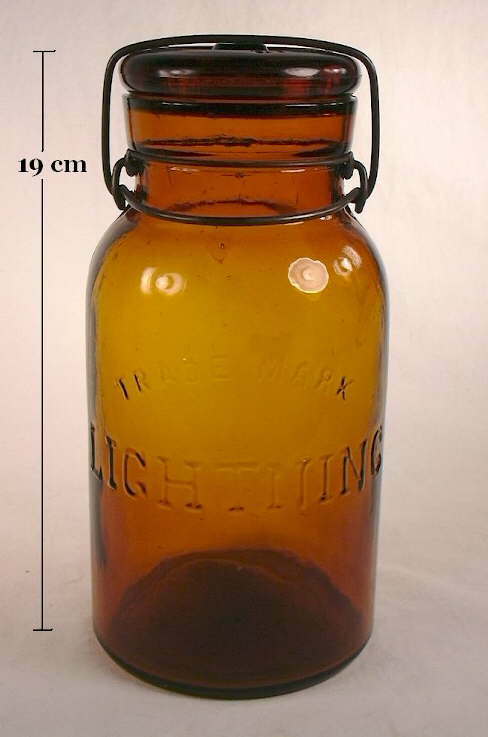 Though not as ubiquitous as the Mason screw thread type jars, Lightning jars were quite popular with home canners and date from 1882 to the early 1900s. "PUTNAM" - for Henry Putnam - is embossed on the base of most Lightning canning jars. 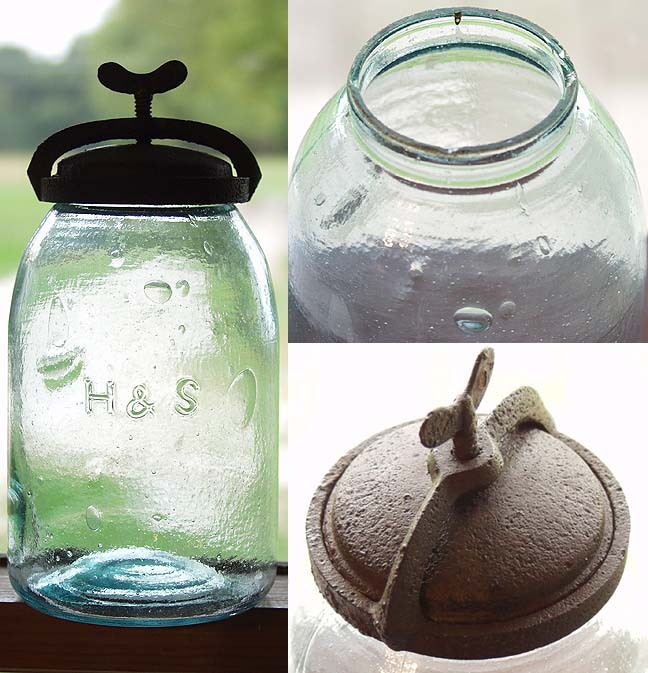 Lighting-type closures are found on various fruit jars made from as early as the late 1870s until at least the mid-20th century (Toulouse 1969a; Creswick 1987). Lockhart, Bill, Beau Schriever, Bill Lindsey and Carol Serr. 2016h. Henry W. Putnam and the Lightning Fastener. 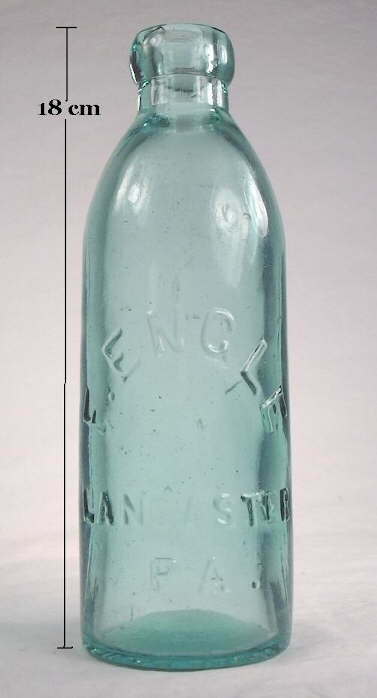 Historic Glass Bottle Identification & Information Website, E-published June 2016. Article on the history, products and markings for this well known mid 19th to early 20th century inventor and company. 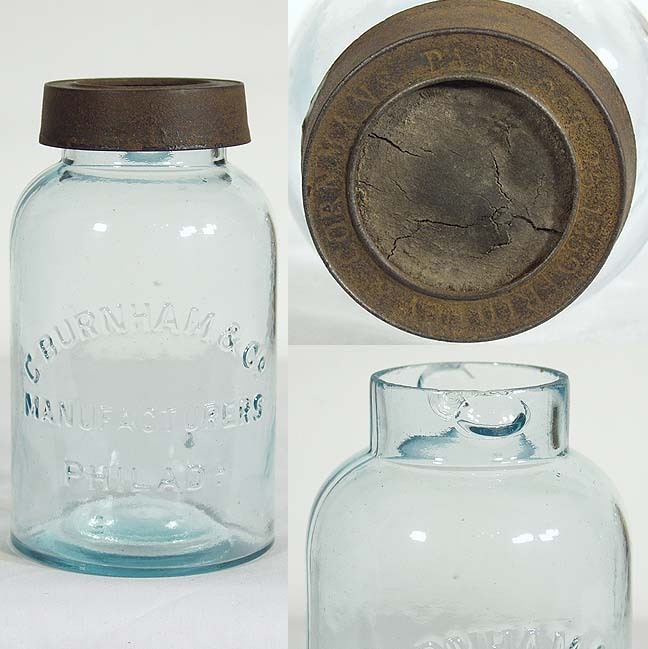 This article is available at this link: http://www.sha.org/bottle/pdffiles/HenryPutnam.pdf This article is part of the Encyclopedia of Manufacturers Marks on Glass Containers. Generally speaking, a stopper is any closure which fits inside the neck (bore) of a bottle to make a seal, rather than on top of the finish - like a crown cap - or around the outside of the finish, like a screw cap (White 1978). The use of stoppers as closures for bottles dates back to antiquity, with some glass ones dating back as early as 1500 B.C. (Holscher 1965). 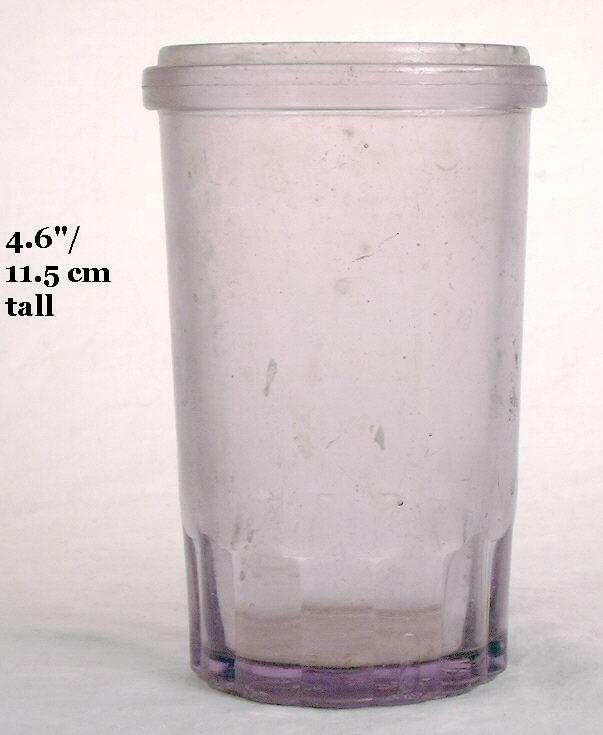 Ground glass stoppers appeared in the U.S. by 1790 though the serious use of glass as a stopper - especially for food containers - began in the U.S. during the 1840s and 1850s (Bender 1986). In the bottle world, the term stopper is often used in reference to non-cork type closures made of glass (sometimes in combination with cork however), though sometimes porcelain, ceramic, metal, or hard rubber are used. 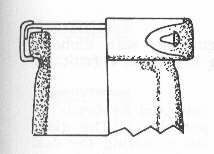 Bender (1986) defined a stopper as "A closure held in place by means other than gravity and engaged primarily within the vessel bore." A simple cork is, of course, a type of stopper. This section briefly covers various types of stoppers beginning with glass by itself, followed by glass and cork combinations, then other non-glass materials. Since cork by itself was discussed separately above it is not addressed again here. 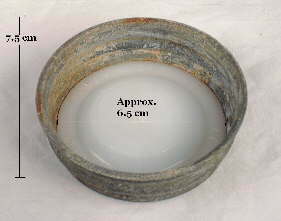 Glazed crockery is often found as the "stopper" part of the Lightning-type closures which was also covered above. 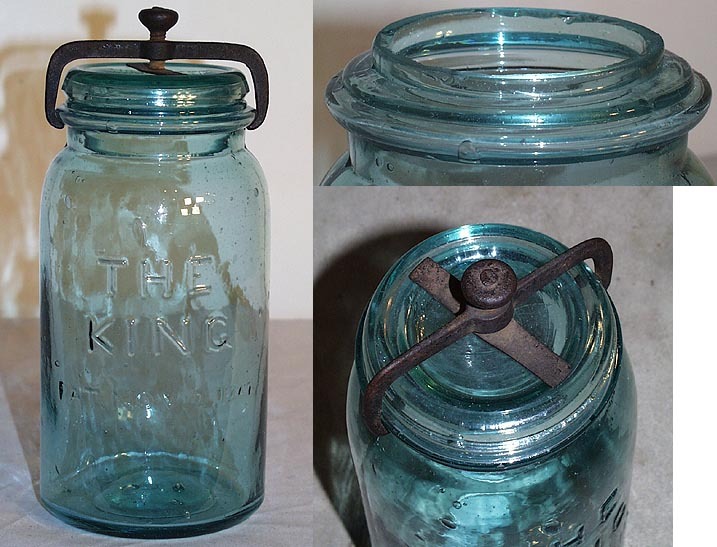 Canning or fruit jar stopper type lids are discussed later on this page. Excluding cork and crockery, a glass stopper was likely the most common material that was used as a bottle stopper, that that perception could be skewed by the higher likelihood of a glass stopper surviving to the present than most other materials. Glass stoppers can be either solid glass (two stoppers below) or hollow (green stopper to the left). The configuration and shapes of glass stoppers vary widely from the simple utilitarian (two stopper below) to the ornate and decorative - like on the decanter pictured to the left below). 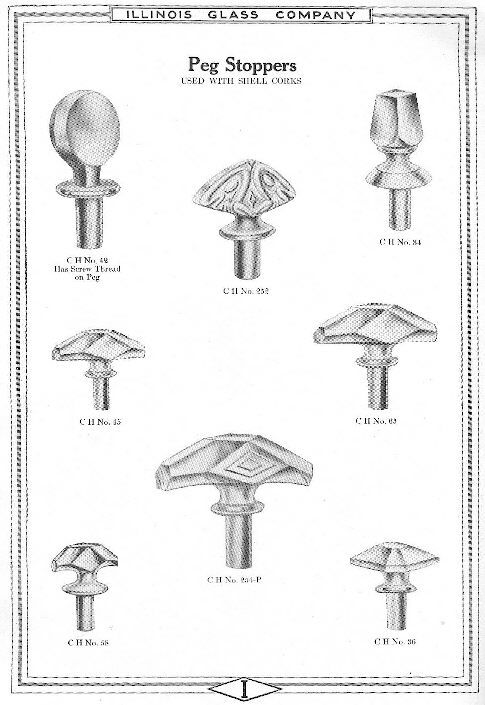 Click W. T. Co. 1880 catalog page to see an illustration of available stock glass stoppers for various types of bottles from the 1880 Whitall, Tatum & Company catalog (Whitall Tatum Co. 1880). 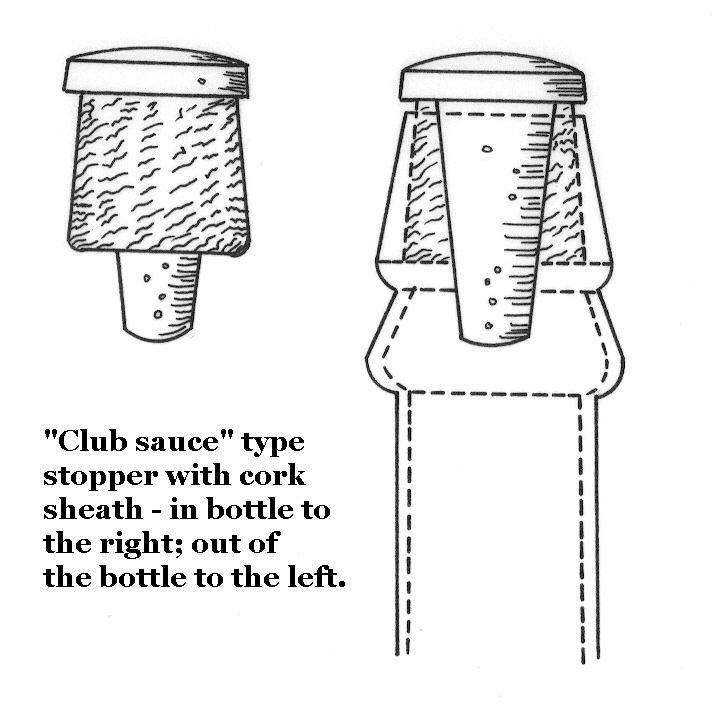 Some glass stoppers were designed for disposable bottles like the club sauce bottle stoppers pictured below which had the shank of the stopper sheathed in cork (see the "Glass & Cork" discussion below). 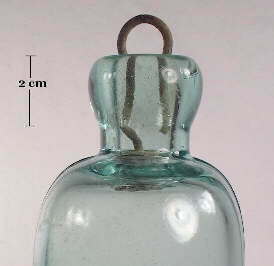 Other stoppers were intended for re-useable or decorative bottles like the colorless glass decanter below. Regardless of the shape of the stopper, they were all intended to perform the same function - insert securely in the neck of a bottle and seal the contents from evaporation, oxidation, and/or contamination. 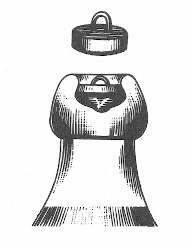 Glass stoppers are made up of three parts - the shank, which is the part that inserts into the bore/neck of the bottle; the finial which is the portion above the shank that one grasps to remove the stopper from the bottle; and the neck, which is the transition point between the shank and finial. Click on the emerald green bottle above to view a larger picture of this bottle illustrating these parts. Most glass stoppers were molded to shape then the shank ground to a more precise shape. However, some very early bottles and decanters (first half of the 19th century and before) were free-blown or pattern-molded with the stopper shank (and matching bore) not molded or ground to shape (McKearin & McKearin 1941). If a more or less airtight seal was desired (and it usually was and is) then the shank of the stopper had to be ground down to precisely fit the bore of the bottle. The bore was also ground to the accept the stopper shank. The two ca. 1890-1910 glass stoppers pictured to the above right have the shanks ground to fit the bore of the bottles they were intended for. Since the stopper was ground to fit the neck of a specific bottle, each stopper is a relatively unique fit to a specific bottle. 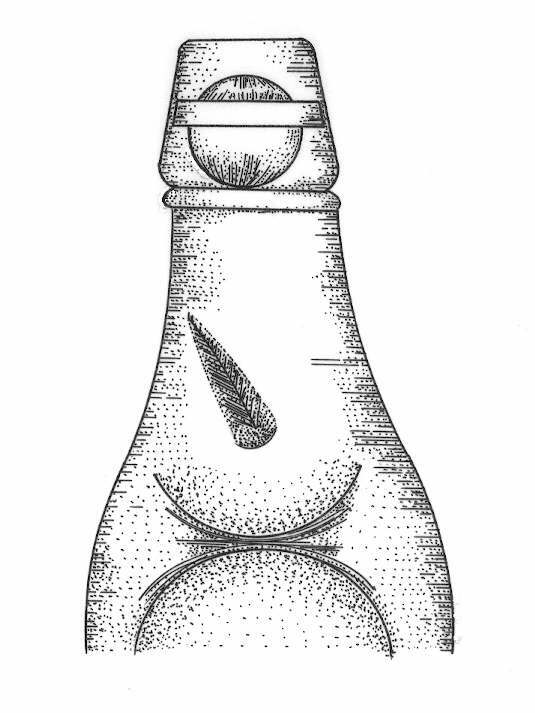 If the shank of the stopper and bore of the bottle show no evidence of shape grinding it is likely a bottle or jar intended to hold some type of dry substance, the grinding evidence was polished away (discussed below), or the shank of the stopper was originally fit with a strip of shell cork to ensure a seal (Jones & Sullivan 1989). See the "Glass & Cork" discussion below. 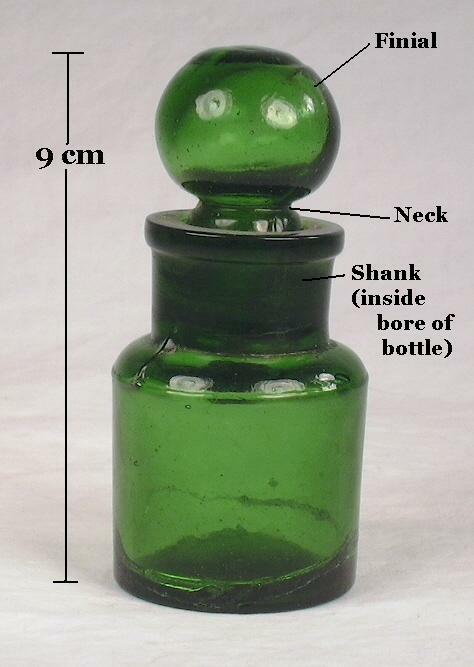 The emerald green bottle pictured at the beginning of this section is a small smelling salts or cosmetic bottle with a ground glass stopper that likely dates from the early 1900s, though could be from as late as the 1920s as it is a "specialty" bottle that is hard to precisely date. This small bottle is mouth-blown in a three-mold as indicated by the absence of mold seams on the bottle body except right at the junction between the upper body and the narrow shoulder. This bottle may or may not have been intended for re-filling and re-use, though many of these type bottles were purchased and kept indefinitely because of their decorative appearance - an example of attractive packaging selling the product. Glass stoppers of varying shapes and sizes were utilized in a wide array of different type bottles over a very long period of time. Because of that fact there are few dating opportunities inherent with glass stoppers. Other manufacturing based diagnostic features must be used to date a bottle with a glass stopper. 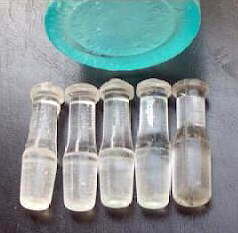 Glass stoppers are most common in bottle types that were intended to be either re-filled/re-used or the original contents utilized over a long period of time. This includes: perfume bottles, bulk chemicals and pharmaceutical product bottles and jars, liquor and wine bottles/decanters, some non-perishable food type bottles, and many inkwells. Glass stoppers are rarely if ever seen in the majority of bottle types where the contents were intended to be consumed all at once, the contents were incompatible with glass stoppers, and/or the bottle was intended to be thrown quickly away (most bottles). 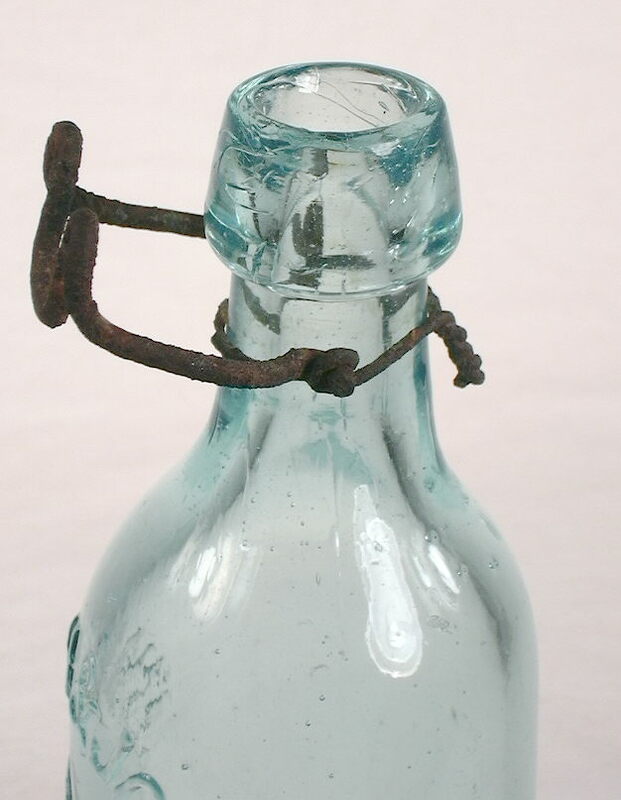 Bottles with ground glass stoppers were 2 or 3 times more expensive than the equivalent bottle without a glass stopper so it is not surprising that most bottle types never or rarely were made with glass stoppers. This larger group of bottle types includes: most all patent/proprietary medicines and bitters; druggist bottles; beer, soda/mineral water, and champagne bottles (glass stoppers are not compatible with carbonation); food bottles; milk bottles; most ink bottles; and most liquor, wine, and champagne bottles (Jones & Sullivan 1989). A very common category of bottle stoppers merged cork and glass in combination. 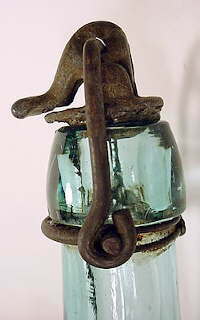 The shank of the glass stopper was molded to shape, like most of the glass stoppers described above, but neither the shank nor the bore of the bottle were ground to mesh with each other. Instead, a cork sheath (a cork with a hollow center called "shell cork" in the trade) was placed around the stopper shank allowing for a tight seal of the bottle because of the pressure of the glass stopper shank against the shell cork which pressed against the bore of the bottle. This is shown in the picture to the left and the illustration below. 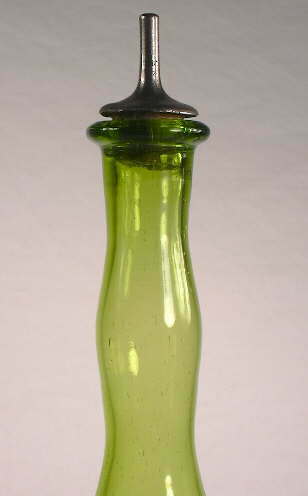 The use of cork in combination with a simple glass stopper was much cheaper than hand ground glass stoppers (Illinois Glass Company 1920). 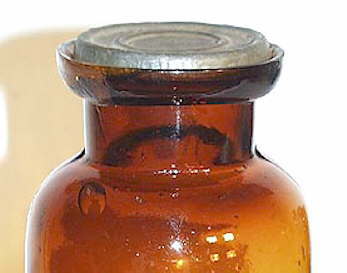 This type of closure is often called the "shell cork and stopper" style. A very common configuration of the glass and cork combination closure were the club sauce type stoppers, several of which are pictured below right without their shell cork sheaths which deteriorated long ago. This type stopper has a flat, circular, horizontal top portion (finial) with a narrow tapered shank on the underside perpendicular to the finial; there is no neck between the finial and the shank. 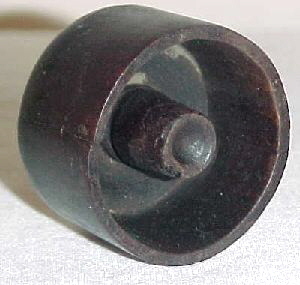 This conformation of stopper was also called a "flat hood" stopper (Whitall Tatum & Co. 1902). 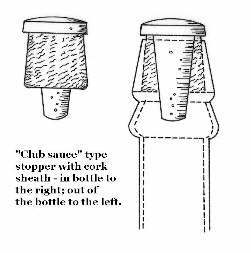 A diagnostic feature of a finish that accepts a club sauce type stopper is that just inside of the bore, about 1/2" below the finish rim, there is a distinct ridge or cork seat surface on which the cork rests. This gives rise to the alternative name for this finish/closure of a "stopper and cap seat" (Boow 1991). The picture to the left above shows a club sauce type stopper in the bore of a more or less "mineral" type finish with the cork still present and encircling the stopper shank, though the cork is actually adhering to the walls of the bore. Click and enlarge this picture as the cork seat ledge is just slightly visible right where the lower edge of the cork shell ends. With the cork and stopper missing, the cork seat ledge can be seen or easily felt by sticking ones finger in the bore. Be aware that not all bottles that originally had a club sauce type stopper have this ledge, but bottles/finishes with a cork seat ledge present were made for this type of closure. When opening these type bottles, it is not clear if the cork was intended to remain around the stopper shank or remain in the bore of the bottle; probably both ways depending on the product. The flat top portion of the glass stopper often has embossing on it identifying the product brand - virtually always a sauce product. The most commonly found embossed stopper is from the Lea & Perrins® Worcestershire sauce bottles, which began importation into the U.S. in 1849. The picture to the right shows one stopper (facing towards the camera; click to enlarge) which is embossed Garton's, an English competitor of the Lea & Perrins® company. Garton's began production of their HP Sauce in 1903 giving an earliest possible date for this particular stopper. In 1930, HP acquired ownership of Lea & Perrins® and both products are still produced by the same company (HP Foods Ltd. which was recently acquired by H. J. Heinz). Embossed Lea & Perrins® stoppers can date back to the third quarter of the 19th century, as is likely of the various competing sauces. The club sauce type glass stopper/cork combination closures were also used on an assortment of different, non-sauce types of bottles from the mid-19th century through the mid 20th century. They were quite commonly used on mouth-blown liquor flasks and some larger cylinder liquor bottles from the late 19th century (primarily 1890s) into the mid 1910s. They were also used after that time on machine-made liquor flasks into Prohibition ("medicinal" liquor) and likely through the 1920s and possibly later. Many of the liquor bottles that used the club sauce type stopper/cork are identifiable in that the inside of the bore has the cork seat ledge in evidence. Click IGCo. 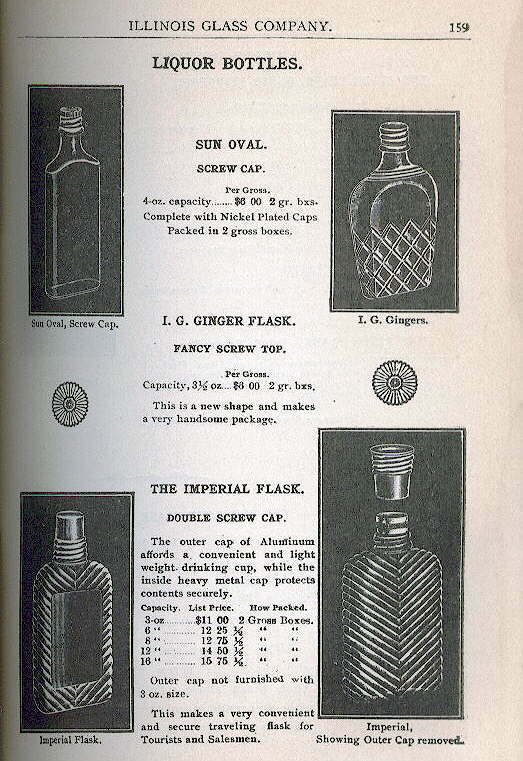 1908 catalog page for an illustration excerpt from the 1908 Illinois Glass Company catalog showing a couple flasks with club sauce type stoppers in place. 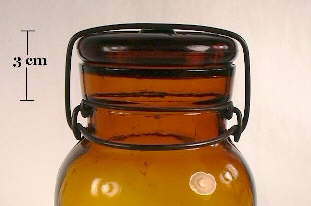 This closure was occasionally used on some larger sized, mouth-blown, patent/proprietary medicine bottles from the late 19th to early 20th century. 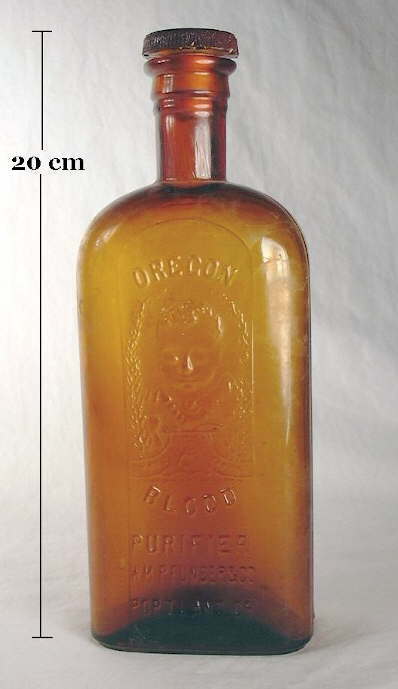 The tooled "reinforced extract" finish to the left with the glass stopper in place is on an Oregon Blood Purifier (Portland, OR) bottle that dates from the 1890s. This bottle has the distinctive and diagnostic cork seat ledge on the inside of the bore. Club sauce type stoppers were uncommon on types of bottles outside of those noted, but were likely used occasionally on virtually any type bottle intended to hold non-carbonated substances. These stoppers are very commonly excavated from sites intact since they have no weak spots to break like the "neck" of the regular glass stoppers noted earlier (Jones & Sullivan 1989). 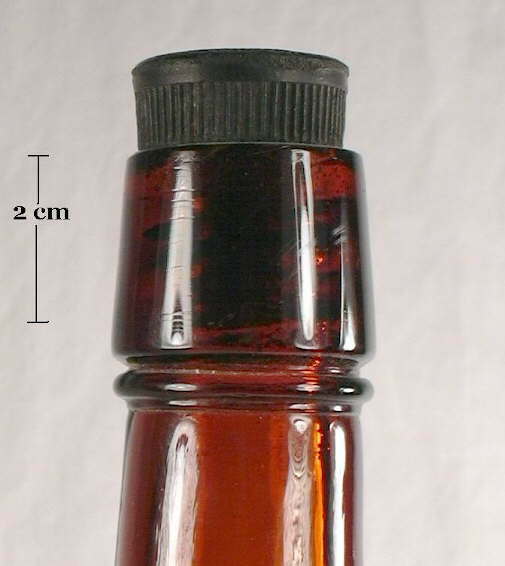 No embossed club sauce type stoppers are known to the author from any product but sauce bottles; all of the stoppers used in medicines and liquor bottles were apparently unmarked. The other relatively common glass and cork combination stopper was the peg stopper. It was similar in application to the club sauce stopper except that the shank was straight (not tapered) and the finial portion was taller and very often ornate. The shank of the peg stopper was frequently molded with ridges or threads in order for the shell cork to firmly attach to the shank. This likely helped keep the shell cork from sticking in the bore of a bottle when the closure was removed. However, some authors believe that the cork was intended to remain in the bore of the bottle with access to the contents achieved by unscrewing the stopper from the cork (Jones & Sullivan 1989). It seems likely that the screw threaded peg stoppers were intended to be pulled out with the cork attached and the smooth shank version intended to pull out leaving the cork behind. The illustration to the left above is from a ca. 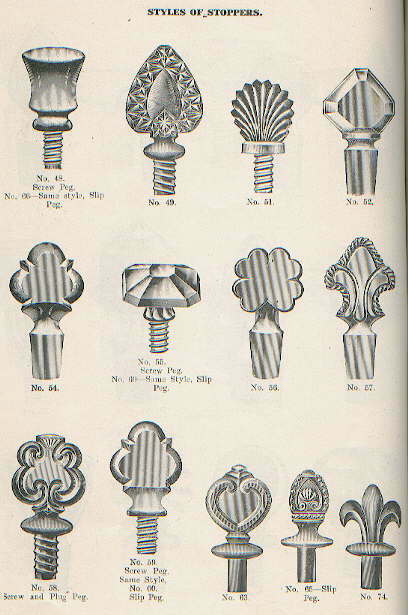 1905-1910 Bellaire Bottle Company catalog showing ornate peg stoppers with both threaded and unthreaded shanks. Click Bellaire catalog page for a full page illustration from the Bellaire catalog which includes peg stoppers, with and without threads, as well as regular ground glass stoppers. Peg stoppers appear to have been most commonly used in toiletry, perfume, and cologne bottles during the late 19th through at least the first third of the 20th century. Click I.G.Co. 1920 catalog page for an illustration from a ca. 1920 Illinois Glass Company catalog that shows some of their relatively ornate peg stoppers and notes their intended use with shell corks. 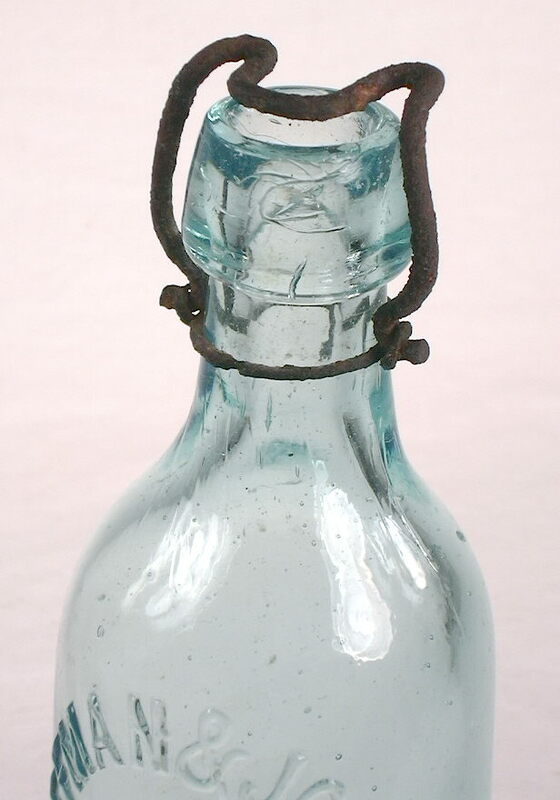 Sprinkler, squirt, and tube tops (called a "sprinkler" closure or stopper here) were a common stopper type on various types of bottles from the mid-19th century up until at least the mid-20th century. 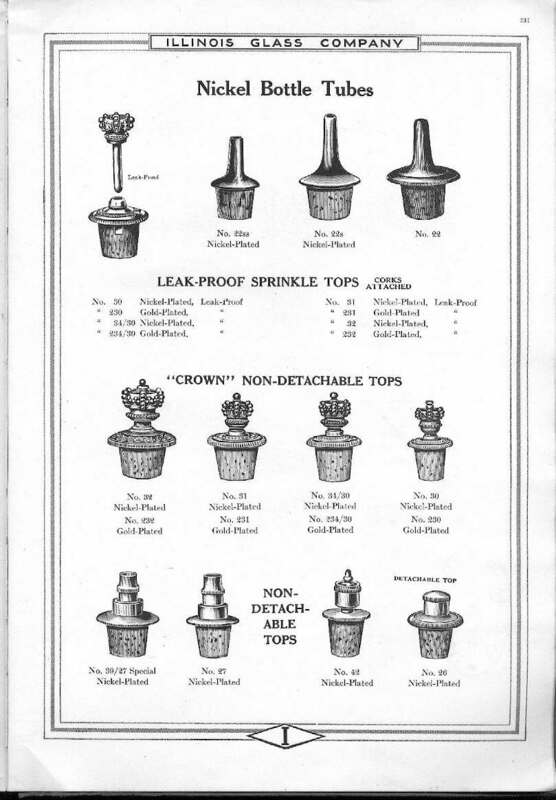 The picture to the right shows several open type sprinkler tops from a 1920 Illinois Glass Company catalog. The sprinkler stoppers are different in design and quite different in utility from the glass and cork combination stoppers noted above. The sprinkler tops were made from metal and did not typically need to be removed from the bottle in order to use the contents; the contents were dispensed through the opening that ran through the entire closure. What the two types of stoppers had in common was that they inserted the same way into the bottle bore and were held in place by a shell cork wrapped stopper shank. Some sprinkler tops were open like the ones to the right; others had various types of caps or closures on the metal top. Click I.G.Co. 1920 catalog page to view an illustrated page of different types and styles of sprinkler tops from the 1920 catalog. These types of closures were used on an assortment of different type bottles including cruets, sauce bottles, colognes, tooth powders, barbers' bottles, and some flavoring type bitters bottles (Jones & Sullivan 1989). 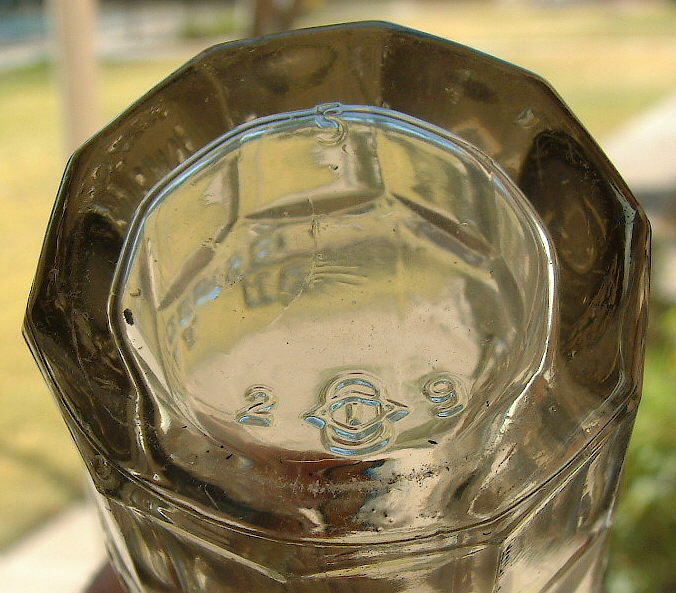 The image to the left is of a sprinkler top in a late 19th to early 20th century mouth-blown barber bottle. Sprinkler tops were not used for carbonated beverages, nor most liquor or wine bottles. Unfortunately, due to the wide span of use, there are no diagnostic dating opportunities related to this type of closure; the manufacturing related physical features of the bottle itself must be used. 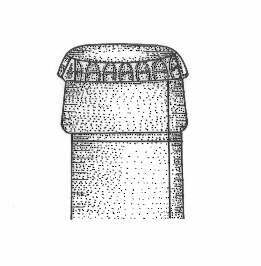 Because of the composition of these type stoppers, they are not frequently found intact on historic sites as they usually deteriorated. 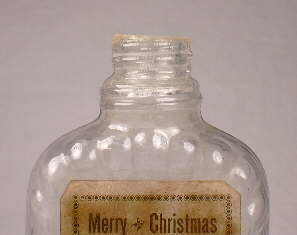 Rubber, wood, paper, wax, corn cobs, and other materials were occasionally used as general closures on bottles, particularly during the earlier portion of the period covered by this website (early 19th century). There is not much to say about them since there is little inherently datable about these materials as closures and most were organic substances that did not survive the ravages of time that a glass bottle will weather with ease. 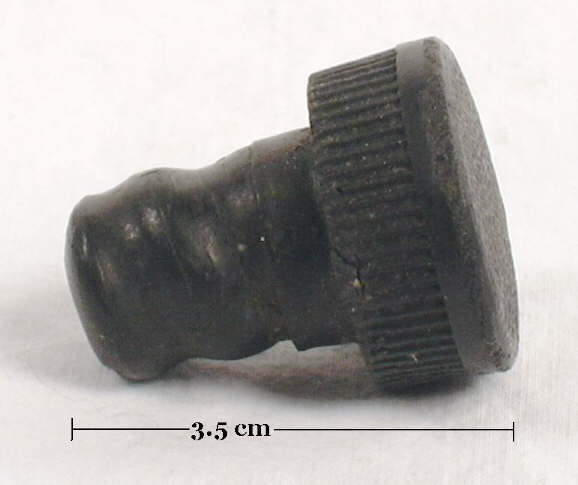 Rubber stoppers are one exception in that they appear to have been primarily used during the first half of the 20th century and possibly even to the present in some specialty situations (chemical reagent bottles). Most notably, rubber stoppers were common in Clorox® and Lysol® bottles during the 1920s and 1930s; bottles that are commonly found in sites that date from the Depression era. Undoubtedly they were used for other products but the information on such is sparse at this time. Click Toulouse's early closures quote to jump back to the brief discussion of early and unusual closures found at the beginning of this "General Closures" section. There were a plethora of other closure types that received some variable application on different types of bottles. 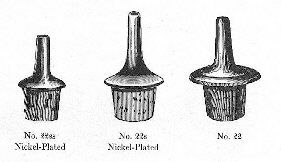 Below are several types of non-threaded metal caps that found varying acceptance and use with some bottle dating related utility. Just be aware that the closures discussed briefly here are but a small sampling of the variety of non-threaded metal closures invented and used during the last couple decades of the 19th century to the middle of the 20th century. There were a wide variety of metal caps used for closures on many types of bottles and jars. Metal caps found particular utility on bottles/jars having a wide mouth or bore in order to access (or insert) the contents, though metal caps of various types were also commonly used for bottles with smaller openings (aka smaller mouth or bore). 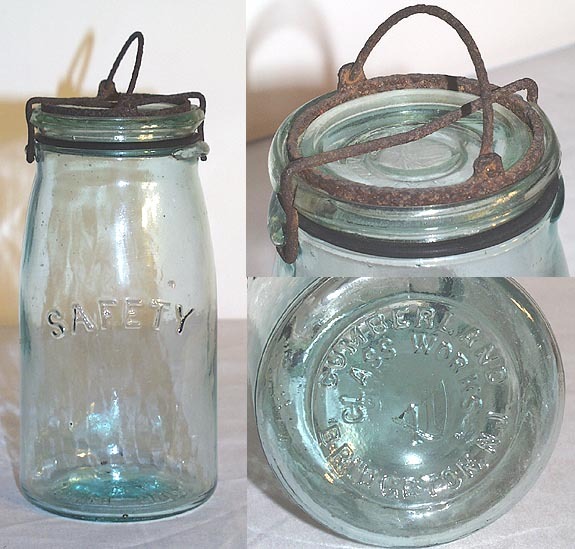 Fruit or canning jars are the most well known type of glass container that utilized metal lids (covered later on this page). Many types of food bottles, ointment jars, some snuff bottles, some medicinals, and occasional other types of bottles utilized metal caps for closure (Lief 1965). The wide variety and very wide time span of use of metal caps (still used today) limits its utility for any dating refinement of historic bottles unless the finish itself was specific to a particular closure that had particular time span of use. Typically however, the manufacturing based diagnostic features of the bottle or jar itself must be interpreted in arriving at an approximate date range. In addition, the metal caps for many 19th and early 20th century bottles/jars are rarely found intact and identifiable on historic sites since the metal usually rusted away unless never buried or discarded in very dry areas like many parts of the American West. Two of the more popular band caps were the Goldy Seal and the Phoenix Cap; both of which are covered later on this page. The Kork-N-Seal cap was a closure designed to provide for the easy resealing of bottled liquid products. 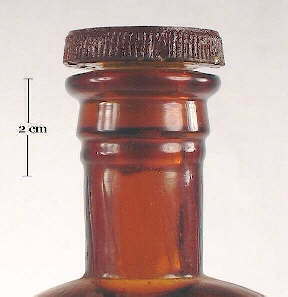 It is essentially a re-usable crown cap, though it was also used in larger sizes that fit bottles with a bore larger than the approximate 5/8" of a crown finish bottle, e.g., 1" and 1¼" (IGCo. 1911; Caniff 2015). The finish rim that typically accepts the Kork-N-Seal cap looks like the upper "bead" part of crown finish. The collar or lower part below the bead varied in shape and was largely decorative as it was not related to the sealing of the cap (Jones & Sullivan 1989). This closure worked by placing the cap on the finish of the bottle and pulling down on the side toggle or lever. This pulled on both ends of a metal wire loop that runs around the entire skirt of the cap, tightening the skirt into the groove underneath the bead (picture below). This closure is also referred to as a "lever" type (Berge 1980). This closure/finish type has been observed on medicine and pharmaceutical bottles, narrow to moderately wide mouth food bottles (like sauces), household bottles (polish, cleaners), liquor and wine bottles, and to a limited degree carbonated beverages - soda and beer. 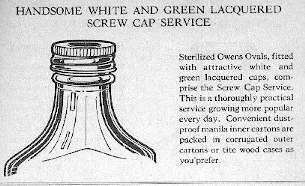 Most products had this cap as the original closure on the bottle with the toggle held down in the sealing position by a wire, string, or possibly a capsule enclosing the cap, finish, and upper neck. Other products did not have it held in place as it was a fairly secure closure and product content tampering was not as much of an issue as (unfortunately) today. 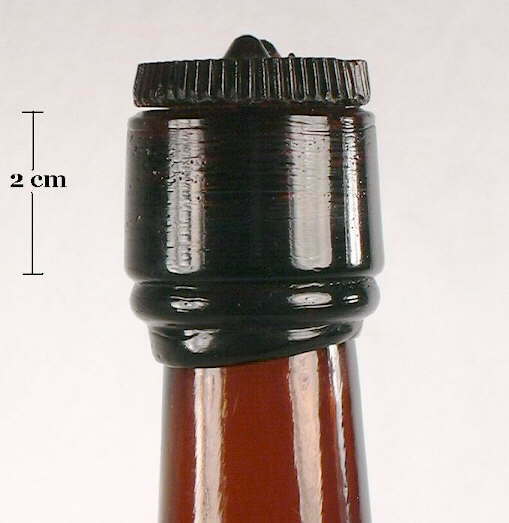 The above pictured Kork-N-Seal caps are typical in shape and function but intended to be used on crown finish beer bottles. These particular caps were not the original cap for the bottled product, but were instead given out as a promotional item for later resealing. It is unlikely that these caps would hold carbonation indefinitely like a crown cap but were adequate for short term use. 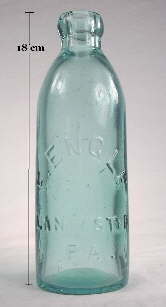 The bottle pictured to the right with a Kork-N-Seal cap in place is an Owens-Illinois Glass Company produced 11 oz beer bottle that was made in 1941 based on the mold codes on the base. The cap is locked into place on the upper portion of the finish. Click Blitz Weinhard Beer (a Portland, OR. brewery) to see the entire bottle which has its original labels. The closure shows up shortly after that time in early 20th century glass makers catalogs (Illinois Glass Company 1911 & 1920; Rock 1990). Click 1911 Kork-N-Seal to see the page from the IGCo. 1911 catalog promoting the "new" closure. Click 1920 Illinois Glass Company catalog to see this finish/closure listed as one of the many "finishes produced by the automatic machine" that company offered (third row from the top, second from left). Click Kork-N-Seal advertisement to view an ad from a 1920 magazine (Literary Digest) that describes and illustrates this closure type made by the Williams Company (Decatur, IL). Click Kork-N-Seal box to see an original box for these closures with several of the caps made by the Williams Company. 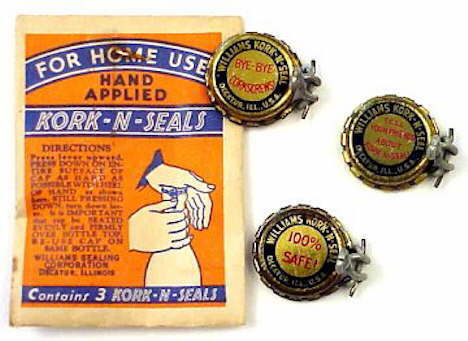 The Kork-N-Seal cap was in use from at least 1911 until possibly the 1960s; it is unlikely to be in use today (IGCo. 1911; Jones & Sullivan 1989; Caniff 2015). Based on empirical observations, the popular period for this closure - and the most likely date range for a bottle with it - was from the mid 1910s to the 1940s. Bottles utilizing this closure are, in the experience of the website author, always machine-made, though with an origin no later than 1911, mouth-blown examples are possible. The Goldy cap (aka Gold Seal) was reportedly invented in 1897 but did not gain real popularity until the standardization of machine-made bottles beginning in the early 1910s (Lief 1965). This closure was quite frequently used on various food bottles during the period from about 1914 through at least the 1940s (Caniff 2008). 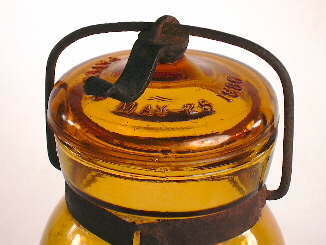 This closure worked similarly to the Phoenix Cap (discussed later on this page and probably more popular than the Goldy on wide mouth bottles/jars) except that the aluminum band which held the cork-lined disk lid in place on the top of the finish was designed to be torn off; the disk lid was usually reusable as a re-closeable cap. The Goldy closure was advertised as "...a tamper-proof vacuum seal with a lug reclosure disc that can't slip or shake off" (Bender 1986; Caniff 2008). The Goldy cap was used on various types and sizes of finishes which usually resembled the upper part (bead) of the crown finish. For example, the Turner Glass Company (Terre Haute, IN.) advertised in the various trade magazines - including The Glass Container (a food packing industry magazine) - showing likely Goldy accepting finishes on their wares. 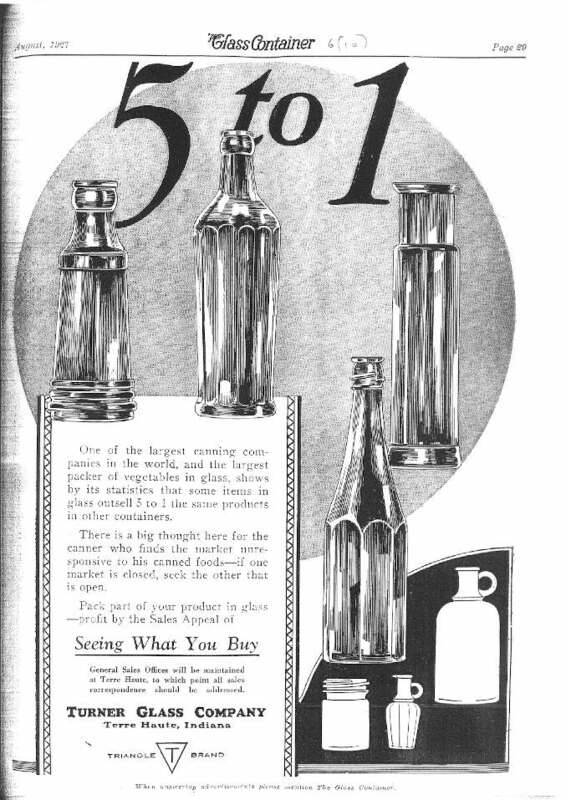 Click The Glass Container - August 1927 to view an advertisement from that year which shows three different illustrations of bottles that almost certainly accepted Goldy caps (no closures shown in ad) including one bottle with a relatively wide mouth (far left in the linked illustration). This indicates that Goldy caps came in different sizes for different size finish diameters although it was most popular with narrow mouth/bore bottles (Caniff 2008). 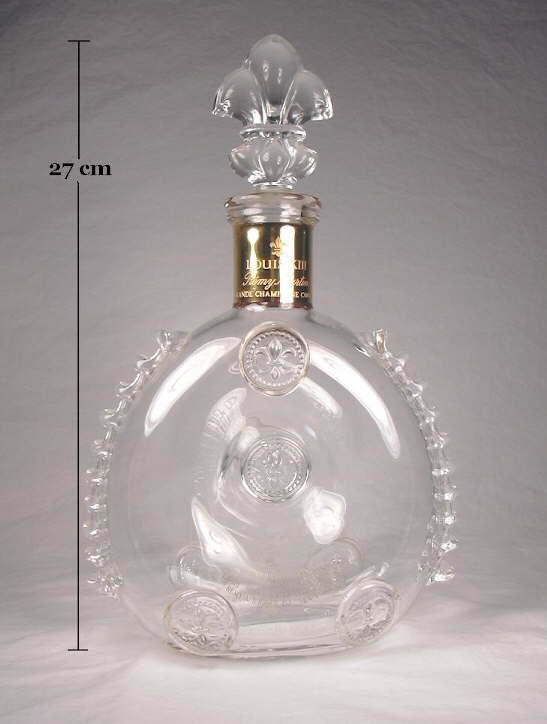 Part of the uncertainty about the bottle specific use of this closure is the fact that many of the bottles that accepted it also accepted a crown cap - like the two paneled bottles in the linked illustration from 1927 The Glass Container magazine above. 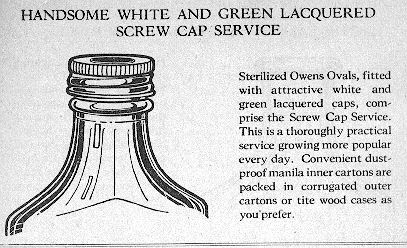 In fact, that trade magazine in 1929 also touted the development of several finishes for catsup bottles which were designed to accept multiple closures including the crown cap, screw cap, and Goldy depending on user desires (Anonymous 1929). These were called a "combination finish" by some glassmakers (Obear-Nester Glass Co. 1922). The finish pictured below right is (or is similar to) one of the multi-closure finishes described and illustrated in the 1929 article as it does accept a screw cap, crown cap, and almost certainly a Goldy cap also. The pictured finish is on a colorless, machine-made Heinz® catsup bottle made by the Illinois-Pacific Glass Company (San Francisco, CA.) in the 1920s. 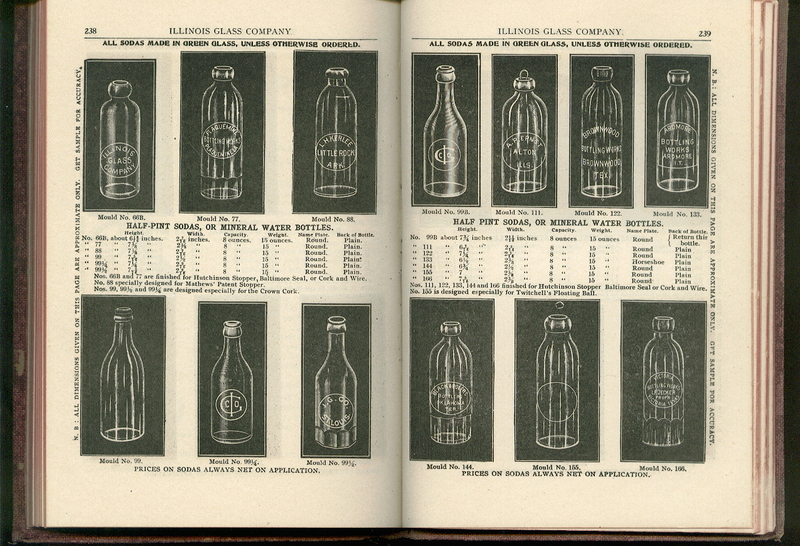 Click 1920 Illinois Glass Company catalog to see an illustration of the "Goldy finish" (no closure shown) which was listed as one of the many "finishes produced by the automatic machine" that the company offered (second row from the top, middle finish). In this illustration, the Goldy finish is almost identical to the already popular crown finish with only a very subtle difference to the upper bead part. The typical re-useable cap apparently worked similarly to Kork-N-Seal since it was for bottles that required resealing but were not carbonated products, i.e., primarily food bottles like catsup. Lief's widely referenced book on the subject - "A Close-up of Closures: History and Progress" (1965) had the following discussion on the Goldy: "Among the caps competing for the food trade, the Goldy (dating back to 1897) won more catsup bottles than the rest. It combined an aluminum capsule and a cork-lined tinplate disc. It opened without instruments, simply by tearing off the skirt that had been punched on the locking bead by a roller arm of the capping machine. The Goldy underwent refinements in the passing years, and spread out into larger sizes. For catsup there also came a double cap; that is a superimposed shell which covered the bottle after unsealing." The illustration above is from Lief's book and shows the band tab being pulled off to access the contents of the bottled product (Courtesy of the Glass Container Manufacturers Institute). This section covers closures that were primarily used only on specific classes or types of bottles. Four categories of bottles have a significant number of specific closure types associated with them - carbonated beverage bottles (soda/mineral water & beer), canning/fruit jars, milk bottles, and to some degree, liquor flasks. No other classes or types of historic bottles have specific closures so closely connected with the category. 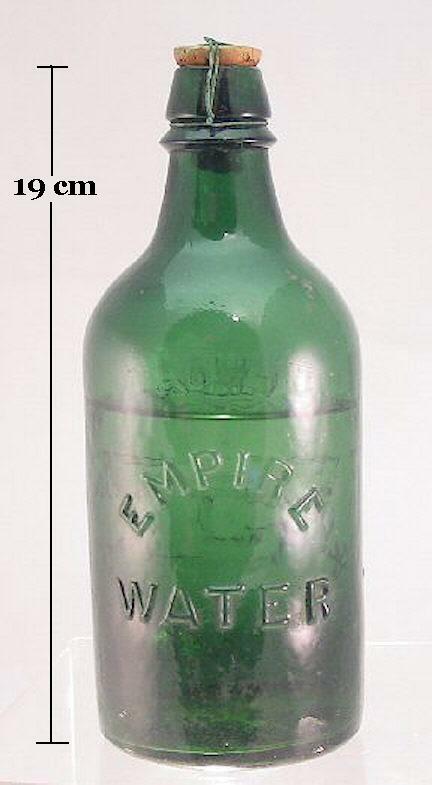 Bottles produced to contain soda, mineral water, and beer all shared one similarity - they were intended to contain a beverage that was typically carbonated exerting high pressure against whatever closure was used. A secure sealing was critical to the salability and usability of the product, as well as typically thick glass to the bottle itself in order to contain the contents pressure and to withstand the rigors of bottling and re-use. 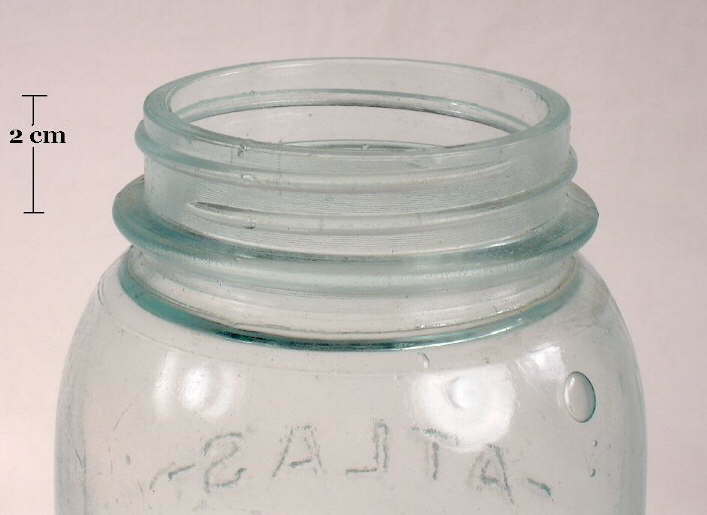 As with the canning jar closures covered next, the handful of closures covered in some detail here were the dominant types and were used on the majority of typical historic beverage bottles. There were scores of different types of closures patented and used to some degree on beverage bottles though most - like James T. Walker's patent (1885) closure pictured to the right - had minimal impact (Graci 2003). The seven primary closures/stoppers covered below (cork, gravitating, Codd's, Hutchinson, lighting-type, bottle seal, crown) likely accounted for 95%+ of the closures used on beverage bottles during the time span covered by this website - 1800 to through the 1950s (empirical observations). For more information and history on the subject of beverage bottle closures the following works are recommended: A History of the American Soft Drink Industry, Bottle Carbonated Beverages 1807-1957 by John J. Riley (1958), A Close-Up of Closures - History and Progress by Alfred Lief (1965), the timeless and venerable The Illustrated Guide to Collecting Bottles by Cecil Munsey (1970), and the very recent Soda and Beer Bottle Closures 1850-1910 by David Graci (2003) which contains dozens of weird and wondrous soda bottle closures as well as the dominant ones. The following closures are covered in order of origin - earliest to most recent. Cork as a general closure method was previously discussed in the "General Closure Types" section earlier on this page and will not be covered again in any depth. 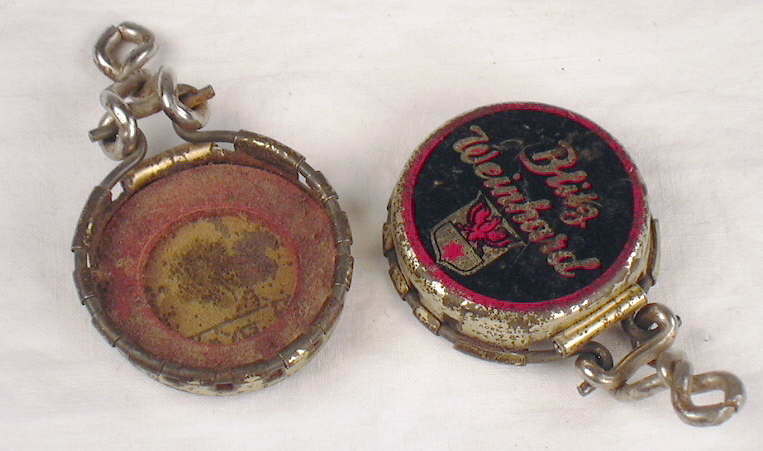 Cork in combination with wire (picture to the left), twine or string, metal retainer (picture below right), capsule, and/or wax was the most common closure method on beverage bottles used during the 1870s and before. With carbonated beverages, some type of cork retaining device was probably mandatory to counteract the internal pressure of the product. Most cork containing devices did not survive on the bottle so one can only speculate as to what held the cork in place on most historic soda/beer bottles with a cork accepting finish. Though cork was effective, most of the early closure efforts by inventers and bottlers were directed at finding a cork substitute (Graci 2003). 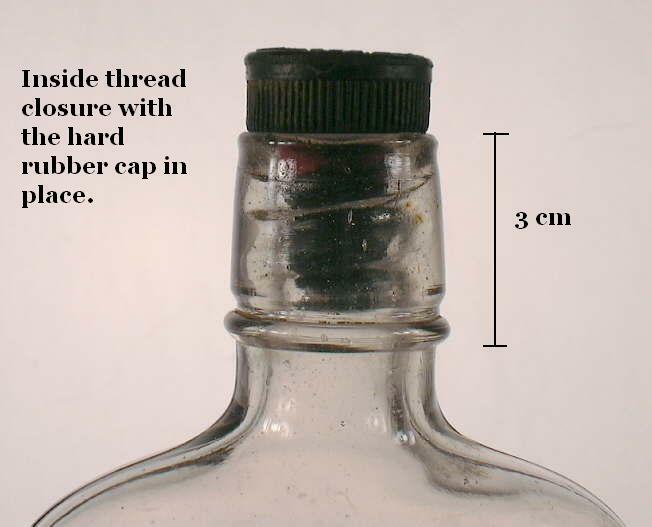 The following three closures (gravitating, Codd, Hutchinson) utilized the internal pressure of the product to assist in the sealing of the bottle. 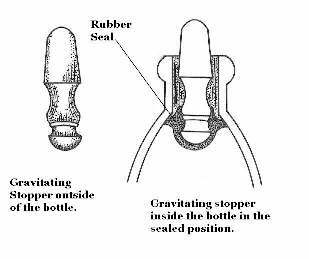 The gravitating stopper was patented on October 11, 1864 by Albert Albertson and assigned to John Matthews, an associate of Albertson's, in 1866. This closure was apparently first put into use in 1867 or 1868 (Riley 1958). It consists of an elongated glass plug with a flared knob on one end. 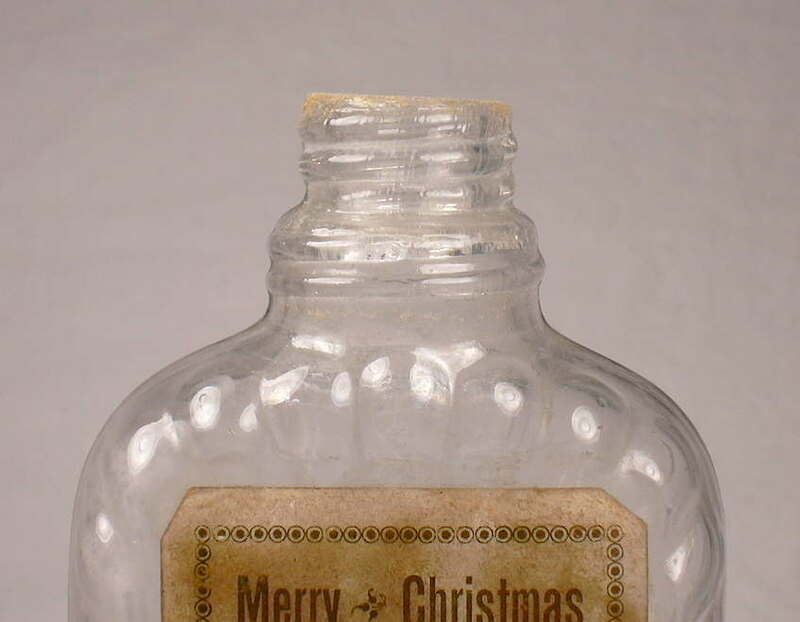 A rubber gasket was placed on the upper end of the knob which when placed in the bottle sealed the contents by pressing against the inside surface of the bottle at the juncture of the neck and shoulder. The bottle was "...filled in an upright position, then inverted so the stopper would gravitate into closed position, and be held there by the inside pressure when the bottle was removed (from the filling machine)." The Matthew's Patent noted that the stopper could be made of "...glass, hardwood, or other suitable material..." though it is likely that glass was by far the most commonly used material (Bender 1986). 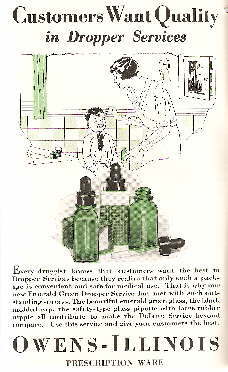 The illustration to the left shows the stopper separately outside and inside a typical bottle. The photo to the right shows the base of a Matthew's patent bottle with the 2.1" long stopper (without the rubber sealing ring) in front. The pictured stopper is embossed in tiny lettering with what appears to be the following: PATENTED / A. G. 26 1862 / OCT. 11, 1864 / APRIL. 15, 1873 (some of the embossing is very hard to read). Click Matthew's stoppers for a picture of several of the glass stoppers minus the rubber sealing ring which would have been on the narrow flared "knob" end (top end as shown in the picture). These bottles were opened by pushing down on the head of the stopper to release the pressure which allowed the stopper to sink to the bottom of the bottle and the contents to be accessed. The stoppers were removable from the bottle for cleaning and reuse and to replace the gaskets as necessary. The base of most (but not likely all) bottles that used this closure are embossed as follows: GRAVITATING STOPPER / MADE BY (around the outside edge of the base) JOHN MATTHEWS / NEW YORK (inside the first ring of embossing) PATD / OCT 11 / 1864 (in the middle). Click gravitating stopper bottle base to see a close up picture of the embossing found on the base of these bottles (picture is of bottle to the right). The embossing is also shown behind the stopper in the image below. Because of this base embossing many people assume that Matthews was the patentee. However, Albert Albertson was the patentee and Matthews "...genius lay in forceful marketing ideas" in gaining acceptance and widespread use of this closure and the equipment to enable its use (Graci 2003). 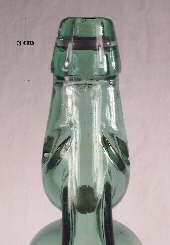 Soda bottles that took this closure type are early enough that the ones noted by the author have a true applied blob finish. All of the marked gravitating stopper bottles that have been noted by the author of this site were shaped like the bottle to the left (F. Engle / Lancaster, PA.) with relatively gently sloping shoulders. Early advertisements for "Matthews' Improved Gravitating Stoppers" were illustrated with bottles of this precise conformation and it appears that the sloping shoulder best facilitated the proper sealing of the closure (Graci 2003). However, bottles with this shape have been found with a Hutchinson stopper in place (covered later). 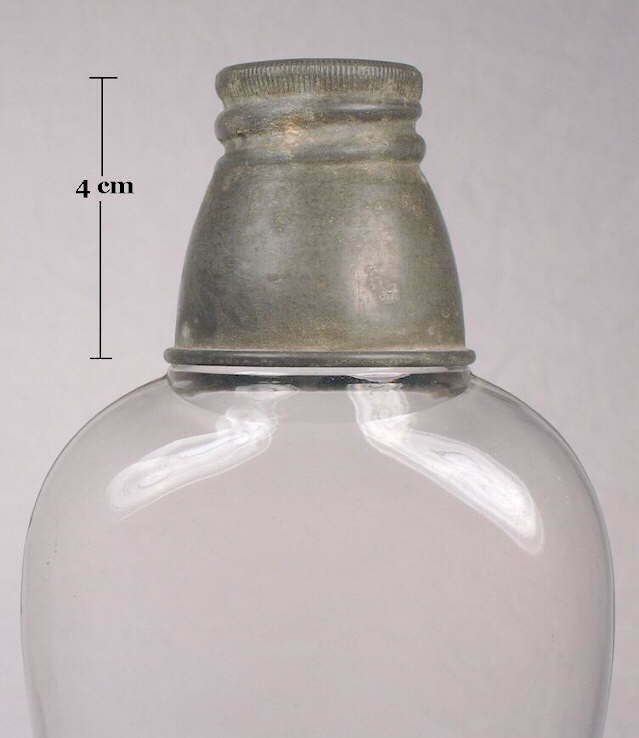 So unless embossed with the "Gravitating Stopper..." wording on the base or with the stopper inside or in context with the bottle, one can not be absolutely sure which closure this style of bottle originally had. 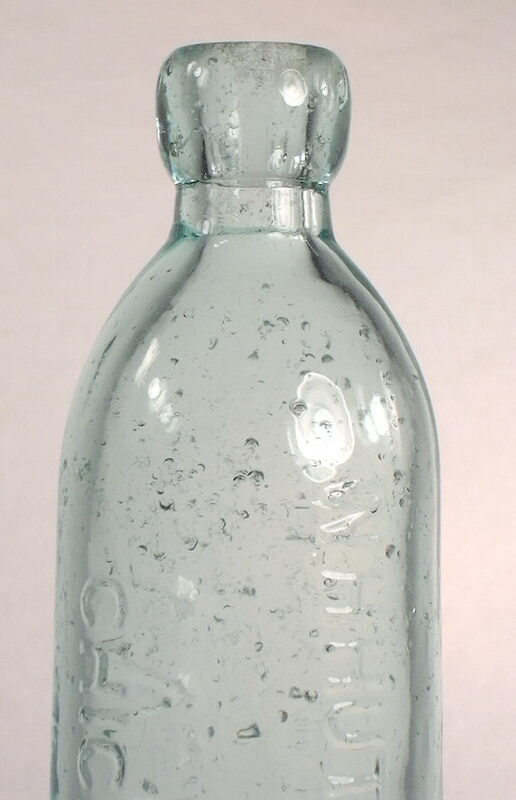 It is also likely that some of these type bottles originally started out with gravitating stoppers, but since soda water bottles were typically reused for many years, they may have later been used with the new Hutchinson spring stopper. 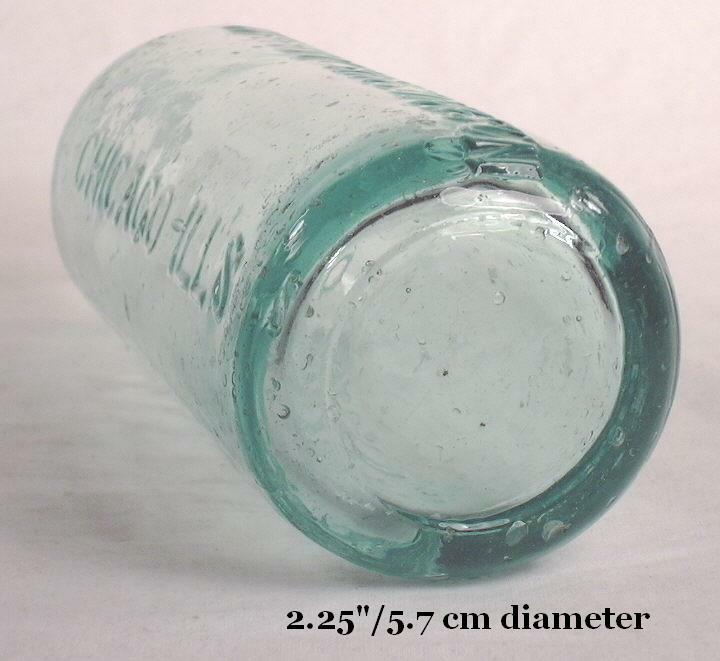 One additional note: This style of bottle was actually still being listed in the Illinois Glass Company catalog as late as 1908 with the notation that their mold number "88" was specially designed to accept the "Mathews (sic) Patent Stopper" (IGCo. 1908). Click IGCo. 1906 catalog - page 238 to view the similar page for the same bottle type from the 1906 IGCo. catalog. Mold number "88" is listed on the page in the left side of the image. 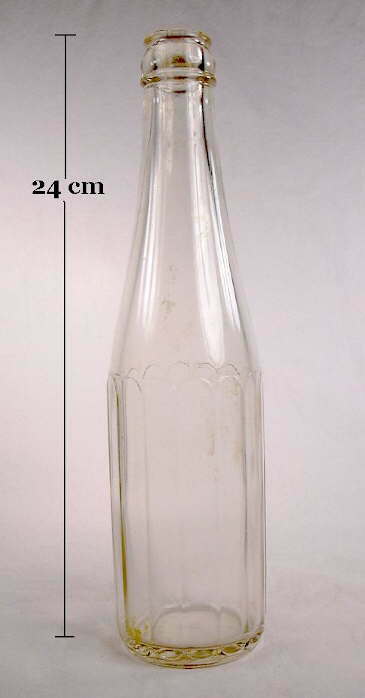 Dating Notes: These bottles, with and without the "Gravitating Stopper..." embossing on the base, were made by various glass companies between the late 1860s through the 1880s (Feldhaus 1986; Peters 1996; Markota 2000). 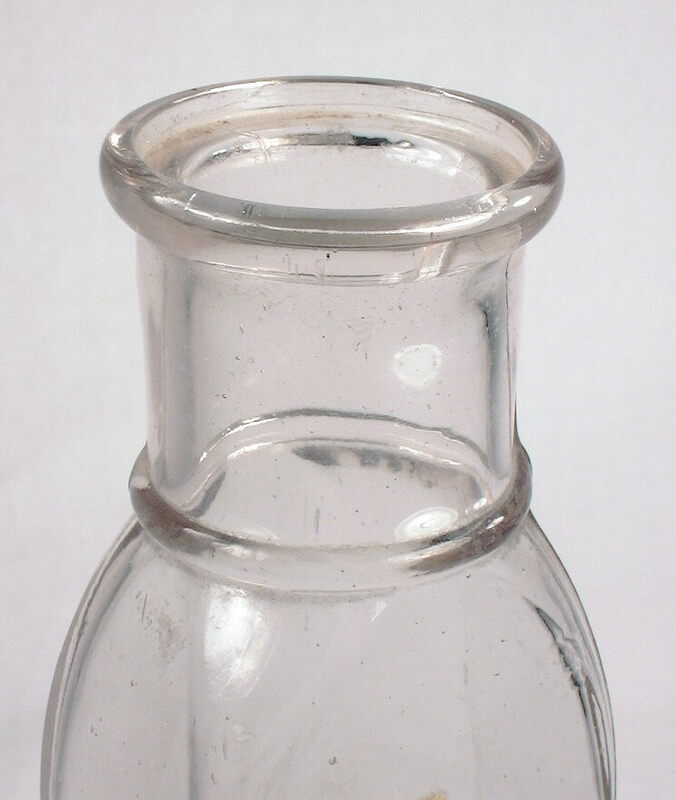 By the mid-1880s, the Hutchinson stopper in bottles with a somewhat more abrupt shoulder began to dominate the soda bottle market and the gravitating stopper appears to have faded gradually from common use. However, as noted above, gravitating stopper bottles were still being offered as late as 1908, though bottles that conclusively date that late date have not been noted. 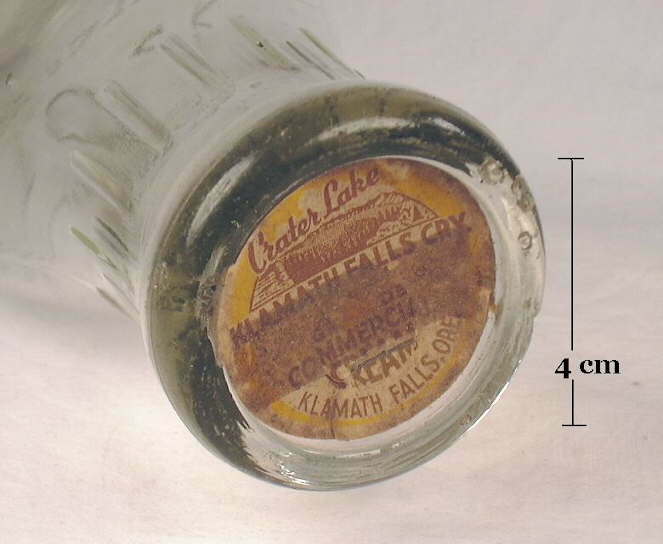 Although Matthew's gravitating stopper bottles were never as common as other types of bottles/closures during the time frames noted, they nevertheless were used by soda bottlers across the continental U.S. and Hawaii. The Codd ball stopper was by far the most successful of an assortment of internal ball type stoppers for soda bottles patented during the second half of the 19th century. It was first patented in England in 1870 with the patents for the most commonly seen form issued in 1872 and 1873; it was patented first in 1873 in the United States (Munsey 1970; Goodacre 1995). Most of its success was, however, in England or its Commonwealth nations like Canada, India, and Australia. This closure & bottle style was infrequently used by American soda/beer bottlers, primarily due to stiff competition from the Hutchinson closure/bottle, and may never have actually been produced in this country, though a few other non-Codd ball types were made here (Riley 1958; Graci 2003). Reportedly, part of the reason for its lack of success in the U.S. was because American kids had a tendency to break the bottles to get at the internal marble for their youthful games, though this must have occurred in other countries also (Lief 1965). For an image of a much less successful competitor that also utilized a ball for the closure mechanism, click on Roorbach bottle which shows a Hutchinson type bottle that used the Roorbach ball stopper. The bottles were produced by a method that required the use of an applied finish until well into the 20th century which is long after virtually all other bottle types were being mouth-blown with tooled finishes. According to one author the mouth-blown bottles were produced as follows: After being mold blown the bottles were sheared at the neck and allowed to cool. Then a glass marble, made from glass of a hardness twice that of the bottle was dropped into it. The bottle was then re-heated and the neck welded on (finish applied), so containing the marble (Goodacre 1995). Eventually fully automatic bottle machines were adapted to produce Codd bottles (example pictured to the right). 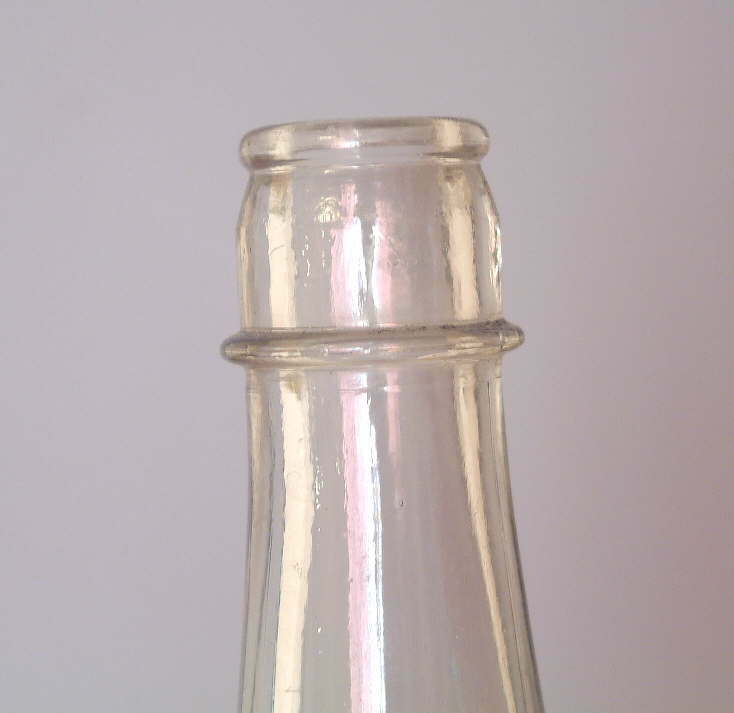 This type of internal ball closure was self-sealing via a rubber gasket mounted inside the bore of the bottle against which the marble was pushed firmly by the carbonated contents. The contents were accessed by pushing down on the marble to release the pressure after which the marble dropped to the lower part of the neck. Click Codd opener for a picture of a tool used to push down the marble and open Codd bottles. The illustration to the left shows the upper portion of a Codd bottle with the marble in the sealing position inside the bore. The photo to the right shows a late 20th century, machine-made Codd bottle from India with the gasket in place in the middle of the finish and the marble in the unsealed "resting" position low down in the neck. During the mid-20th century most of the English machinery to produce Codd bottles was shipped to India where the bottle may still be produced (Goodacre 1995). This side view of a Codd bottle also shows why these bottles were and still are sometimes called an "elephant" or "pig" bottle (Elliott & Gould 1988). Some resemblance I guess? Dating notes: As noted, the Codd closure was always a minor element in the American soda bottle/closure market. Hutchinson closures followed by the crown closure (both covered below) were far and away the most popular sealing methods for soda and mineral water in the U.S. One researcher has, however, tallied 25 or so different Codd bottles that are identifiable as used by American companies spanning the country (Graci 2003). In Hawaii, the state where soda companies used the Codd closure the most, there were at least 14 different Codd or Codd type bottles used by 4 different companies between 1884 and 1898 (Elliott & Gould 1988). It is not known how many American soda companies used unembossed Codd bottles with proprietary labels attached, though it likely a very low percentage compared to the Hutchinson and crown closure bottles. The general date range for the mainland American use of the Codd closure is probably similar to the date range in Hawaii, though it is known that some Codd bottles were used into the early 1900s by some companies in the West. 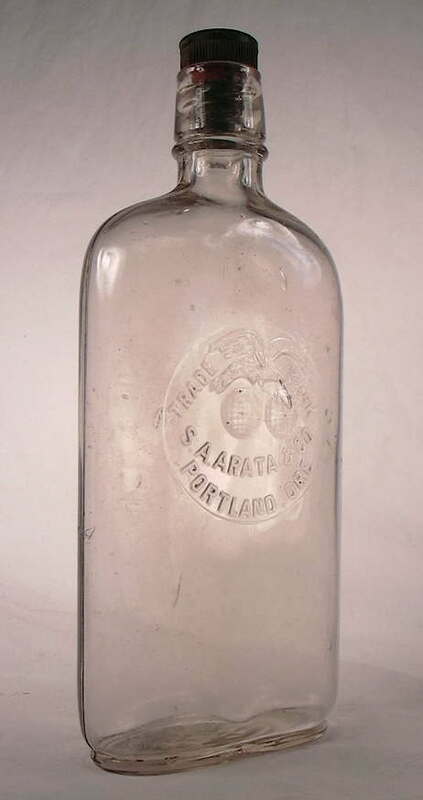 For example, one Western embossed Codd bottle (Biggam Bros. / Yakima, WA) is known to date between from 1911 and 1913. 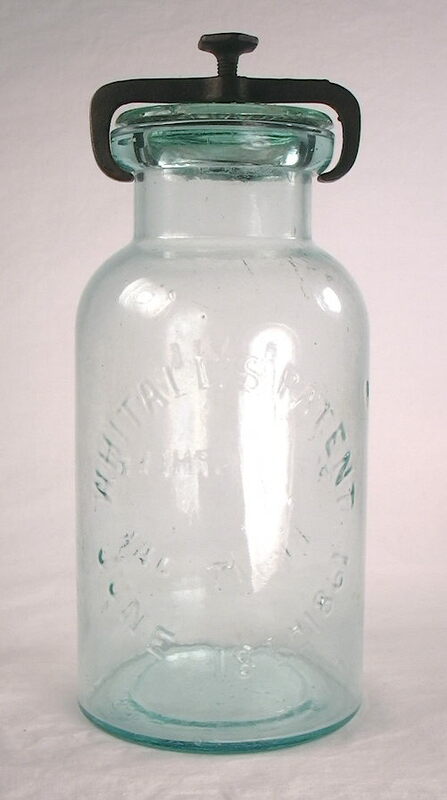 These bottles were marked as having been manufactured by Nuttall & Co. - a glass works in St. Helens, Lancashire, England which was merged out of existence in 1913 (Fowler 1986; Whitten 2005). A good cut-off date for Codd closures in the U.S. is the mid 1910s (Newman 1970). 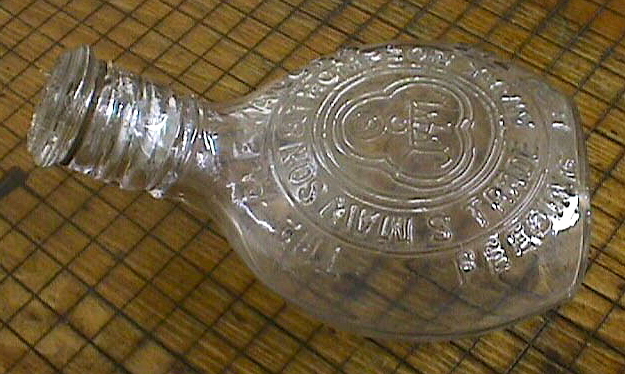 Worldwide, Codd bottles were used for an immense range of time from invention in the early 1870s to the late 20th century, as indicated by the pictured bottle above which is machine-made and has as base sticker noting it was Made in India. It was purchased new from an import store around 1990! The Hutchinson stopper was patented in April of 1879 by Charles G. Hutchinson and fairly quickly made cork closured soda bottles obsolete. This was visually portrayed by a humorous 1880s advertisement from the Hutchinson company which portrayed the Hutchinson as a boxer knocking out multiple contenders, all of which were soda bottles with "other" closures. Hutchinson's "boxing gloves" were the flat end of the stoppers (Graci 2003). 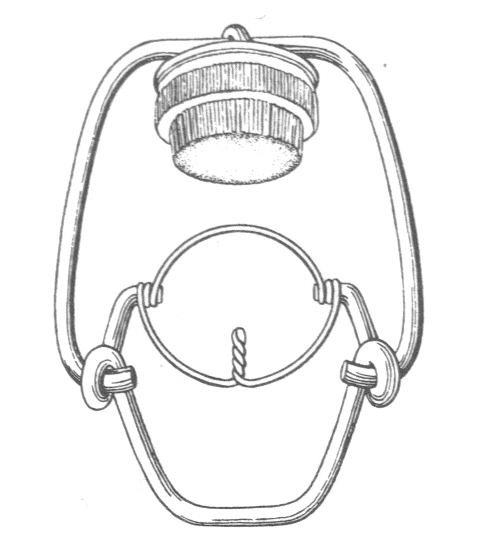 The Hutchinson spring stopper consisted of a rubber gasket that was held between two metal plates which were both attached to a wire spring loop. When inserted into the the bore of a bottle the lower gasket/plate portion hangs just below the short neck/shoulder interface with the upper portion of the wire loop extending just above the top of the finish rim. The internal pressure of the soda held the plate/gasket against the inside of the bottle sealing the product (Elliott & Gould 1988). The closure is shown in the cut-away illustration to the left which is in the sealed position (illustration courtesy of the Glass Container Manufacturers Institute). The contents were accessed by pushing down on the top of the wire spring loop which released the pressure and opened the closure. When pushed down slightly to open, the stopper stayed in place - i.e., did not drop to the bottom of the bottle - due to the indentations on each side of the spring handle. One of the benefits of the Hutchinson stopper - besides effectiveness - was that it was cheap to produce selling for $2.00 to $2.50 per gross in 1890 (Munsey 1970). The design of this closure gave rise to a new type of soda bottle - the Hutchinson soda bottle - with its very short neck and sharply defined shoulder which ranged from moderately sloped (illustration to the left and photo to the right) to almost perpendicular to the neck (pictures below). 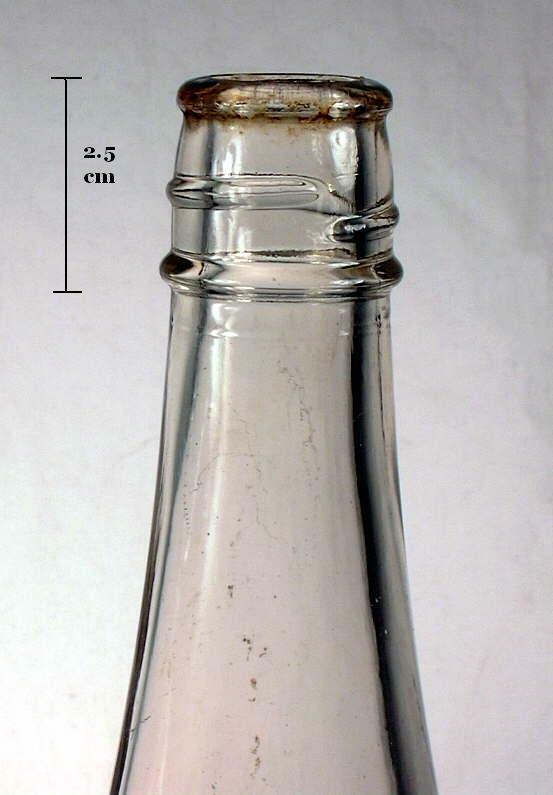 This style of soda bottle was produced by scores of different glass companies as indicated by the presence of many scores of different makers marks on these bottles (Fowler 1981 & 1986; Feldhaus 1986; Elliott & Gould 1988; Peters 1996; Markota 2000). Though used primarily for soda water, Hutchinson type bottles were on occasion used for beer, primarily east of the Mississippi, as evidenced by the occasional embossed bottle that has a brewing company name on it. Click Fla. Brewing Co. to see an example from Tampa, FL. There were numerous competing types of internal spring stoppers similar to the Hutchinson - most notable being the "spring swivel stopper" and the "Parkhurst" (both of which were almost identical to the Hutchinson) - though the "Hutchinson's Patent Spring Stopper" made by W. H. Hutchinson & Son (Chicago, IL.) dominated the market (Riley 1958; Paul & Parmalee 1973; Firebaugh 1983). The certain Hutchinson closured (stopper missing) bottle pictured to the right is embossed with W. H. HUTCHINSON & SON / CHICAGO ILL'S - W. H. H. and was presumably a salesman's sample used by this company to demonstrate their revolutionary closure, though this could also have been a generic bottles sold by the company which offered a wide array of "bottlers supplies" (Paul & Parmalee 1973). The "SON" in the embossed title is the inventor of this closure - Charles G. Hutchinson. 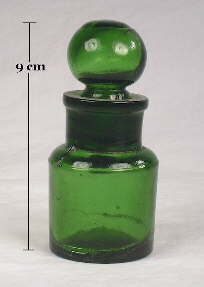 Note the similarity of this bottle to the gravitating stopper bottle pictured earlier; either of the two closures could have been used in bottles of this shape as noted in the "Gravitating Stopper" discussion above. Click on the following links for more images of this bottle: base view; close-up of the shoulder, neck and blob finish. The Hutchinson stoppers' main drawback was that it was internal with eventual cleanliness issues raised involved the re-use and cleaning of the bottles. 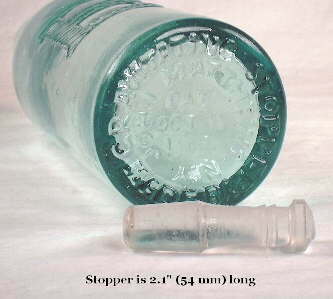 Bottlers did not always replace the stopper when reused and hygiene complaints began to be aired during the activist era of the early 20th century (Collins 1969; Fowler 1986). However, the primary "problem" with this closure was the invention (1892) and gaining popularity (early 1900s) of the crown cap - especially as the mechanized era of bottle production ramped up allowing for a more consistent and reliable product. The crown cap and bottle machines are what really sealed the doom of the Hutchinson; the crown cap is covered later. The tooled blob finish (below right; bottle to the left) with the Hutchinson stopper in place is on a Mt. Hood Soda Water (Portland, OR.) 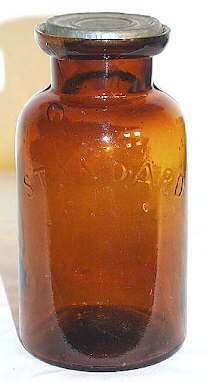 bottle that dates between 1904 and 1906 (Fowler 1981). 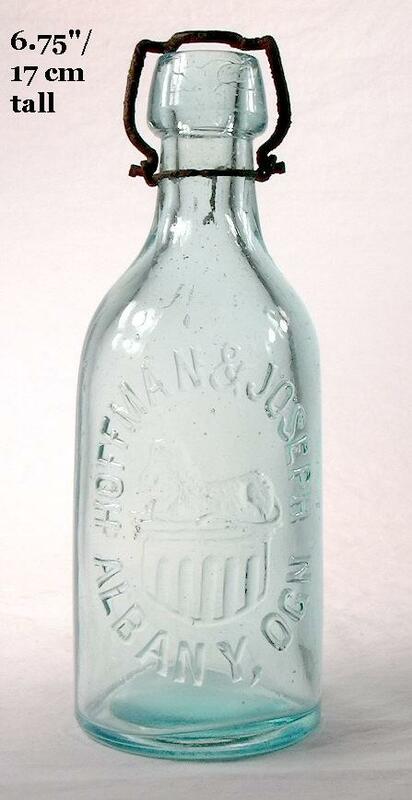 The base of this bottle has an "H" marking which is believed to be the mark of the Holt Glass Works, which was destroyed by the April 18th, 1906 San Francisco earthquake (Toulouse 1971; Thomas 1998). 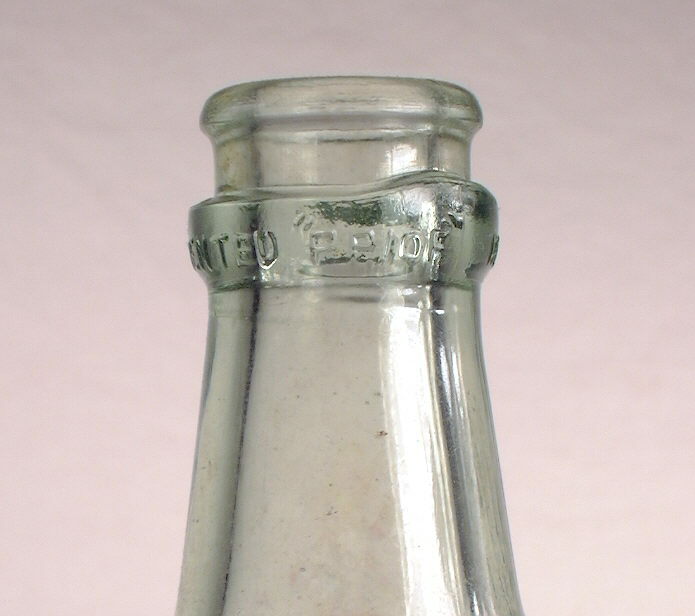 This soda bottle dates from the apex of popularity for this closure type as the crown cap was rapidly making in-roads into the soda and beer closure market in the first decade of the 20th century. Between the mid-1880s and about 1905, the Hutchinson closure was probably the most common closure found on American soda bottles. One researcher has cataloged almost 17,000 uniquely different company/city embossed Hutchinson soda's attesting to the popularity of this bottle style and closure - and not every soda producer had proprietary bottles made for them. 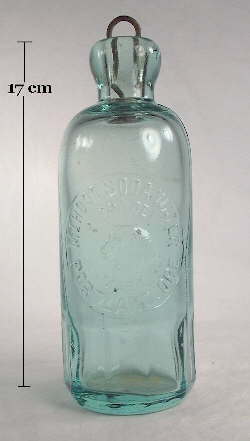 Many used unmarked bottles to which they applied their own cheap labels, although the proprietary embossed Hutchinson soda bottle was actually (unlike most other bottle classes) more the rule than the exception (Fowler pers. comm. 2010). Dating notes: True applied finishes on Hutchinson soda bottles date the bottle from about 1880 to 1885. Applied finishes on Hutchinson bottles are relatively uncommon. Tooled finish Hutchinson bottles date from the mid to late 1880s to the effective end of production for this style in the mid 1910s, with most bottles dating between the late 1880s and 1912. It is estimated that at least 90% of Hutchinson bottles have tooled finishes dating them in this range (Elliott & Gould 1988; empirical observations). Between 1900 and 1915, tooled crown finish soda bottles slowly but surely began to dominate the market and by 1915-1917 most soda bottle production was machine-made bottles with crown cap finishes (Fowler 1981 & 1986; Feldhaus 1986; Elliott & Gould 1988; Peters 1996; Markota 2000; Lockhart pers. comm. 2003). The W. H. Hutchinson & Sons company ceased production of the stoppers in 1920 by which time production was almost totally to supply those few bottlers still using Hutchinson sodas made some year before (Elliot & Gould 1988). (Note: Some references list 1912 as the end date which seems unlikely since the Illinois Glass Co. was still listing over 40 different molds for Hutchinson style soda bottles in 1911 [IGCo. 1911; Munsey 1970]). As a side note, there is some possible dating information related to the subtly varying conformation of blob finishes on Hutchinson sodas. Elliott & Gould's 1988 book entitled "Hawaiian Bottle of Long Ago" suggested the possibility of some dating refinement based on subtle shape characteristic patterns to Hutchinson blob finishes. Although suggested for Hawaiian Hutchinson soda bottles, it would have some application elsewhere since all Hutchinson soda bottles used in Hawaii were imported - mostly from the U.S. mainland. As an example of this dating potential the blob finish pictured just above was classified by Elliott & Gould as a "funnel top" since the finish itself is somewhat "funnel-like" in its taper from top to bottom. They note that this style was used on Hutchinson soda bottles dating from 1905 or after - a date that fits well with the company related history noted earlier. The Lightning toggle or swing-type closure was previously discussed in the "General Closure Types" section earlier on this page; click General Closure Types to move back to that section for more information. 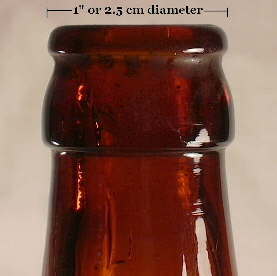 Besides fruit jars, this closure was fairly common on soda bottles but received its most widespread use on beer bottles. An illustration of the closure by itself is to the left (illustration courtesy of the Glass Container Manufacturers Institute). The Lightning closure was a secure, long lasting stopper and for that reason did (and does) enjoy popularity. Dating notes: In general, Lightning-type closures were popular on soda and beer bottles between the late 1870s to at least National Prohibition in 1920. After that time use was limited on beverage bottles; the crown cap dominated by then. The peak of use on soda bottles was the mid-1870s to early 1890s though some use was made at least until 1911 (Elliott & Gould 1988). 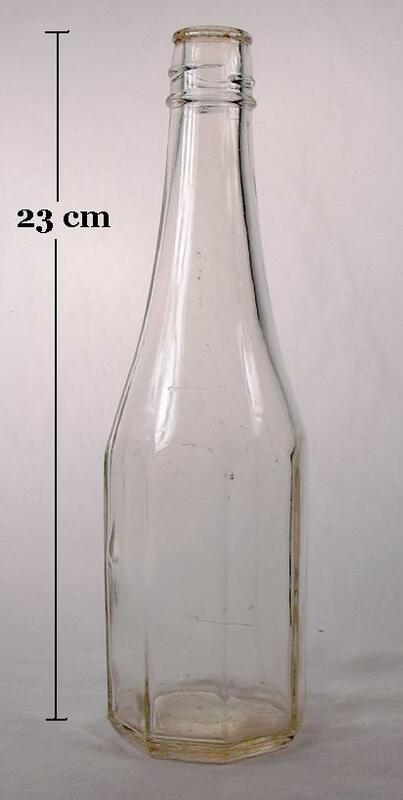 For beer bottles, where this closure was as dominant as the Hutchinson closure was for soda bottles, the peak use period was wider than for sodas - about 1880 to the early 1910s (Feldhaus 1986; Elliott & Gould 1988). The picture to the right is of a Lightning closure with a metal stopper on a Buffalo Brewing Company bottle (Sacramento, CA.) with a tooled blob finish that dates between 1890 and 1902; right in the middle this closures popularity (Toulouse 1971; Groff 2002). 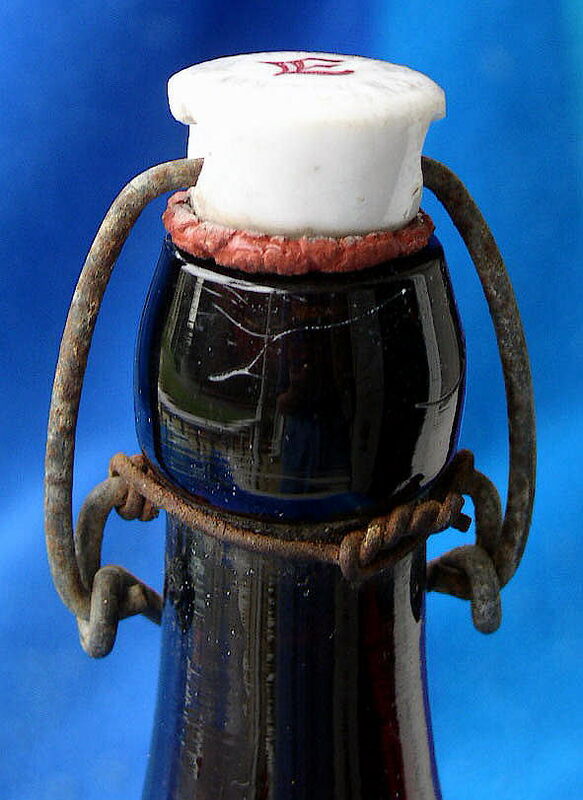 The beauty of most Lightning-type closures was that it could be attached to just about any type beverage bottle being made at the time and found particular utility as a transitional closure for soda bottles between corks - since it could be used on the previously cork stoppered bottles - and the Hutchinson closure/bottles which dominated the soda bottle market by the late 1880s (Elliott & Gould 1988). 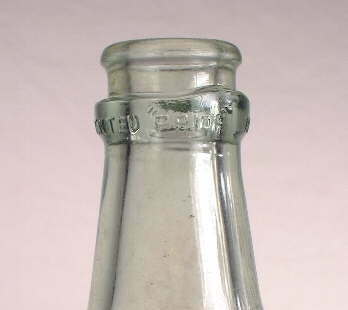 People being slow to accept change, Lightning-type closures were used well into the 20th century on some beverage bottles. 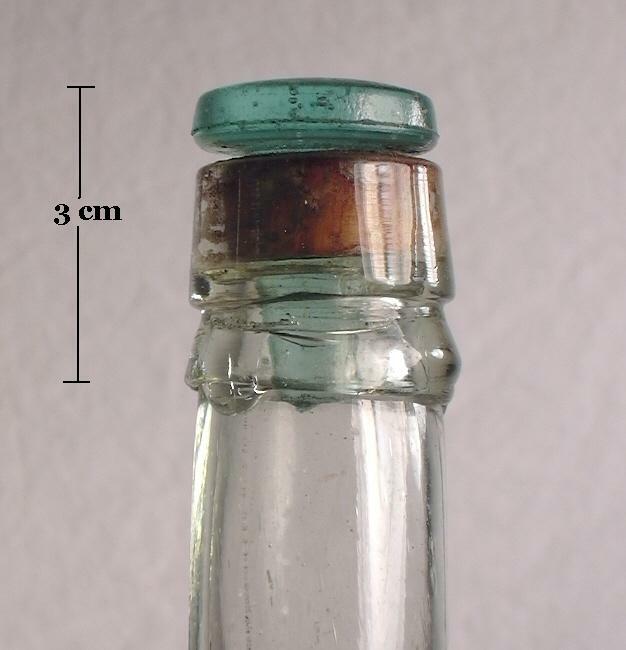 It is not uncommon to find early 20th century crown cap finish soda and beer bottles with Lightning-type closures on them since it usually would work in lieu of a crown cap. However, by the mid 1910s, the crown cap finish on machine-made bottles dominated all beverage bottles. 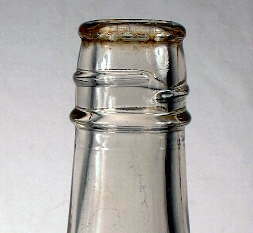 Lightning-type closures continue to be used in modern times by some beer and soda companies (primarily overseas) and bottles with this closure are still sold for use by home brewers to bottle beer, cream soda, and root beer. 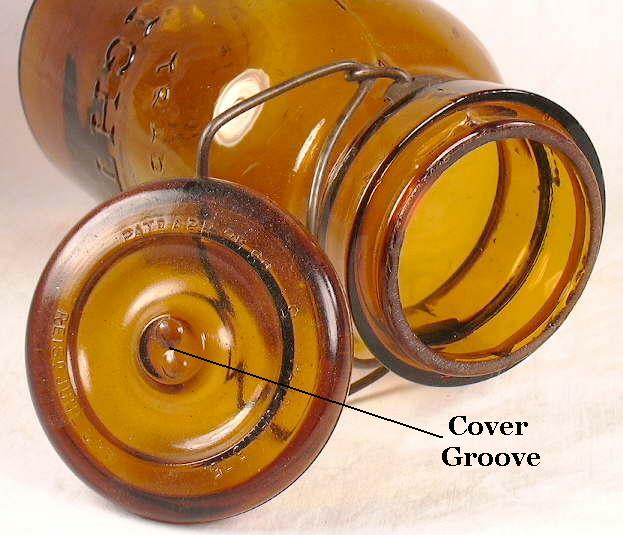 Lighting-type closures used on beverage bottles since the mid-20th century were primarily anchored using dimples in the side of the finish instead of the neck encircling wire circle just below the finish (see the discussion in the "General Closure Types" section above). This functional and fairly popular closure was patented by William Painter, a Baltimore machine shop foreman, in September of 1885. Click Painters Baltimore Loop patent #327,099 to view this original patent ( U. S. Patent Office 1885). Painter called it the "Baltimore loop seal" though it was usually referred to simply as the "bottle seal" (Riley 1958; Munsey 1970). The closure itself is a plug or disk made of rubber or other flexible material with the bottom surface convex shaped. The disk fit tightly into a groove ("reverse taper") circling the inside of the bottle's bore. Internal pressure from the carbonation pressed against the convex surface resulting in lateral pressure which held the disk firmly in the groove. An imbedded wire shank in the top of the disk was used, in conjunction with a hook or pointed instrument, to pull the seal from the bore of the bottle and access the contents. Thus, the alternative name of "loop seal" for this closure. Painter produced and provided the tools to glassmakers that formed the reverse taper inside the bottle finishes (Riley 1958; Lief 1965). The various patents related to the closure disk itself were granted over the period from 1885 (the original bottle seal patent linked above) into the early 1890s (for improvements to the closure) , possibly indicating that the popularity of this closure/finish was more towards the late 1880s to early 1890s period (U. S. Patent Office 1885, 1891). Click Painters Loop Seal Patent April 7, 1891, #449,822 to view the latter patent for improvements to the closure. 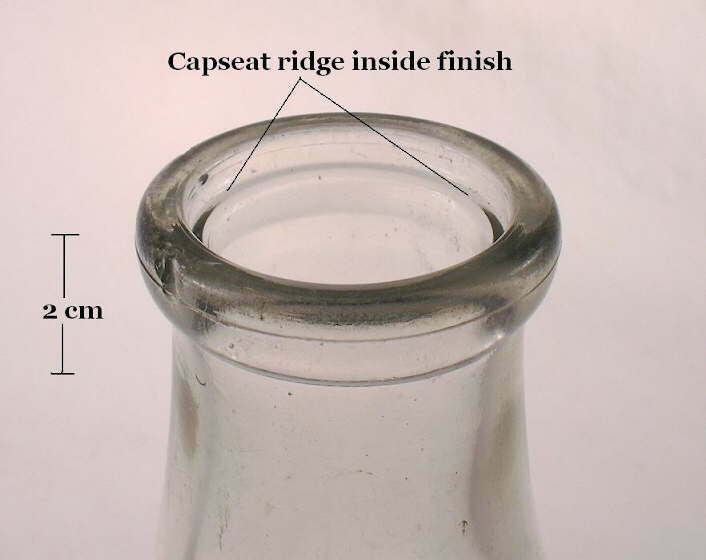 The illustration to the left shows a cut-away view of the bottle seal finish and the actual closure cap (illustration courtesy of the Glass Container Manufacturers Institute). The "reverse taper" inside the bore of the finish is apparent in the illustration. 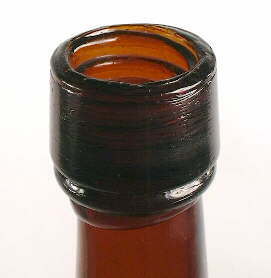 The photo to the right shows a beer bottle finish with the typical "look" of a bottle seal groove within a tooled blob finish. This particular bottle is from the Northwestern Brewing Company, Chicago, ILL. which operated under that name between 1888 and 1909 (Bull, et al. 1984). The base of the bottle has the makers mark "S. B. & G. Co" which stands for Streator Bottle & Glass Company (Streator, IL.) 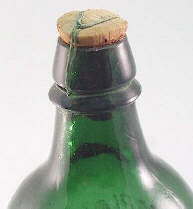 which used this mark between 1881 and 1905, giving a date for this bottle between 1888 and 1905 (Toulouse 1971). Based on manufacturing based diagnostic features, this bottle could date anywhere within that range. The bottle seal was considered the first "single use" bottle closure, since it could not be reused - though corks could always be thrown away also (Lief 1965). It was adopted by the Moxie beverages firm - the first mass marketed soft drink - and used on their bottles for some years in the late 19th century (Munsey 1970). A big attraction of this closure, besides the sanitary benefit of single use, was that it was very inexpensive. The disks cost only 25 cents per gross versus $2.00 or more for the Hutchison closures (Riley 1958). 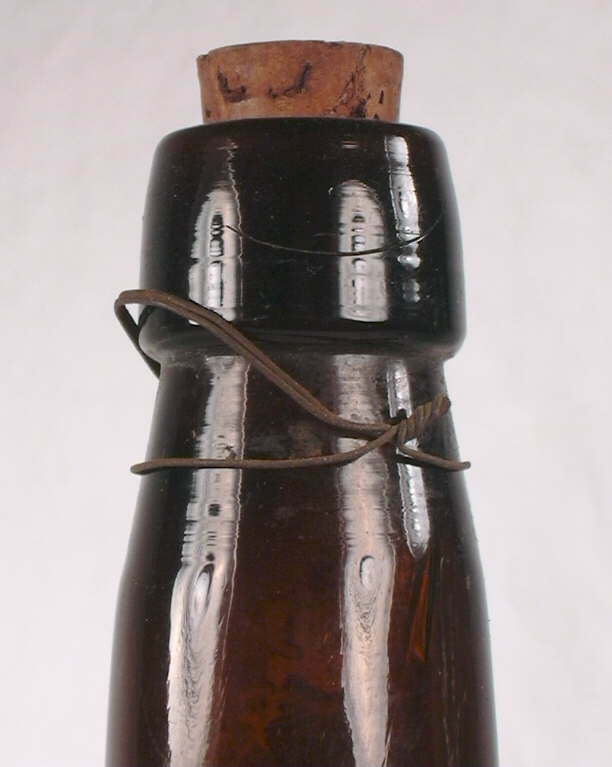 Dating Notes: The bottle seal was used primarily on blob finish, mouth-blown beer bottles (and blob finish soda bottles to a very limited degree) made from as early as 1885 - although much more commonly in the late 1880s to early 1890s - to at least the early 1910s (IGCo. 1911; Newman 1970; empirical observations). The majority of both types of bottles have tooled finishes; applied finishes using this closure are very uncommon (empirical observations). Finishes that accepted a bottle seal closure show up on beer and soda bottles from all parts of the continental U.S. and is rarely, if ever, seen on other bottle types. 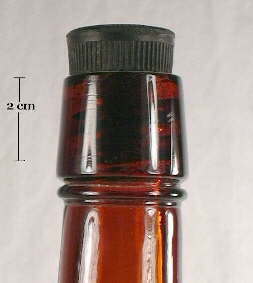 Even during its peak period of use, the Lightning-type closures were used much more than the bottle seal on beer bottles and the Hutchinson stopper on soda bottles (Lincoln 1970; Munsey 1970). By the early 20th century another of Painter's patent closures would totally eclipse all of the competitor's in the closures world - the crown cap. The crown cap closure (and related finish) is arguably the second most significant closure of all those listed on this page (external screw threads/cap is likely #1). 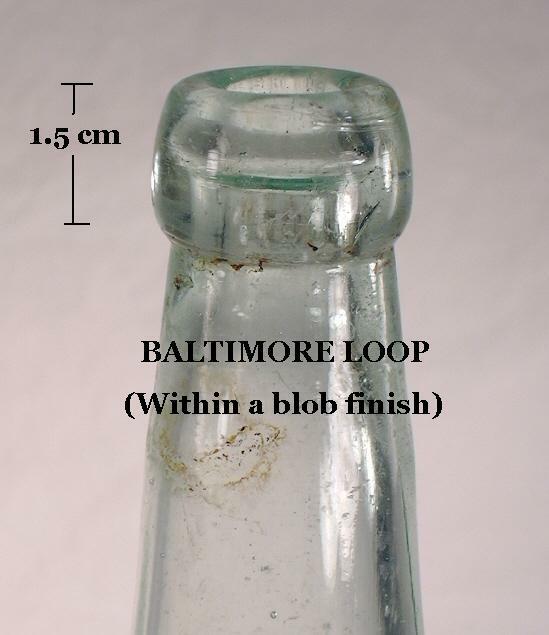 It was patented by William Painter in 1892, who also patented the Baltimore loop seal discussed above (and the holder of hundreds of patents, not all dealing with bottling). 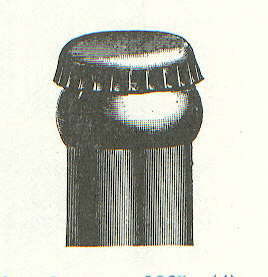 The illustration to the left shows the crown cap on a period (1890s) crown finish with a rounded lower portion (one of many stylistic variations found on crown finishes) which looks almost identical to the crown cap/finish used on beer and some soda bottles today (from Riley 1958). It was called the crown cap because, according to Painter it "gives a crowning and beautiful effect to the bottle" (Lief 1965). Click Williams Painter's Bottle Sealing Device to see the original February 2, 1892 patent (U. S. Patent Office). This closure consists of a simple metal cap with a corrugated skirt or flange and a compressible liner (originally cork [earliest days to mid-20th century] or sometimes linoleum soaked disks [1909-1915] and now plastic) inside the top. The typical finish is as shown below which is a specific conformation "bead" upper part on top of a variably tapered lower part or collar, though sometimes there is no collar - just the neck of the bottle. The standard crown bead or upper finish part was essentially 1" in outside diameter (~2.5 cm) which continues to be the diameter today over 100 years later. The cap is placed on the crown finish and crimped into locking position with some type of crown capping tool or machine (Lief 1965). To access the contents of the bottle the still familiar, small, hand bottle opener is used. The crown cap was not an immediate success since it required new bottles, new bottling machinery, and a level of uniformity of bottle manufacture that was just beginning to be possible in the early 20th century. It was also possibly perceived as being "too good to be true" - the corollary to the human inclination to resist change. 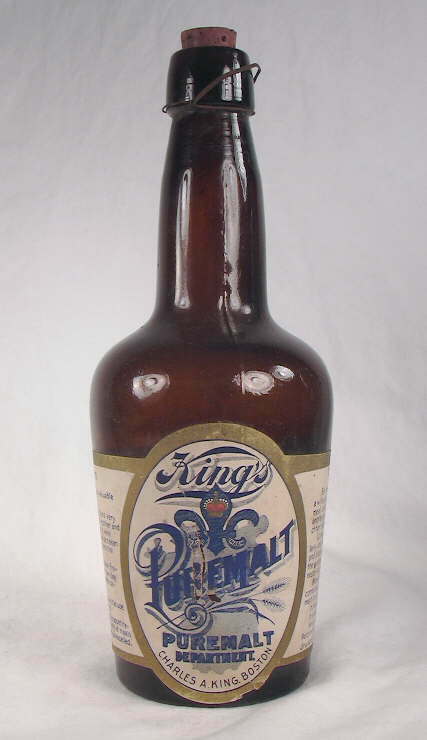 There was also already a lot of fully functional beverage bottles in use that only accepted other closure types; businesses could not or would not make the large investment in new bottles without some proof that this new closure was a significant improvement on the old (Crown Cork & Seal Co. 1950s; Riley 1958; Lief 1965). The illustration to the right is from a 1904 patent that shows one of the tools specifically designed to form and tool a mouth-blown crown cap finish. Click Coale & Greensfielder's November 15, 1904 Patent #775,206 to view a copy of the entire patent which was for a "Bottle Forming Implement" - aka "finishing" or "lipping" tool (U. S. Patent Office 1904b). The dotted outline of a crown finish and upper bottle neck is visible within the "jaws" of the calipers type finishing tool which is otherwise quite typical of the tools used to finish bottles from at least the 1840s until the end of the mouth-blown bottle era. With the advent of better hand tooling methods in the late 1890s to early 1900s followed by the inherent uniformity of automatic bottles machines in common use by the early to mid 1910s, the crown finish quickly gained supremacy (Lief 1965). 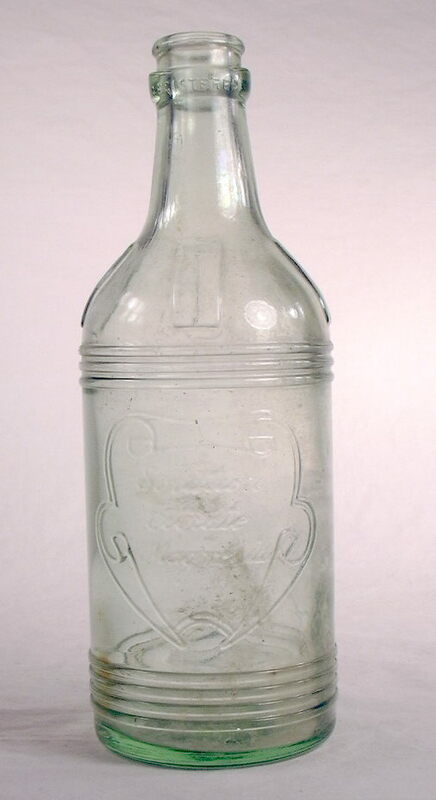 Although it has been noted that by 1905 less than 25% of U. S. bottlers had adopted the crown finish/bottles, some areas seemed to have adapted to the new closure earlier. For example, El Paso, TX. appeared to have the majority of bottles be crown finishes by 1905 or so (Paul and Parmalee 1973; Lockhart 2000). Conversion also came a little faster in New England and the Mid-West (Lief 1965). Berge (1980) noted that the crown finish was universal for carbonated beverages by 1912 with complete transition by 1920. The illustration to the below left is of a crown cap/finish with a flattened lower portion (one of many stylistic variations found on crown finishes) on a machine-made bottle; note the neck ring seam below the finish and the mold seam proceeding to the top of the finish. Dating Notes: It appears that no crown finish bottles date prior to the 1892 patent date. In fact, virtually all crown finish (soda and beer) bottles date to after ca. 1894-1895, since in 1893 a national depression (the famous "Panic of 1893") made investment capital very scarce for several years deterring the use of new and expensive equipment like that needed to accommodate this new closure (Lief 1965). 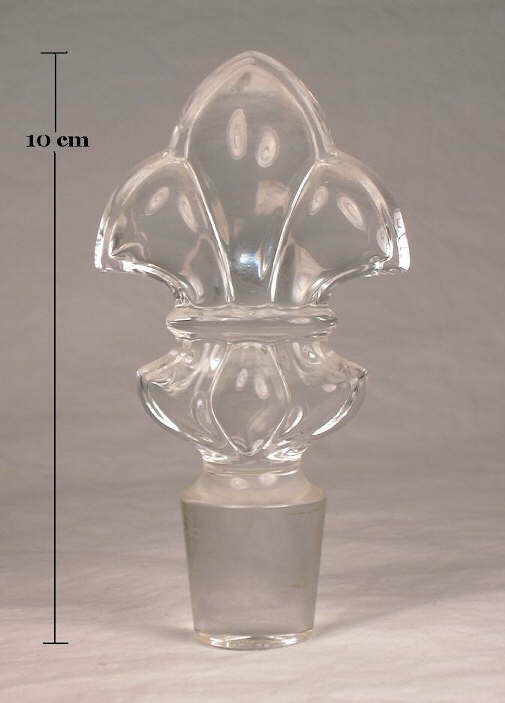 As an example of the progression in acceptance of this finish/closure style, the crown finish first shows up in the 1896 Illinois Glass Co. (IGCo) catalog with just one soda bottle offering. In 1899 the IGCo. offered several different crown soda bottles, by 1903 21 different soda bottle molds were listed with crown finishes (as well as other similar bottles available for beer), and 37 different molds listed by 1911 (IGCo. 1896, 1899, 1903, 1911). Additionally, one major study of Illinois bottles (Farnsworth & Walthall 2011) noted that crown finishes on mouth-blown soda bottles in that state first appeared about 1898. Mouth-blown, true applied crown finish closure bottles are very uncommon and then usually of foreign manufacture (empirical observations). Mouth-blown, tooled crown finish bottles date from 1894 to about 1914-1915, when machine-made manufacture of soda and beer bottles was almost complete in the U. S. (Lockhart pers. comm. 2003). 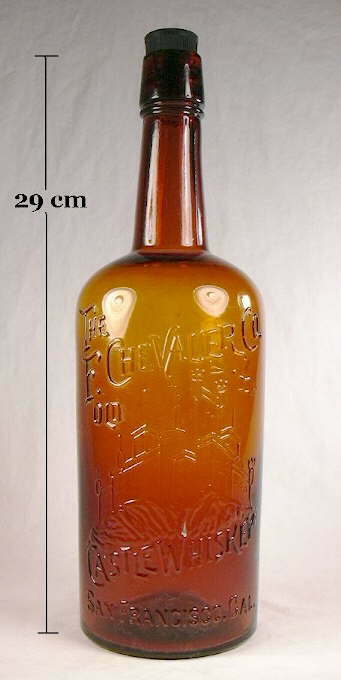 In Canada, it appears that at least mouth-blown soda bottles with tooled crown finishes were being made until at least the late 1910s (Axelson 2000). The crown finish pictured to the right is a tooled example that dates from around 1910-1915. 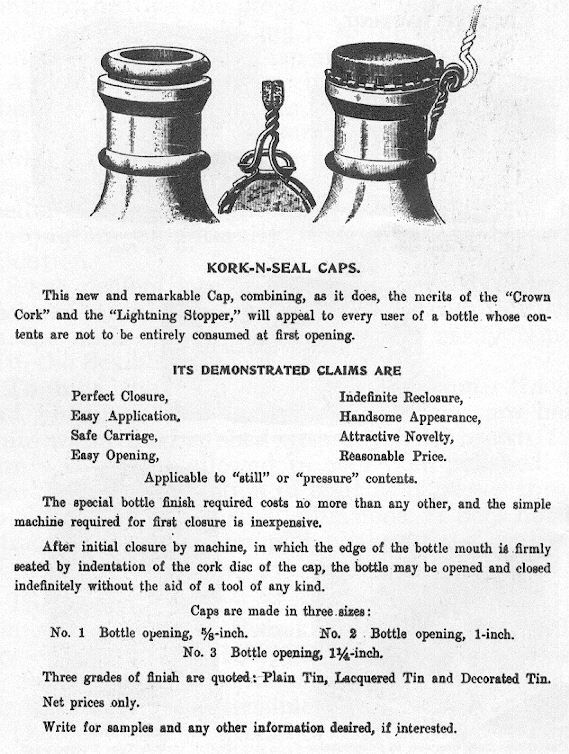 Machine-made crown finish bottles all date after 1905 when the first license for soda and beer bottles was issued for the Owens Automatic Bottle Machine, although most Owens produced soda/beer bottles post-date about 1910 due to the relatively slow implementation of these expensive machines (Axelson 2000; Miller & McNichol 2002). The semi-automatic machine production of narrow necked bottles was not significant until after about 1910 making machine-made, non-suction scarred (non-Owens machine) crown finish bottles likely to date no earlier than the early 1910s (Barnett 1926; Axelson 2000; Lockhart pers. comm. 2004). The following link is to a portion of The Ultimate Beer Cap Page, a website devoted to the crown cap closure: http://www.makk.fi/crowns/williampainter.asp This particular page is about the inventor, dimensions, and related history. 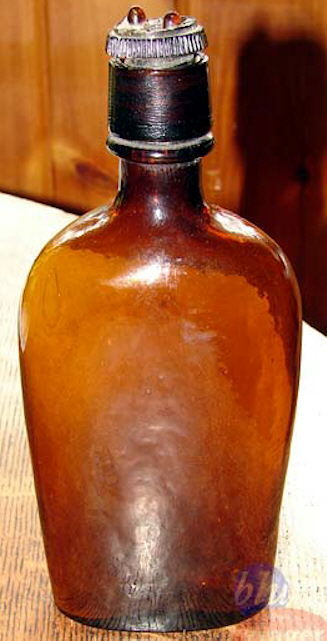 One of the last minor changes or variations of the crown closure was the development of the "Priof" method of bottle finish by the Illinois Glass Company. 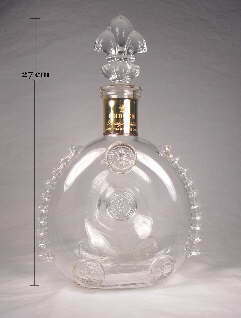 The crown bottle, appearing in the early 1920s, had a projecting ledge below the lip of the crown which assisted the consumer in opening the bottle. By using the ledge as a point of leverage, one could easily pry off the cap by using a knife, key, coin or any flat piece of metal. One needed only to insert the lever between the ledge and the cap and twist. Although this type of bottle finish was used sporadically through the years, it never became popular enough to dominate the market. However, its major advertising feature was that it substantially reduced the number of broken and chipped bottles which resulted from the use of various unconventional openers. The "ledge" is visible in the image just above the "PRIOF" embossing; in fact, the embossing is on the outside face of the ledge. This finish was usually (always?) embossed with REGISTERED PATENTED "PRIOF" horizontally on the lower part of the finish, as shown in the image above. This finish was not being offered in the 1920 Illinois Glass Company catalog so must have been invented/patented shortly thereafter as noted by Paul & Parmalee above (IGCo. 1920; Paul & Parmalee 1973). 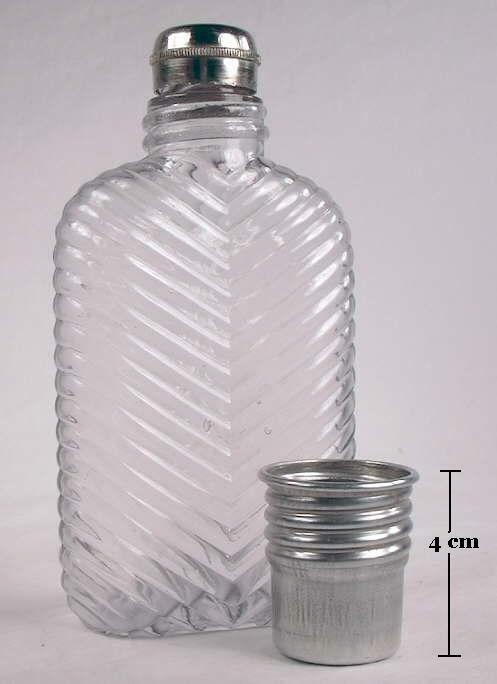 It appears that this finish/closure was by far most commonly used on Citrate of Magnesia bottles made during the 1920s and 1930s, though undoubtedly saw some other use as a beverage finish/closure. 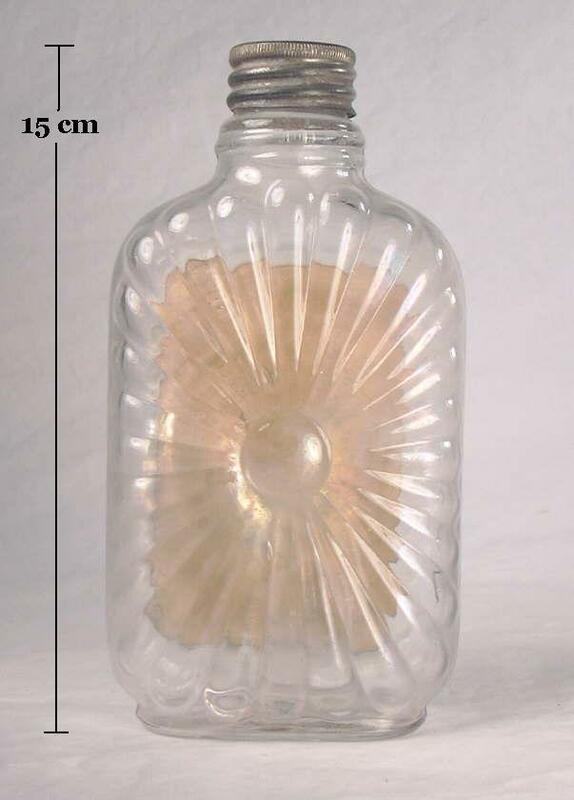 The pictured bottle is body embossed with SOLUTION / CITRATE / MAGNESIA and dates from the 1920s. It has the makers mark (on the heel) for the Illinois Pacific Glass Corporation (San Francisco, CA.) which was very closely affiliated with (owned by) the Illinois Glass Company. This bottle dates more precisely between 1926 and 1930 as that was the period in which the "IPG in a triangle" makers mark was used (Lockhart et al., 2005d). 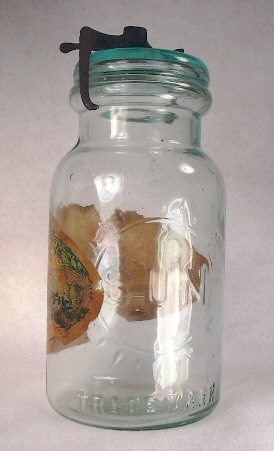 Click on the following links to view more images of this bottle: entire bottle showing the embossing and body rings (typical of many Citrate bottles); close-up of the shoulder, neck and finish. As already noted, there were scores of different closures used on soda and beer bottles though none achieved near the popularity of the closures covered during the time span covered by this website - 1800 to the mid-1950s. Because of their uncommon use, which translates into the rarity of finding them on historic sites or elsewhere, no additional closures are covered for soda and beer bottles. For additional information, consult the references noted at the end of the Introduction at the top of this page. 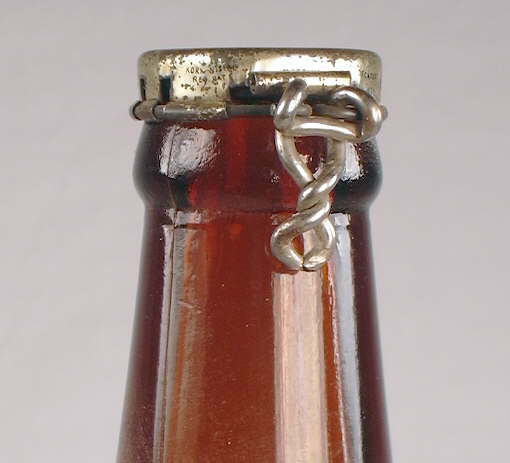 One additional closure type that achieved a high level of popularity for soda and beer bottles in England, Commonwealth nations, and to some degree continental Europe, was the inside thread closure/stopper. A few were used in the U.S. for soda or beer bottles, most notably in Hawaii (Elliott & Gould 1988). Though not popular for soda/beer, the inside thread closure did achieve fairly common usage on Western American liquor bottles made between about 1890 and 1915 (covered in the "General Closure Types" section). 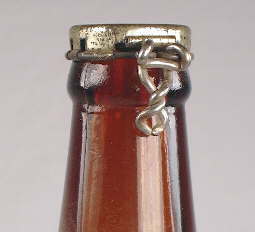 In modern times, various external screw thread finishes have and continue to be used on both soda (mostly plastic now) and beer bottles, including the crown cap variation for beer bottles that screws off the bottle for opening. This closure apparently originated in the 1970s (Rock 1990). In the list of over eleven hundred names of fruit jars and variations...one thing stands out. It is the vast variety of sealing methods employed, and the many patents concerning them. There was no one simple seal that functioned without some drawbacks, and even the Mason shoulder-seal jar, which to many is seemingly synonymous with the fruit jar, is now so different from its beginning that only the name remains. Much of this is due to the limitations of early glass-container manufacture in providing an opening that could be sealed hermetically. It either had to have a ground lip or a pressed lip. If pressed it could not have a screw-thread or indeed anything except some sort of spring or clamp. If ground, the sealing surface could not be the ground surface since that would leak and contaminate the contents. (Many tried to seal on the ground surface, however.) The ways to cope with the ground surface was to straddle with the cap, as in the Mason jar, and seal on the shoulder, or to straddle it with a glass or metal lid, or to form a stopper. The requirements of a glass package are first the air tight sealing which has been first obtained by sealing the jars with corks and tying them with wire so as to prevent their being blown out by the inside pressure while processing. However, during the boiling some air and steam from the inside of the jar forces their way out and while cooling off produces a vacuum, and owing to the porous nature of cork, the air from the outside, not pasteurized, is sucked through the porosity of the cork, gets into the jar causing its contents to be attacked by the germs contained in the said air and soon the decomposition takes place (Pacrette 1901 as quoted in Bender ). This closure method was reportedly first used for local home based food processing in Europe by 1814 and in the U.S. by the 1820's, though did not really catch on until the late 1830s or early 1840s (Bender 1986). This simple round metal cap closure is associated with the wax seal finish which is typically found as an applied (or "pressed on" in fruit jar terminology) finish and seems to be found primarily and commonly on earlier fruit jars usually dating from the early 1850s until about 1890. 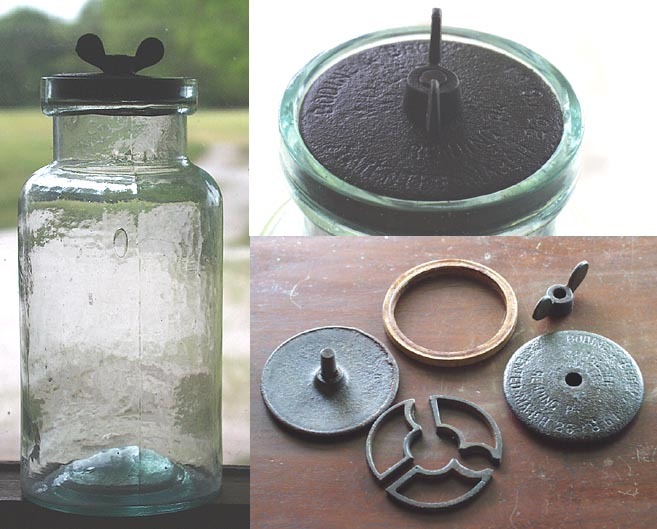 An exception to this dating is that several different varieties of groove-ring wax seal "Ball Standard " jars were actually some of the first semi-automatic machine made jars, being first produced in 1896 to about 1912 (Toulouse 1969a; Creswick 1987). These latter jars exhibit machine-made diagnostic characteristics; see the machine-made bottles portion of the dating key. The wax seal finish appears, looking down from the top, to be two round - but parallel - ridges with a groove separating them. 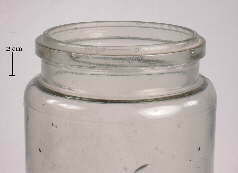 The rounded outside edge of the finish slopes down and towards the upper neck of the jar. The finish is easier to visualize than describe - click on the pictures to the left and below right. This design allowed wax, wax-dipped string, or other sealing compound to be placed into the groove. 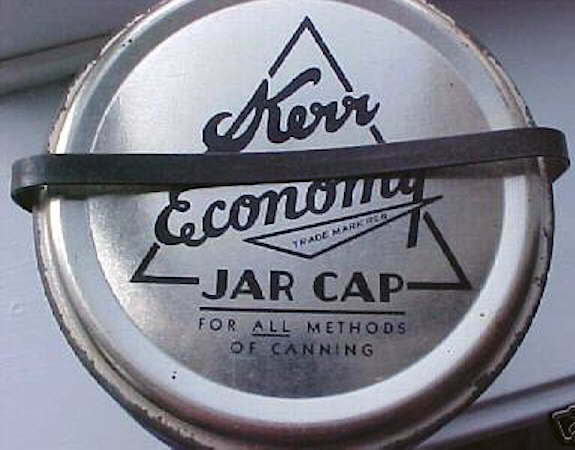 While canning, a properly sized round metal cap (usually tin) with a turned down edge or "skirt" was then pressed into the warm wax to seal the jar (picture to left). Alternatively, the cap was first placed into the finish, then hot wax poured into the groove to seal. Wax seal jars were sometimes sealed using a glass lid or large cork instead of the tin lid, though tin was much more common and likely cheaper (Toulouse 1969a; Jones & Sullivan 1989). The amber jar pictured above is a ca. 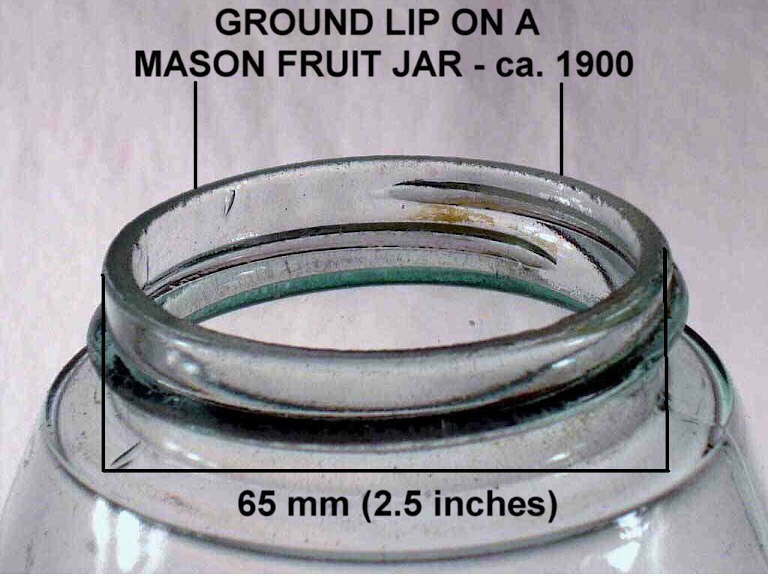 1870-1880 Standard fruit jar with a pressed laid-on ring finish with the tin cap in place (photo courtesy of Greg Spurgeon Antiques). The groove ring jar finish pictured to the left above is a Potter & Bodine Air-Tight Fruit Jar dating firmly between 1858 (patent date) and 1863. 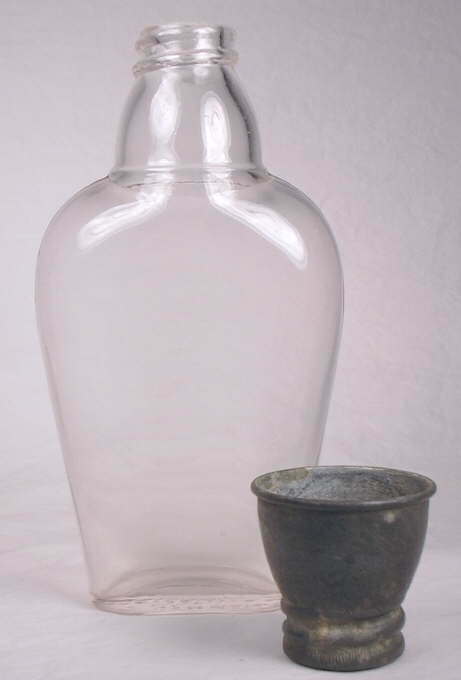 The jar finish pictured to the right is on a San Francisco Glass Works (California) produced quart fruit jar dating from 1869 to 1876, though the jars may have been produced as late as the early 1880s by the successor to that company (Toulouse 1971; Creswick 1987; Hinson 1995). 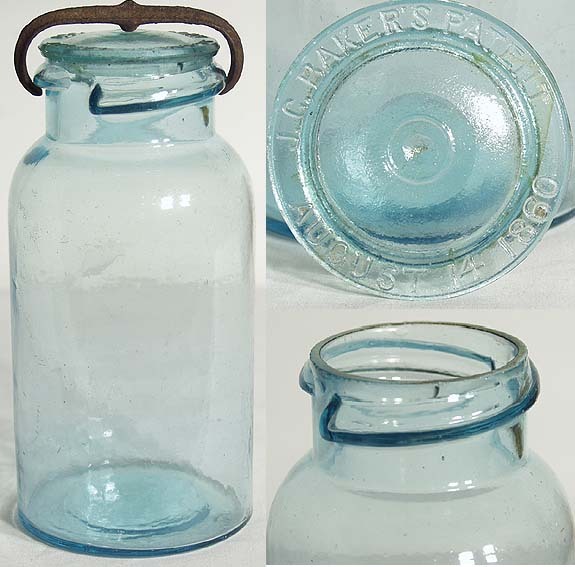 Wax seal jars were produced in quantity by scores of different glass companies throughout the U.S. in quart and half-gallon sizes primarily. 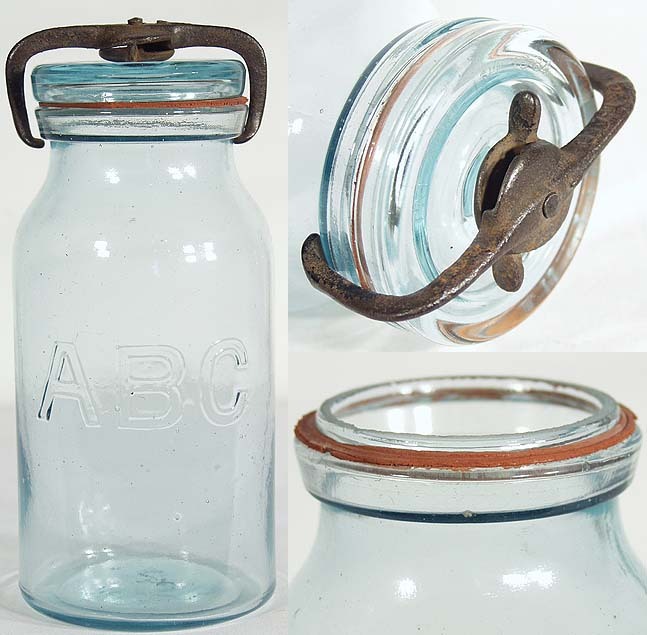 Though frequently embossed like the pictured examples, these early type canning jars are more commonly encountered with either base makers mark embossing or without embossing (Toulouse 1969a; Creswick 1987). 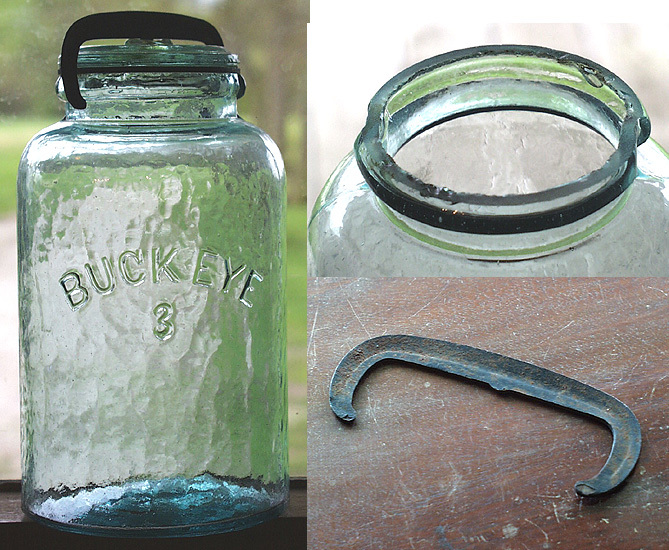 For more information on this type of finish, see the Food Bottles & Canning Jars page. 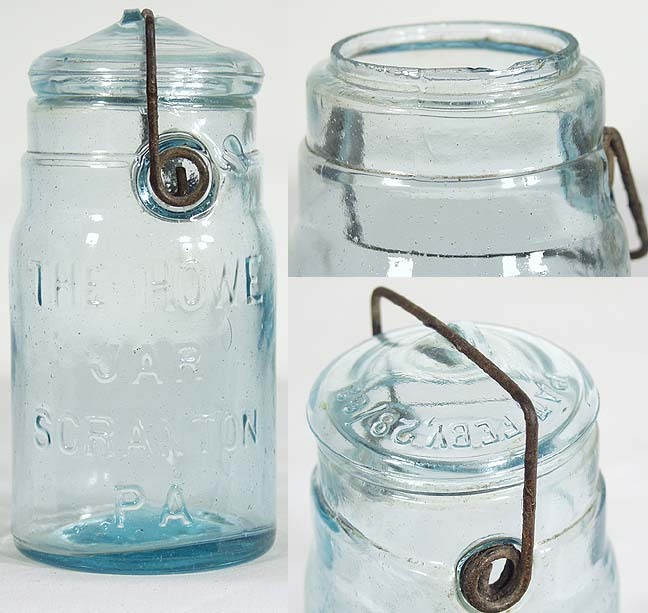 Probably the most commonly and longest used closure for fruit jars was the zinc screw cap that closed "mason" fruit jars. 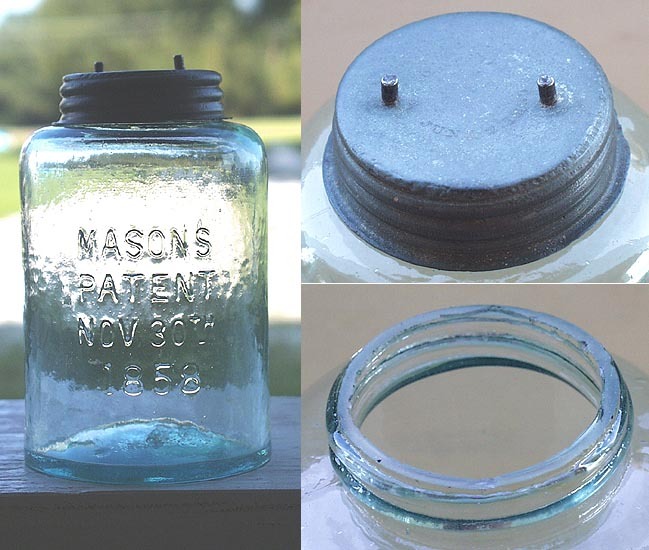 This closure was used on the ubiquitous John L. Mason's originated Mason's Patent Nov. 30, 1858 jars as well as many other types of similar jars. Mason's original patent did not cover the cap itself since caps were not a new invention; the patent covered the improved screw threads which gradually vanished towards the top of the finish and the shoulder (allowing for a tightening seal) and the relatively flat shoulder sealing surface (Lief 1965; Creswick 1987). 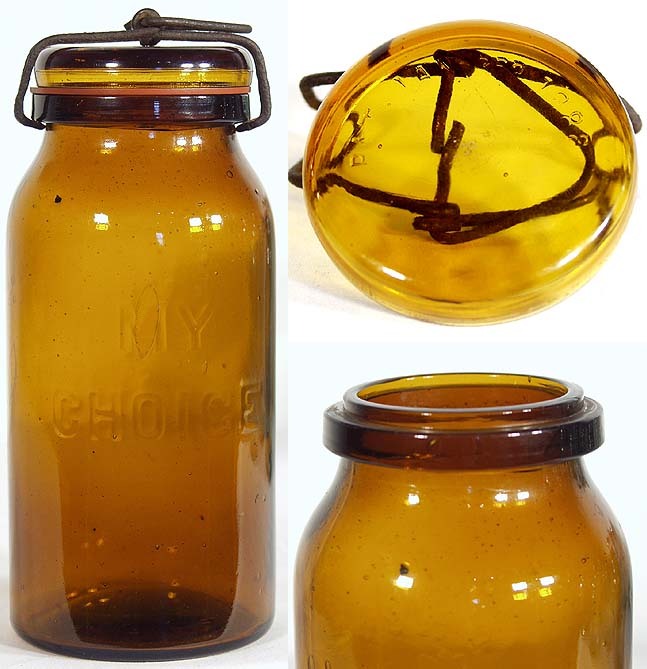 There were many hundreds of different variations and types of Mason style fruit jars and scores of subtle variations in the cap itself spanning a time frame from 1857 until the mid-20th century, and in modified form, to the present day (Creswick 1987). The name Mason is still synonymous with canning jars , i.e., a "mason jar." Like the Lightning closure discussed earlier on this page (and below more briefly) the Mason's closure has a long and fascinating history which is beyond the scope of this website. For more background information consult Lief (1965), Toulouse (1969), and/or Creswick (1987). The Mason's patent jar design, finish, and closure cap solved several problems inherent with food preservation in glass in the mid-19th century. 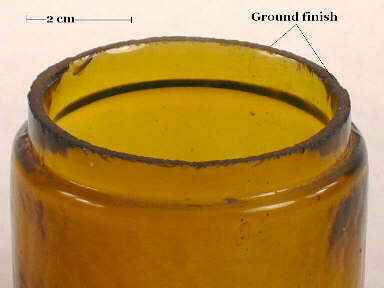 The gradually vanishing threads were molded along with the rest of the jar (essentially "embossed") below the finish rim and just above the almost perpendicular, short shoulder ledge. Molding of the threads with the body produced a relatively consistent threaded surface, though the threads were not the sealing mechanism and some jars are so crude that the cap does not go on very well. The sealing surface for these types of jars was also not the rim of the finish (i.e., extreme upper surface of the lip), which many fruit jar closure patents attempted to use. The primitive glass making techniques of the time resulted in the finish rim being too rough and unreliable of place to effect a seal (Toulouse 1969a). Instead, the Mason's design worked because of the sharp, almost perpendicular (to the screw-thread finish) shoulder ledge functioned as the sealing surface with the addition of a rubber gasket placed between the shoulder and the bottom of cap (Toulouse 1969a; Jones & Sullivan 1989). The ledge shows clearly below the screw threads in the picture to the right. During the period of about 1910-1915, the shoulder seal was phased out and replaced by screw thread jars which were designed with a beaded ledge between the threads and the shoulder which became the sealing surface (Toulouse 1969a). Click Atlas Strong Shoulder Mason finish for a close-up picture of the screw thread finish on a jar that has a typical bead sealing surface - the prominent ridge just below the threads. Click Atlas Strong Shoulder Mason jar to view this entire jar, which dates from the 1920s, with the cap in place (Creswick 1987). 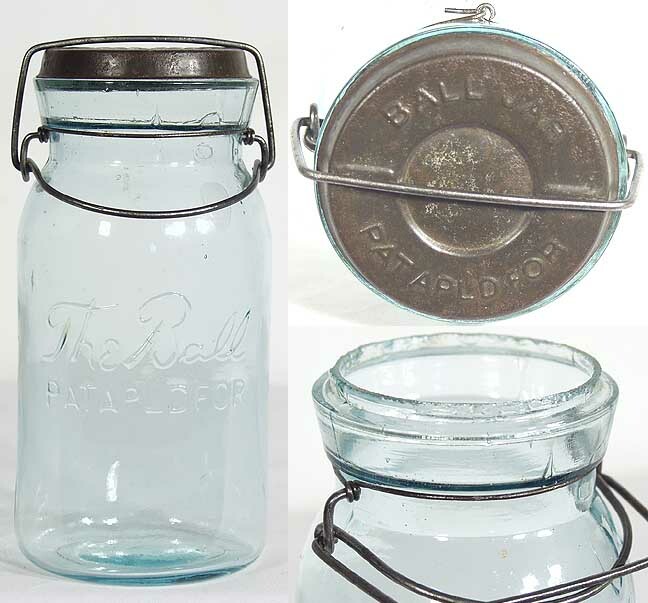 In the earliest days of the Mason jars/closures, the jars were sealed with a simple, unlined zinc cap. These early caps resulted in the potential for contact between the cap and contents often resulting in a "metallic" taste to the canned product. This problem was largely solved with Lewis Boyd's 1869 patents for a glass liner which were manufactured for insertion into the zinc cap. The following links show the Boyd's patents: March 30th, 1869 patent; May 11, 1869 patent; October 25, 1881 patent re-issue. The liner was often - even in the 1800s - called a "porcelain" liner even though virtually all were made of milk glass. The Boyd's milk glass liner is shown in the picture to the left which is viewed looking down inside the cap. 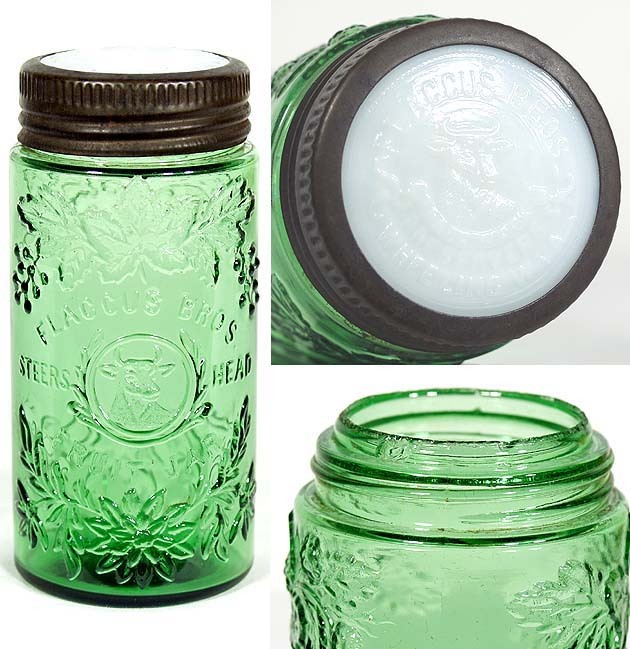 This particular liner is embossed "GENUINE BOYD'S CAP FOR MASON JAR" with the makers mark for the Hazel-Atlas Glass Co. who used that mark from 1920 to 1964 (Toulouse 1971). This indicates the lengthy period these type lids were produced, reportedly until World War II when the shortage of zinc forced the complete conversion to the tin plate bands still in use today (Brantley 1975). 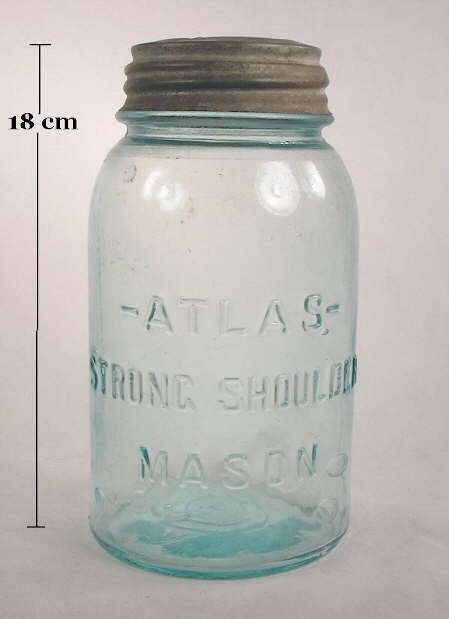 Click Atlas Mason to view a picture of a very early machine-made half-gallon jar- with the cap in place which dates from the early 1900s but still retains the famous "Mason's Patent Nov. 30th, 1858" wording embossed on it (Creswick 1987). It should be noted that the earliest Boyd's liners were reportedly made of colorless glass (Roller 1983). Other screw cap variations eliminated the top portion of the cap substituting the glass plate or liner which was affixed to the remaining, circular screw-band (Lief 1965). This is easier to view than explain - click Flaccus Bros. Fruit Jar to see an example of this type of screw-band and milk glass lid combination closure on a mouth-blown jar that dates from the 1890s or early 1900s. 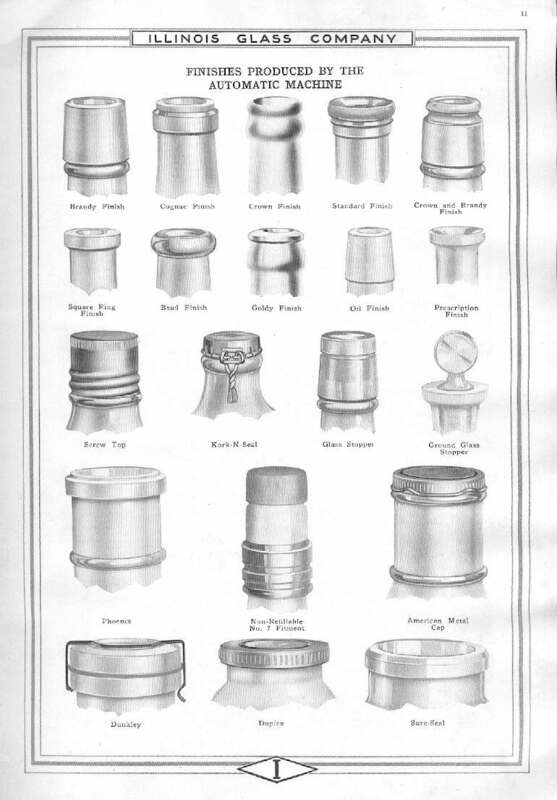 There were many variations on the screw cap/glass lid closure theme, which was originally patented in 1865, on jars made from the late 1860s to the mid-20th century (Jones & Sullivan 1989). 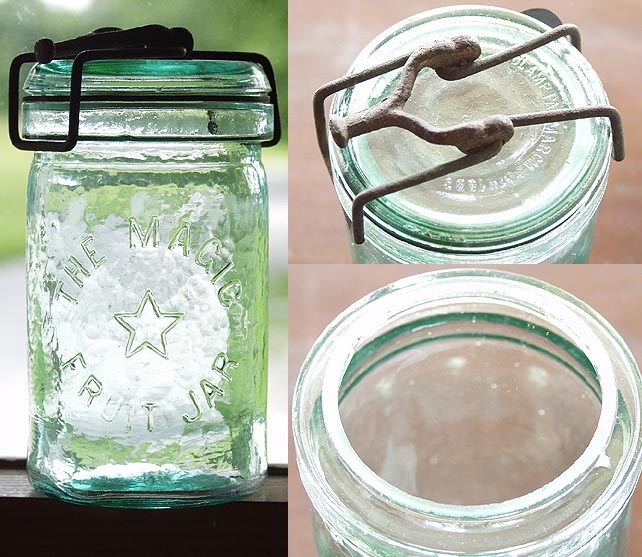 Modern fruit jars still use a metal screw-band which holds down a thin metal - not glass - lid. 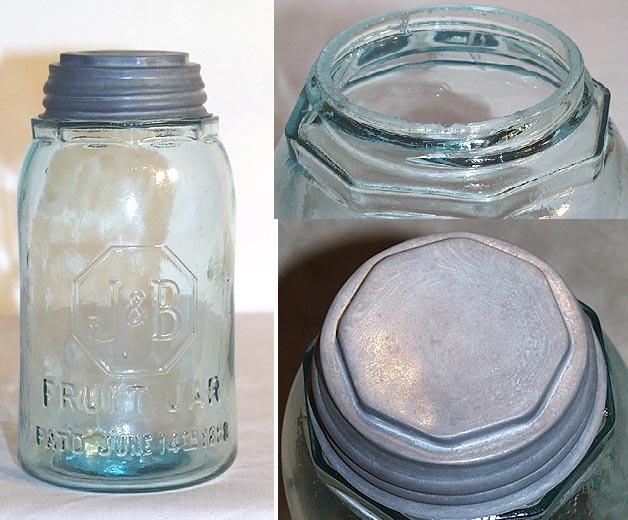 The difference with more modern (mid-20th century on) canning jars is that the sealing surface is now the rim (top surface) of the finish not the shoulder or a bead rim. This screw-thread and cap closure combination was not perfect, but had one major advantage over most other canning jars - the jars were some of the easiest and cheap to produce and sell. 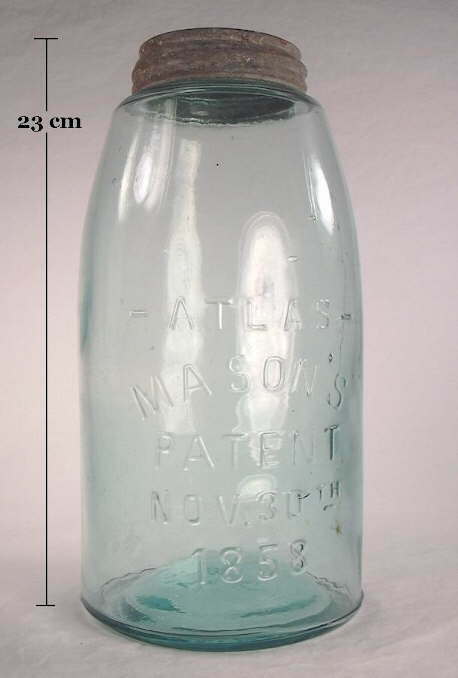 Once Mason's various patents ran out in the 1870s and 1880s scores of glass companies large and small began producing millions of "Mason" jars, many of which still bolded stated "Mason's Patent Nov. 30th, 1858" even though Mason himself was not connected with these companies (Toulouse 1969a). To quote Toulouse, "A glass company could get into the business of making Mason jars with a mold and a grinding wheel, and did not have to concern itself with supplying zinc caps; it could undersell any fruit jar on the market because of its simplicity; its lids were reusable and replacements were readily available." Not all of these jars were made to the same precise dimensions as the original and thus the caps are not always interchangeable between different makes of jars. Many different glass companies also produced the zinc and glass liner caps giving a variety of embossing possible on these liners (Lief 1965). The milk glass liners, and often the lids themselves, are very commonly found on historic sites anywhere that home canning took place which was essentially everywhere, including cities were urban dwellers would can produce when in season and cheap. 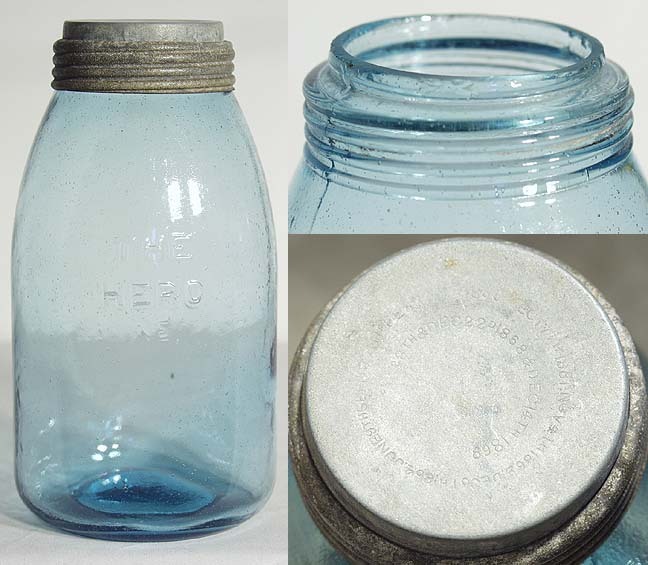 Since these lids were made for at least 60 or 70 years, there are no specific dating opportunities associated with them unless they have some type of makers markings like the example pictured above. The lids were also used for many years and not discarded until worn out, rusted, or the liner broken, further diminishing any utility for dating a site because of deposition lag problems. The Lightning closure (aka toggle closure) was previously covered above in the "General Closure Types" section above; click Lightning-Type Closures to move back to that section for detailed information (Toulouse 1969a). 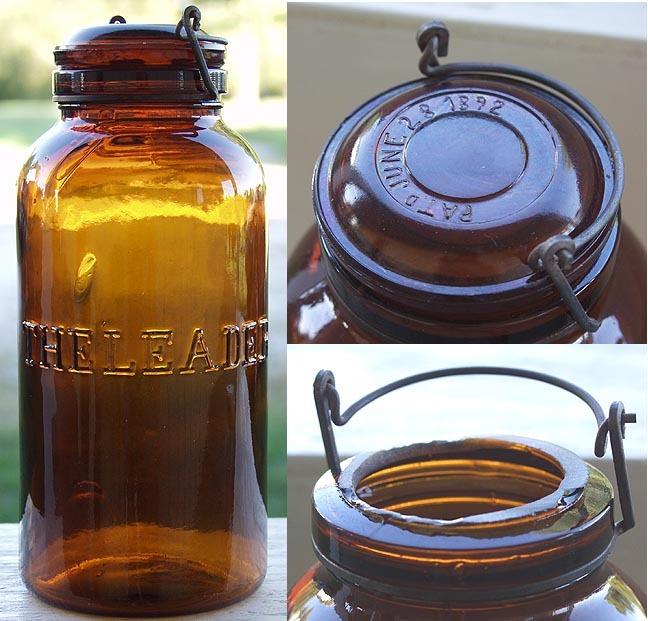 All Lightning-type closures are similar in the way the toggle mechanism works to clamp and seal the bottle or jar. 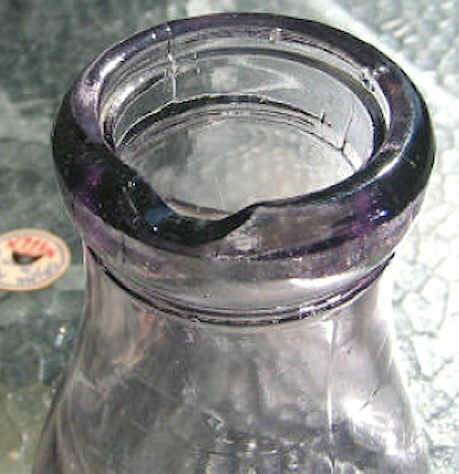 The substantive differences between the Lightning-type closures used on beer/soda bottles versus fruit jars was the size (much bigger closure on a fruit jar), the actual sealing surface (jars sealed against a rubber gasket on the ledge below the lip or rim on the outside of the bore; beer/soda sealed against a rubber gasket just inside the bore), and with fruit jars the lid could not be attached to the bail because of the size. If the lid were attached to the bail there would be no way to move it totally away from the bore of the jar to access the contents (Toulouse 1969a). Instead, the jar lid is held in position by centering the bail in a groove or between two raised dots in the center of the lid. This securing point has been called a cover groove (White 1978). 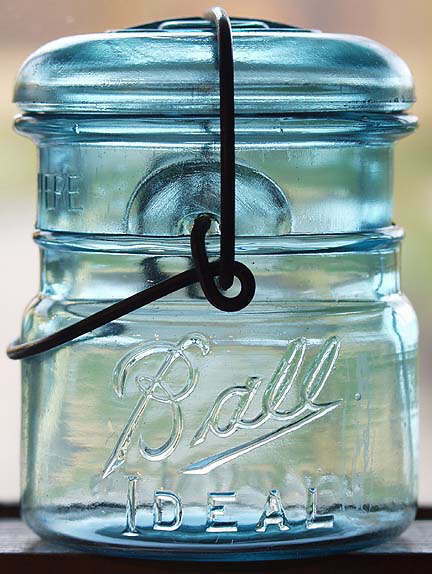 The other minor difference between the typical beer/soda and most canning jar Lightning-type closures is that on jars two metal "eyes" replaced the wire loops on the tie-wire as fulcrums for the lever wire, or in later years, dimples in the glass itself replaced both (picture below). In the 20th century, Lightning-type closures for canning jars had the sealing surface on a narrow flared bead just below the rim instead of the broad chunky band like on the Lightning jar. The newer Lightning-type closures also dispensed with the tie wire that encircled the neck and molded dimples into opposite sides of the neck to hold the ends of the lever wire (Creswick 1987). The jar pictured to the right is a pint sized Ball Ideal that has both these characteristics - a narrow flared bead sealing surface (just below the glass lid) and dimples to hold the ends of the lever wires (i.e., no neck tie wire). 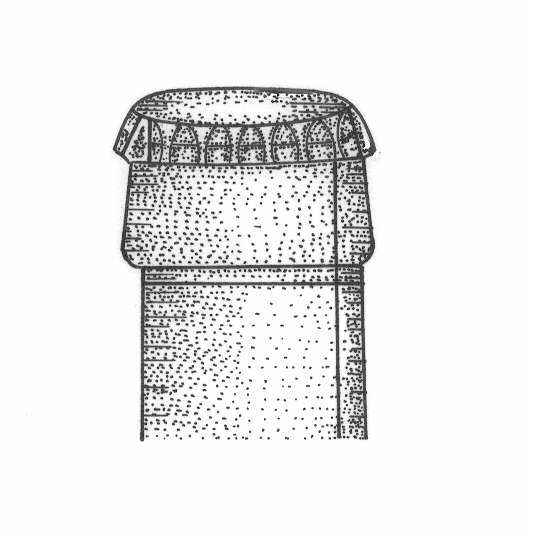 This style of closure was patented in 1908 and made into the 1960s (Toulouse 1969a). The pictured jar is likely from the earlier end of that manufacturing date range, i.e., the 1910s and 1920s (Leybourne 2001). This class of closures entailed a lid which sat within or on top of the finish and was held down tightly by a yoke and thumbscrew. Click on the picture to the left to see a larger version which illustrates the parts of this closure type. Thumbscrew and stopper/lid closured fruit jars were not as popular as the screw thread/cap or even the Lightning-types, but did gain some acceptance and widespread use primarily from the 1860s to 1880s. To quote Toulouse (1969a), "The use of the thumbscrew as a device to tighten the seal on the fruit jar was a matter of a quick flurry, and then virtual disappearance, except for the cumbersome Van Vliet, and the revival as a museum jar by Whitall-Tatum." Click Millville Atmospheric Fruit Jar to view a picture of the entire jar pictured to the left and right which was made by the Whitall-Tatum Glass Company (Millville, NJ) most likely in the late 1870s or 1880s.. 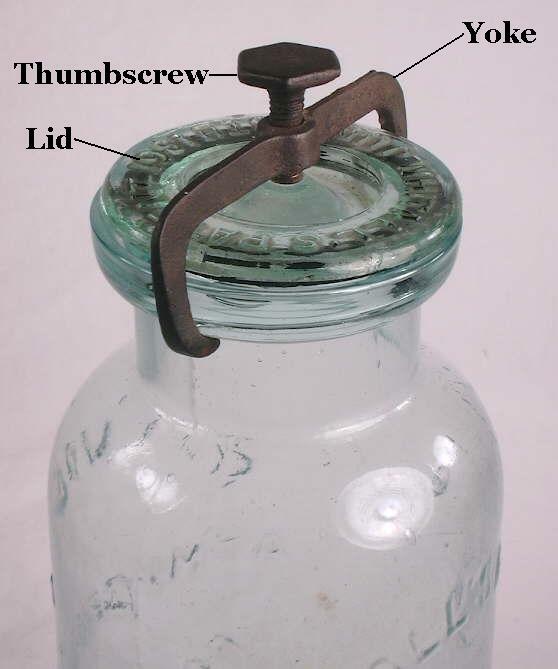 The Millville Atmospheric Fruit Jar was probably the most popular jar sporting a thumbscrew and stopper/lid type of closure. The finish on these jars is virtually identical to the wax seal cap/finish discussed above, but instead had a glass lid which fit into or between the parallel ridges on the top of the finish and was held down with thumbscrew clamp instead of a metal cap that was sealed with wax or equivalent substances. 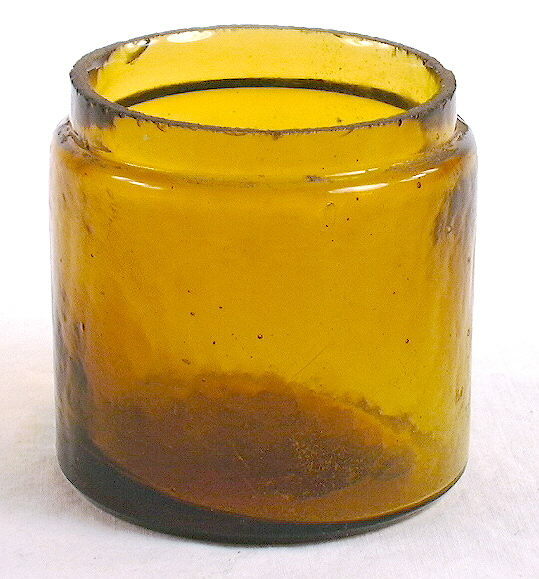 The use of glass instead of metal would have been a natural evolution from the wax sealers metal cap to avoid imparting a metallic taste to the contents of the jar. 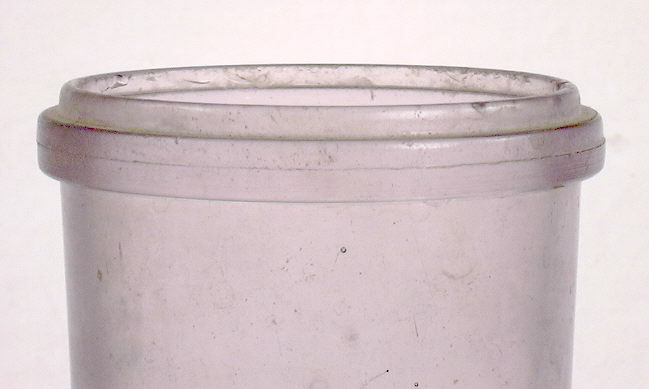 The picture below shows the finish on the Millville jar without the lid and clamp in place. A comparison of this finish with the wax seal finish pictured above shows the close similarity. 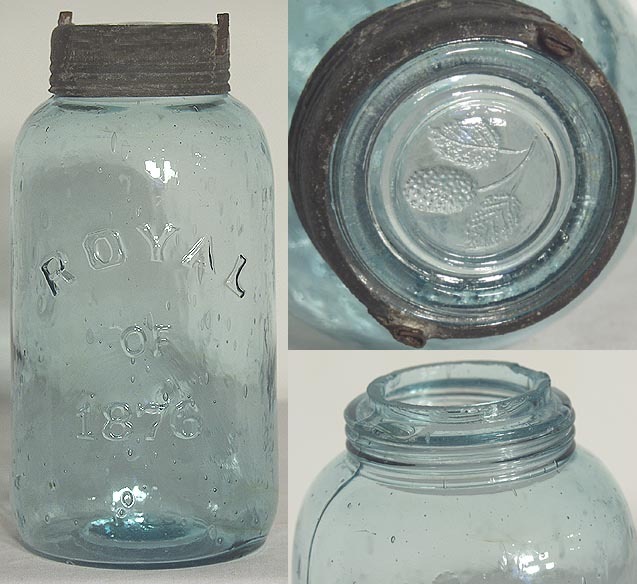 If just the broken off finish of a Millville jar were to be found on an historic site, it would be impossible to say whether the original closure was a wax sealed tin lid or a thumbscrew and glass lid. 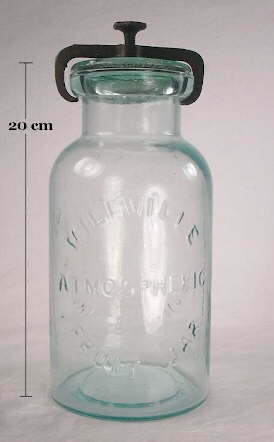 The reverse side of the Millville jars are embossed WHITALL'S PATENT / JUNE 18, 1861; click Millville jar reverse view. 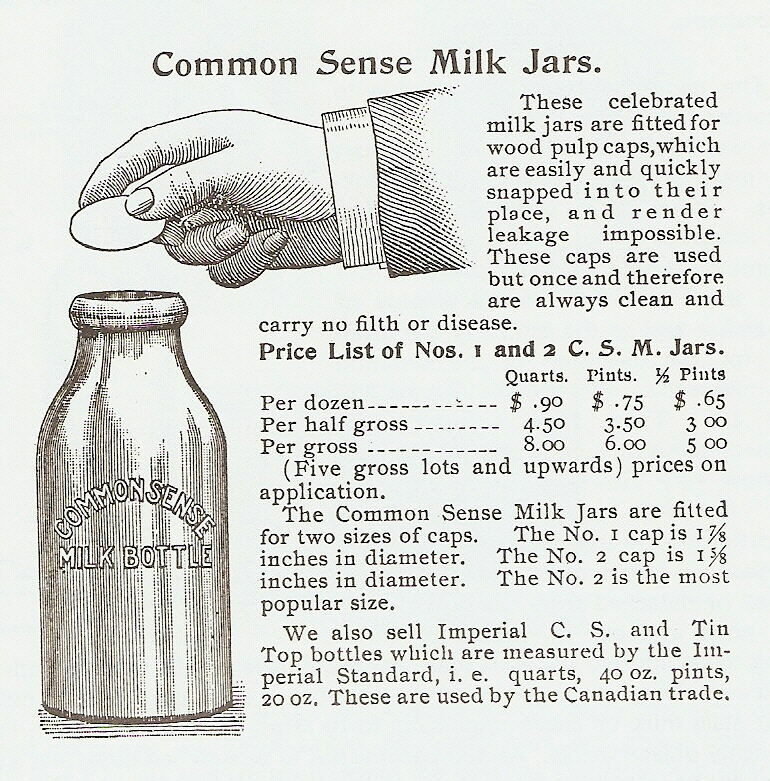 It was once thought that the actual patent date was November 4, 1862 (by T. G. Otterson) and that 1861 was claimed as the Millville origination in order to seem like an older, more established jar/closure when compared to the competing jars from John Moore & Co., a similar closure which was patented in December 1861 (Toulouse 1969a). 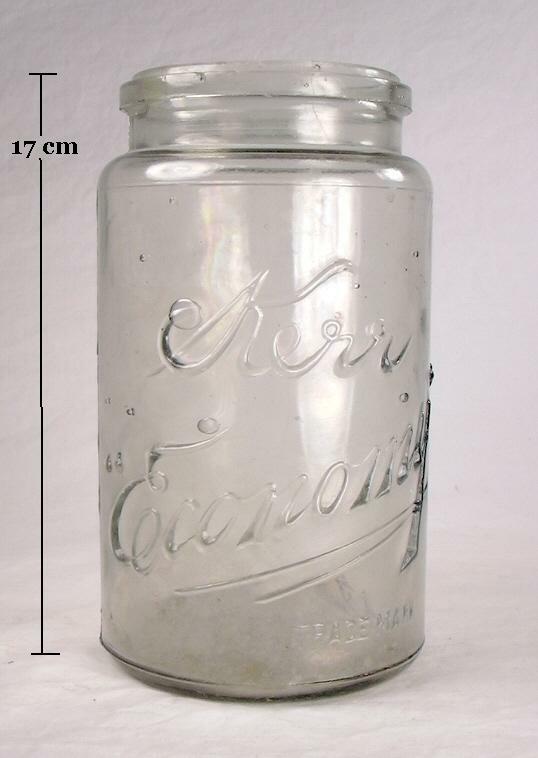 However, patent records do indeed show that John M. Whitall was granted a patent on June 18th, 1861 (incorrectly noted as "Jan. 18th" above the patent illustration) for this jar; click Patent #32,594 to view the Whitall patent (U. S. Patent & Trademark Office website). 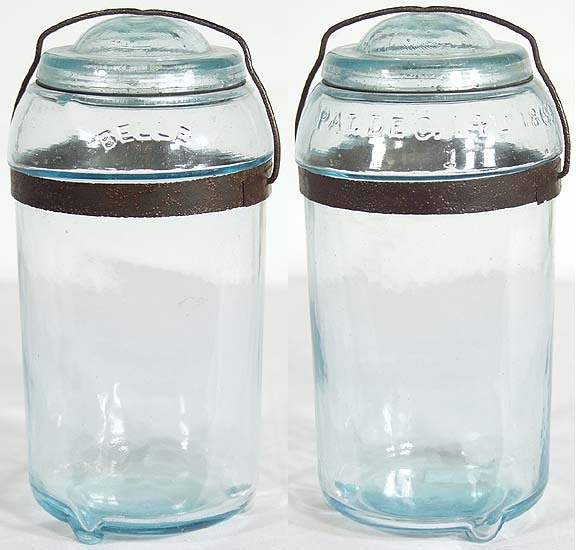 The lid or stopper closure on the John Moore jars fit on a ledge inside the bore of the bottle and thus the Moore jar finishes do not have the parallel ridges on or within the finish like the Millville Atmospheric and typical wax sealer jars. 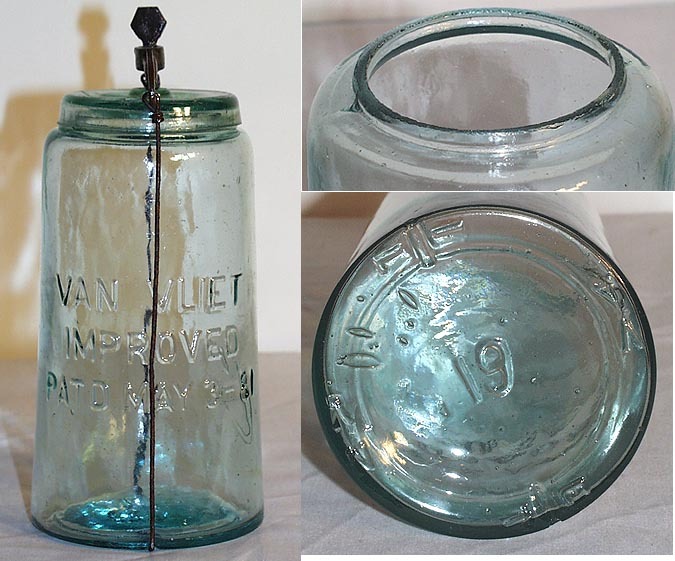 The Van Vliet jars had a glass cap that was shallowly cup shaped and fit over and around the outside of the finish. 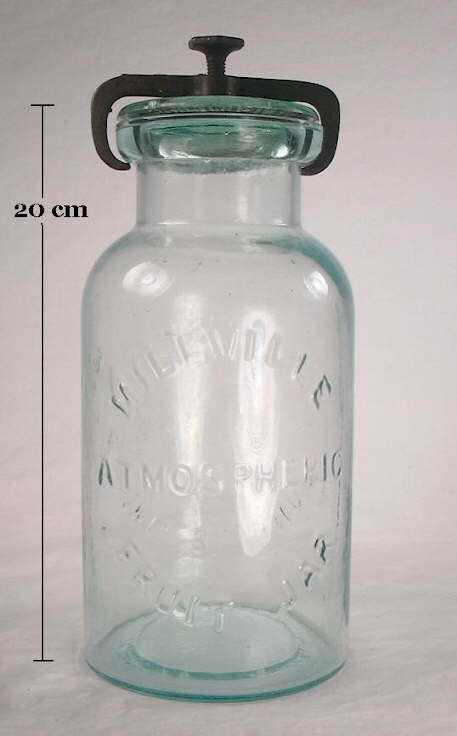 The Millville Atmospheric jars date from the 1860s through the early 1890s, although the Whitall, Tatum Company produced similar "museum jars" with the same closure at least into the 1920s (Whitall Tatum & Co. 1880, 1892, 1896, 1924). 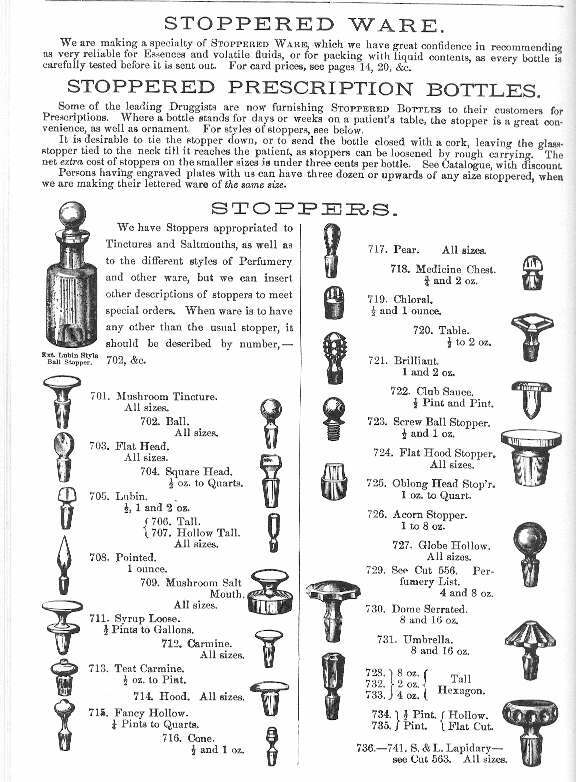 Other thumbscrew and stopper types like the Moore's jars date from the 1860s or early 1870s and the unusual Van Vliet's from the 1880s (Creswell 1987). After that time, this style of closure was rarely used since the external "Mason's" screw-thread and Lightning type closures dominated, along with a few others - like the cam lever and lid jars discussed next. Among the amazing variety of canning jar closures, there were at least three general classes of "lever" type closures: cam levers, simple levers, and clutch levers. All of these general types worked via the action of a lever (handle) to apply pressure in some fashion to hold the lid tightly against the sealing surface; see Toulouse (1969a) The Collectors' Manual to Fruit Jars book for more information. 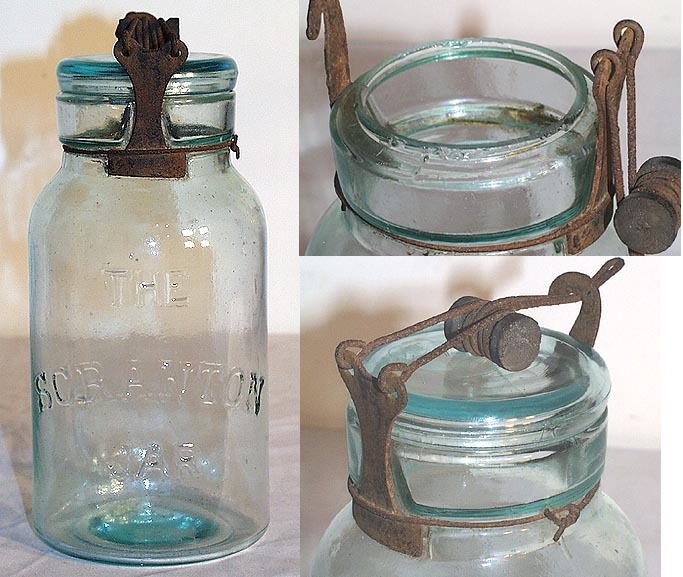 The first lever type patents for canning jar closures were issued in the early 1860s with various others issued into the early 20th century. 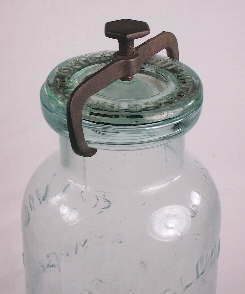 One of the most common of the lever type jars were the cam lever and lid closured Globe jars; most other lever based closure jars are uncommon. An exception were the Safety Valve jars which utilized a very different looking (than the Globe) cam lever type closure patented in 1895 and experienced some longevity from patenting (mouth-blown) into the machine-made era until about 1930 (Toulouse 1969a; Creswick 1987). 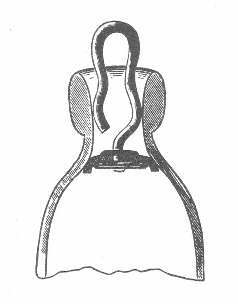 It was not until the patenting of the Globe closure around 1886 that a popular lever (cam lever & lid) type closure/jar caught on some with the canning public. This is not surprising given the competition from other canning jar closure designs, and in particular, the plethora of likely cheaper and (arguably) more simple and effective Mason finish/closure jars. 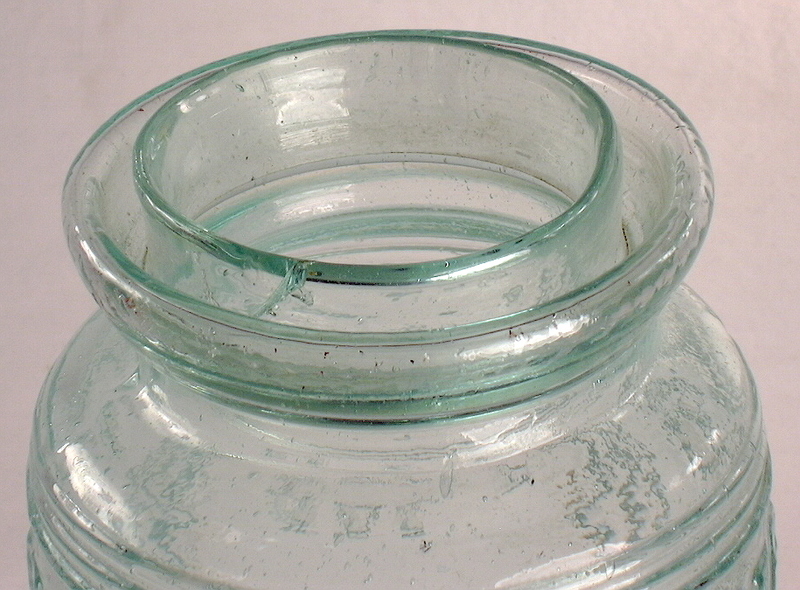 The Globe jar closure utilized a glass lid with a hemispherical seat that matched up to a rounded cam on the end of the short lever which was attached to a metal moveable bail. Swinging the bail over the center of lid, a user pressed down on the lever handle which applied pressure to the lid sealing it against a rubber gasket that sat on the ledge below the rim (see image to the right although no gasket is in place). 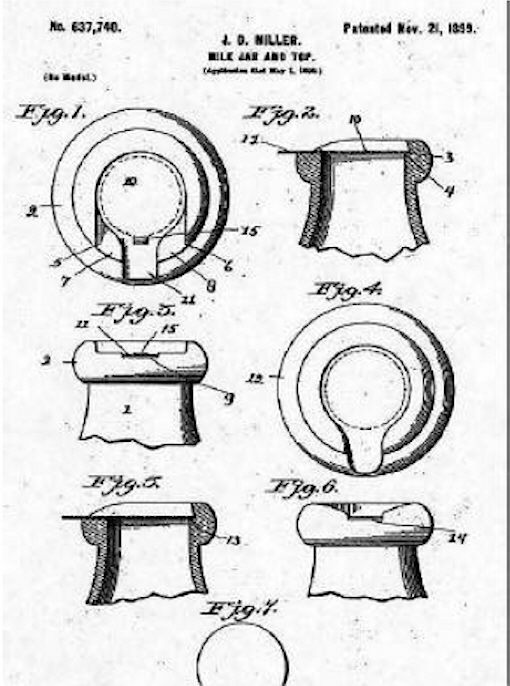 The patent for this closure was issued to Robert Hemingray on May 25th, 1886 for a "Fastener for Jar Tops." The patent date is embossed on the top of the Globe jar lids (image above left). Click Patent #342,602 to view the Hemingray patent which illustrates and describes the Globe closure. 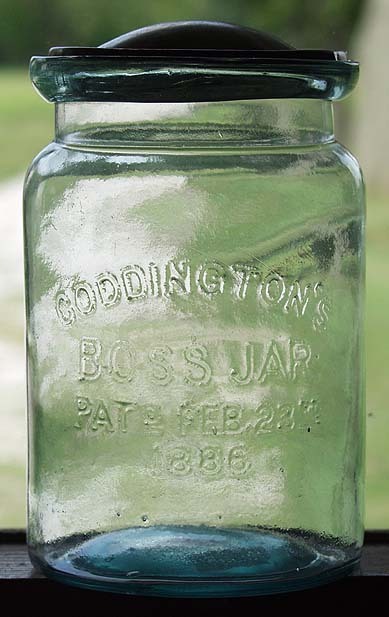 Most Globe jars are mouth-blown and date from the 1886 patent date to possibly as late as about 1910 and were made by the Hemingray Glass Company of Covington, KY (and other locations). Machine-made Globe jars are known but very rare indicating a narrow window of manufacturing, i.e., most likely from maybe 1905-1910 to the mid-1910s (Leybourne 2001). Another example of relatively popular jar (though a bit less popular than the Globe jars) utilizing a different cam lever and lid is the SUN jar pictured to the right. This particular jar was used by a San Francisco, CA. food packing company for their "Palace Brand Mince Meat" (more below). The jar is also embossed with SUN inside an outline of the sun with rays with TRADE MARK below. This embossing is shown in the second image to the right; click to enlarge. 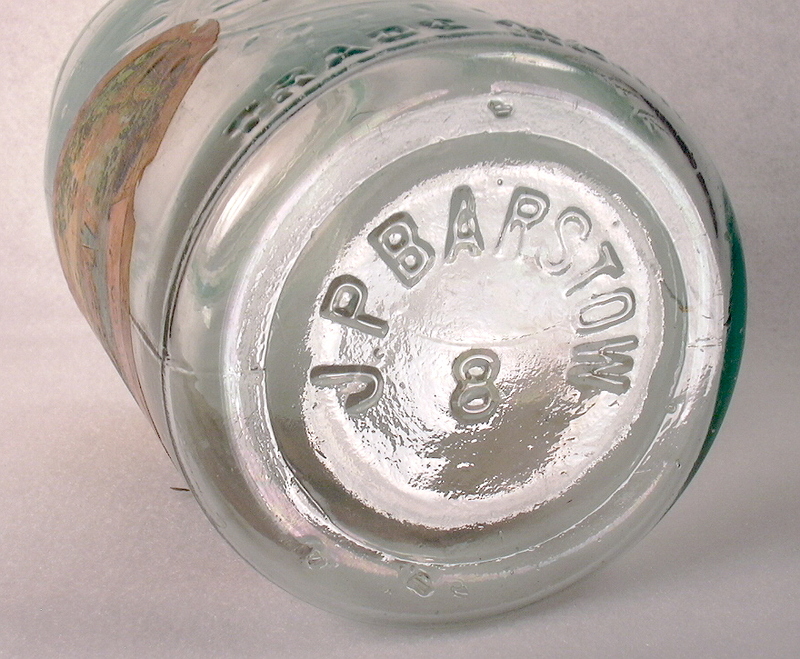 The base is embossed J. P. BARSTOW / 8 within a post-base mold circle; click base embossing to see an image of such. 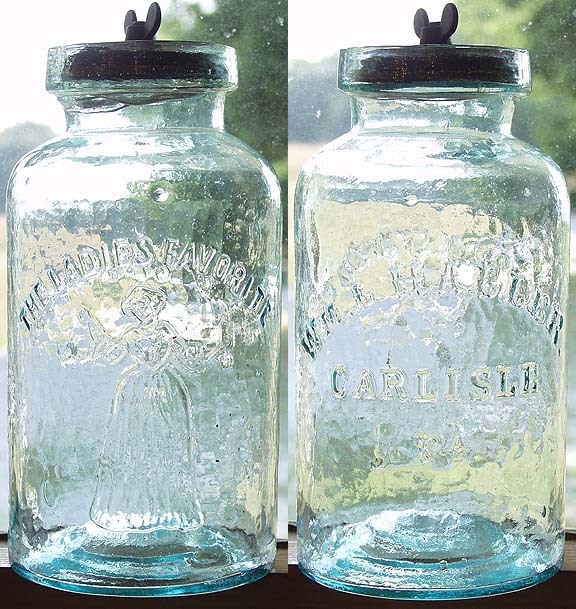 These jars were made for the J. P. Barstow Fruit Jar Company of Jersey City, NJ. from about 1894 to 1903 by an unknown glass house (Roller 2011). The cast iron yoke clamp, which tightened by a cam lever is cast with MONIER'S PAT APR 1 90 MAR 12 95. 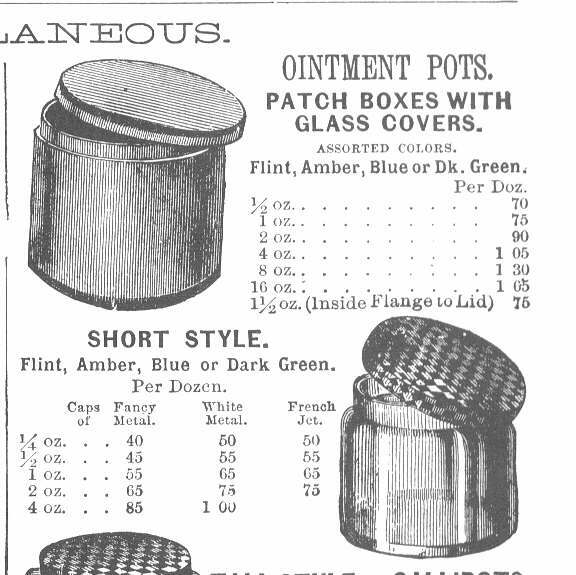 Click Monier's 1895 patent to see such including the patent illustration showing this closure, lid and jar finish. 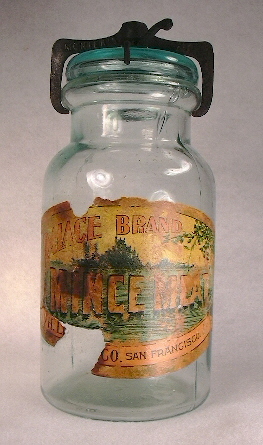 A close inspection of the label which only notes "H. LE*** CO. of the company name (due to label damage) and a check of a food bottle reference (Zumwalt 1980) indicates that this jar was used by the H. LEVI & CO. which was a pioneer San Francisco wholesale grocer beginning in the 1850s. Further use of the internet indicated the company was in business until at least the early 1900s and were selling mincemeat for 6¾ cents per pound in 1900 (San Francisco Municipal Reports for the Fiscal Year 1899-1900 - on Google Books). 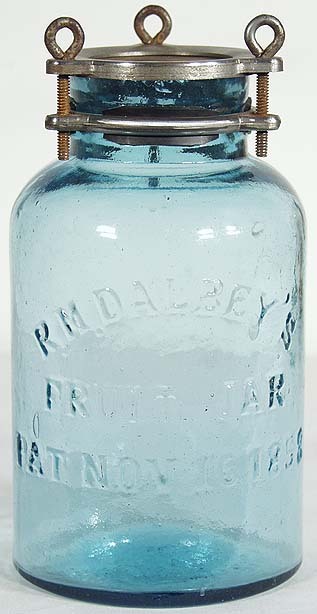 The Economy and Kerr Economy fruit jars were quite popular and widely distributed throughout the U.S. during the first third of the 20th century, though like with most popular fruit jars, they continued in use until either broken or replacement closures became unavailable. These jars (or fragments) are a common find on post-1900 historic sites. The Economy version of this closure was the most popular of the cap & spring clip type closures which did date back to the mid-19th century. 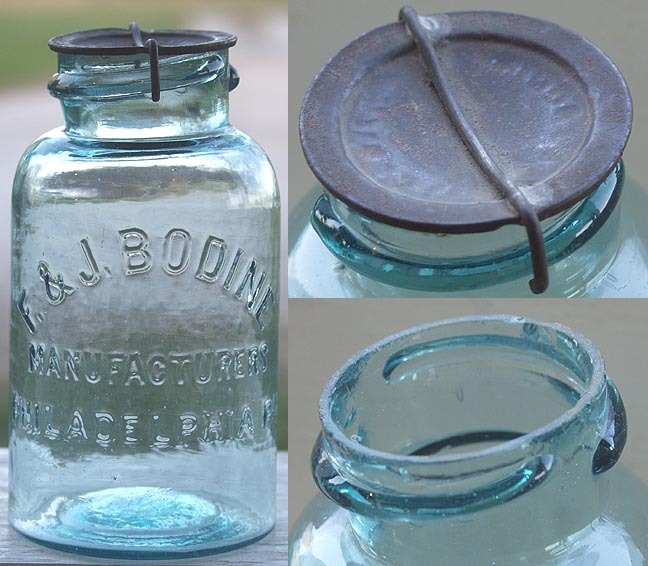 Click F. & J. BODINE jar to view a very early cap & spring clip closure on a jar that dates from the 1860s (Creswick 1987). 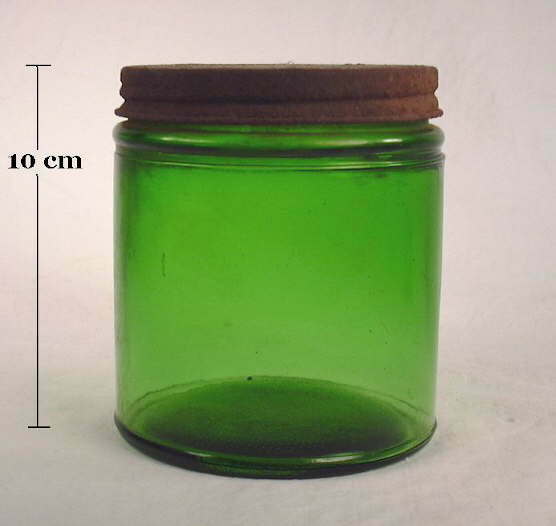 The closure on the Economy jars was a metal lid with a permanently adhered, heat softening, rubber gasket that was held to the jar while canning by a narrow flat spring clip (Toulouse 1969a). 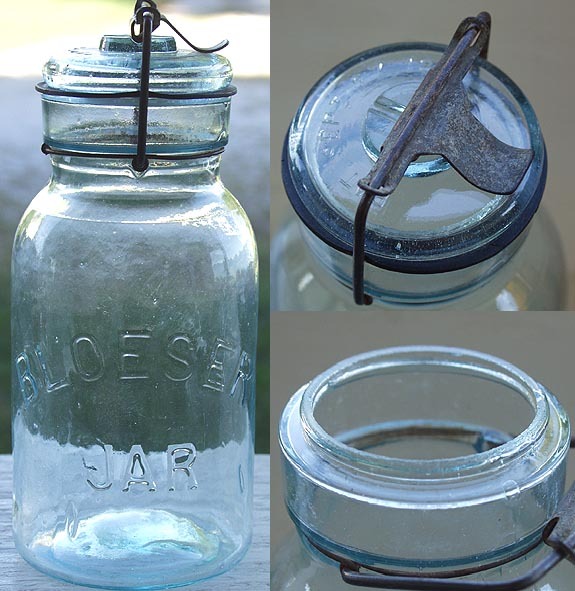 The picture to the right shows a pint sized Kerr Economy jar with the cap and spring clip in place. Click Economy Jar Cap to see a close-up picture of the cap and spring clip. The picture below left is a close-up of the finish on the quart size. 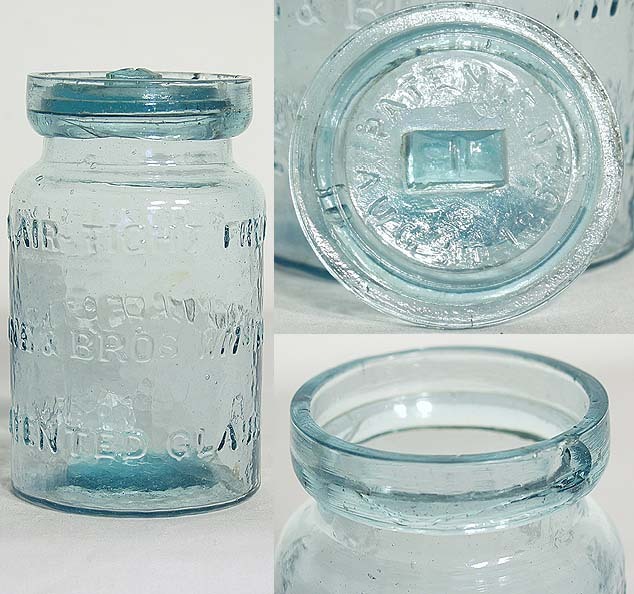 Click Kerr Economy to see a picture of the entire quart sized jar which is embossed with "KERR GLASS MFG CO / SAND SPRINGS OKLA / PAT JUNE 9 1903" on the base and dates from the late 1910s to 1920s (Creswick 1987). This type closure is also called a "spring seal" (Berge 1980). 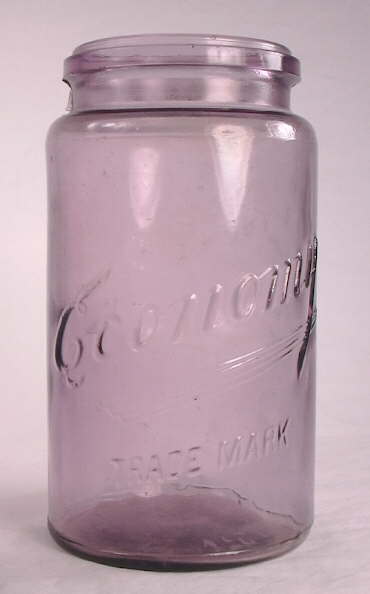 The earlier jars (pre-1915) were embossed Economy Trade Mark on the sides with later ones embossed Kerr Economy Trade Mark (after 1915). The jars pictured here are the latter types with Kerr embossed. Both styles, however, had the various plant location names on the base: Portland, Ore., Chicago, Ill., or Sand Springs, Okla. These jars were produced in pint, quart, and half gallon sizes all of which took the same size cap and clip - a convenience for home canners (Leybourne 2001). 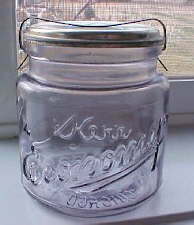 For a picture of the earlier Economy quart jar, click Economy jar which shows a Portland, Ore. base embossed version. 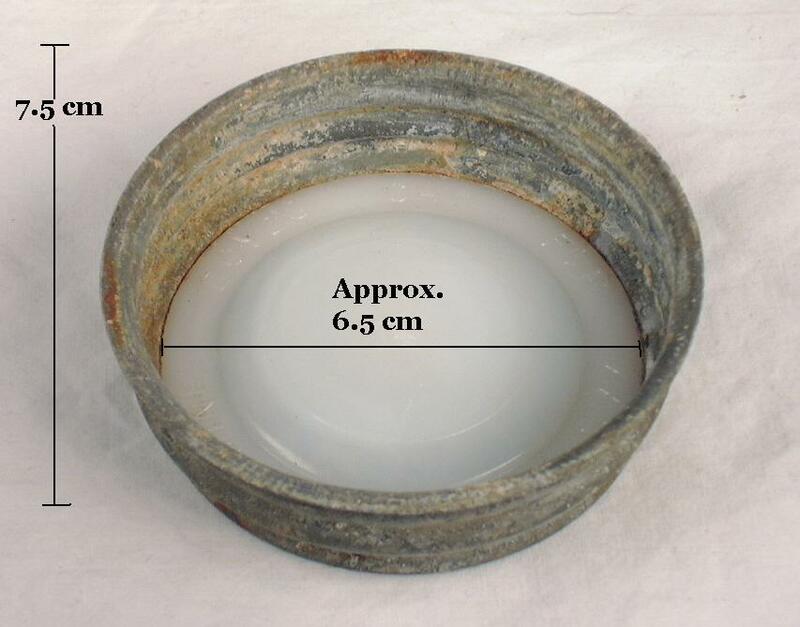 It is common to find fragments of this jars thick base with the city name embossed and identifiable (and other parts of the jar too) on historic sites - at least in the West - dating from the first third of the 20th century. 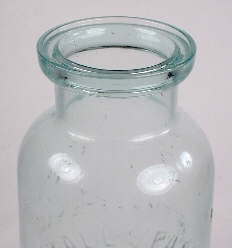 The Economy jar and closure was covered by several patents issued between 1901 and 1903 with the jar continuing to be produced until 1957 when Kerr Glass discontinued this line. The lids were produced until 1961 (Creswick 1987). 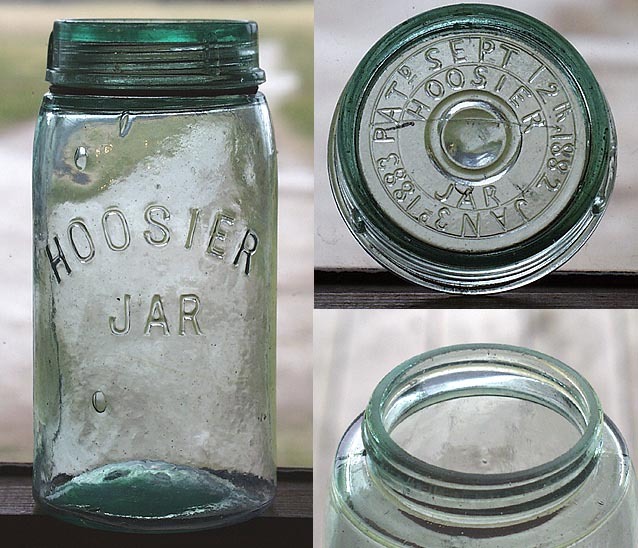 It appears, however, that the jar was most popular between 1903 and the 1930s when the Kerr Self-Sealing Mason jar, with its cap held in place by a screw band instead of a clip, began to (and still does) dominate the fruit jar market. 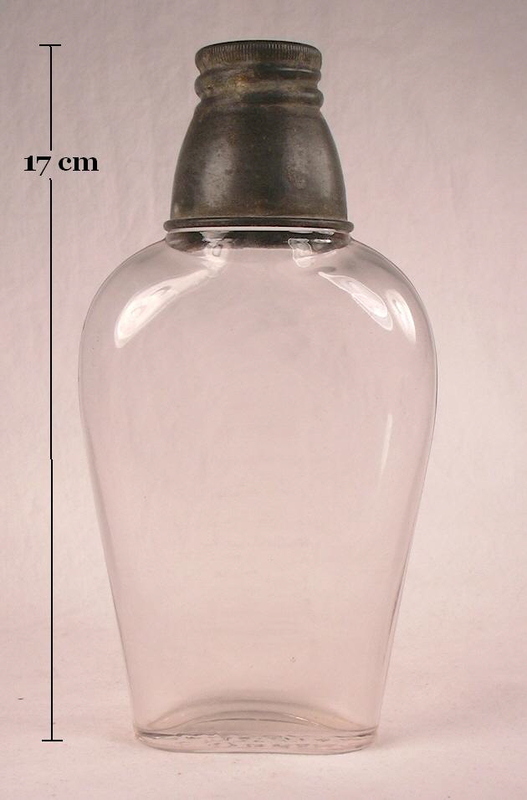 Many of the earlier Economy jars (pre-1920), like the pint pictured to the above left, will turn slightly pink due to the use of manganese dioxide as the decolorant in the glass batch. Others like the quart pictured above right have a slight straw or grayish tint induced by other decolorants like selenium and/or arsenic. See the Bottle/Glass Color page for more information on colorless glass and decolorizers. 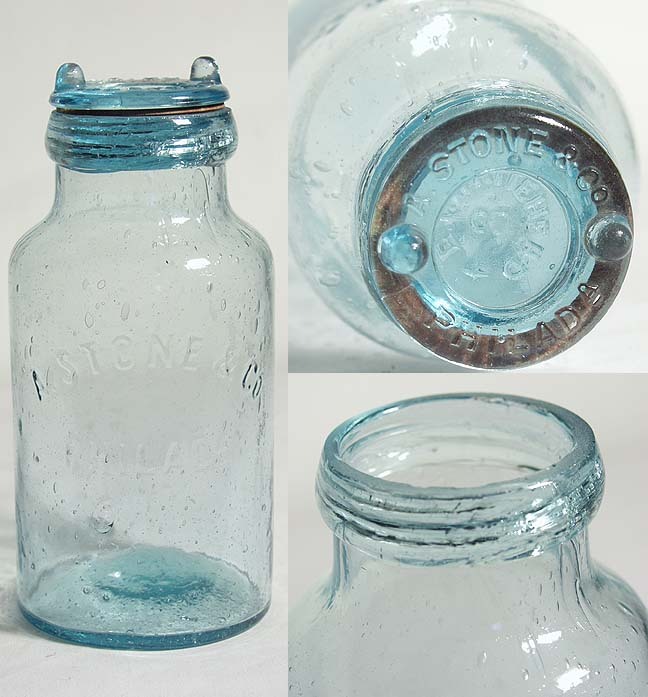 Analogous to the soda/mineral water bottles discussed above, there were a myriad of different closures used on hundreds of different fruit jar types over many years between the mid-1800s and the early 1900s. After that time, the uniformity and standardization of machine-made manufacturing methods ended the experimentation that dominated the earlier period. Though a fascinating history, coverage of all the possible variations is not possible on this website. If interested in the subject of closures, the works of Toulouse (1969a), Roller (1983), and Creswick (1987) provide more in-depth coverage of the subject. In order to get a feel for the variety of jars and closures, click some of the assortment of links below to view pictures of an array of weird and unusual jars. These pictures are compliments of Greg Spurgeon Antiques (www.hoosierjar.com). The dating is primarily derived from Creswick's monumental two volume "The Fruit Jar Works" (1987) and is largely based on the jar and/or closure patent dates since most of these jars did not see widespread nor long term use by home canners. 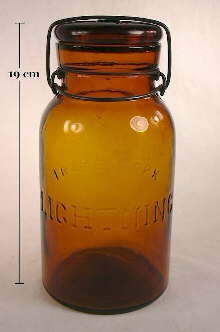 There were several other non-canning/fruit jar related closures used on wide mouth food bottles that also vacuum sealed. One was the Phoenix closure/cap which was first patented in France in 1889, brought to America in 1892, and patented here in 1893. It greatly expanded the market for the packaging of food in glass. This closure was a simple top-seal, two-piece design with a flat tin plate disk lid with a gasket or liner held in place on the jar top by a clasp band. The top edge of the clasp band was rolled over the disk lid edge while the lower edge of the band was rolled beneath a collar finish molded on the jar. This formed a hermetic seal that could withstand the non-vacuum heat processing for the contents and was opened via a simple tongue and slot clasp which also allowed resealing. As important, this closure could be applied by machine (Lief 1965; Bender 1986; Caniff 2008). The Phoenix cap was invented in Paris by Achille Weissenthanner in 1892 (Lief 1965:20). It is a two-piece cap consisting of a tin plate and rubber ring that is held in position by a safety band. The band is secured by a tongue-and-eye compressing apparatus. The band was crimped on top and bottom which secured it around the circular disc and to a glass bead finish. The Phoenix cap was first measured in millimeters (48mm, 53mm, 58mm, 63mm, and so on). This led to adaptation of a similar numbering system in the United States. The Phoenix-type jar was used for jams, jellies, preserves and other products which could be stored due to the high sugar content (Lief 1965:21). At the turn of the twentieth century, more and better ways of sealing food items were being researched, invented, and patented. One such patent of 1902-03 was the Giles jar and cap. Mainly used for cold-pack vacuum processing of meats, it consisted of a horizontal ledge just below the top of the finish to which a rubber gasket was vacuum sealed against the straight wall (Lief 1965:22). These and similar closures were very popular from the mid to late 1890s to the mid-20th century and are probably in some use today (Bender 1986). 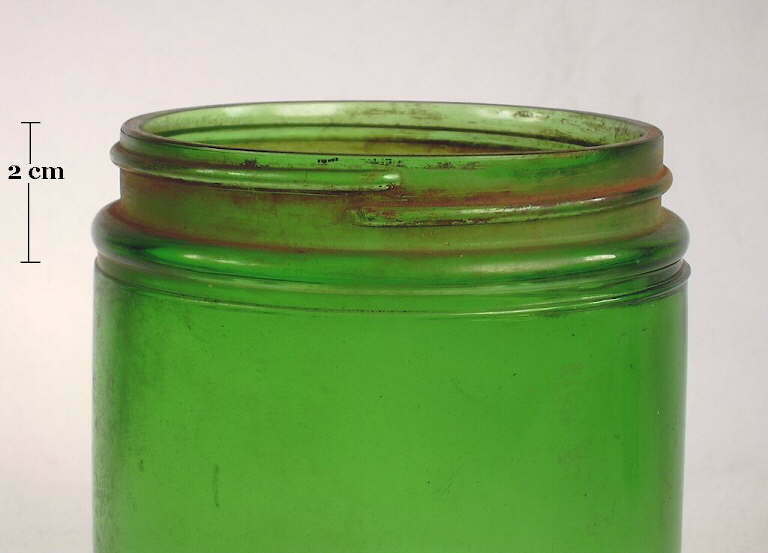 Click on the following links to view a small wide mouth jar likely used for either dried beef bottling or possibly jelly/jams and utilized some type of Phoenix or Giles-like closure: entire jar; close-up of the banded finish. This particular jar is embossed on the base with PATENTED / JUN. 9, 03. / JUNE 23, 03. 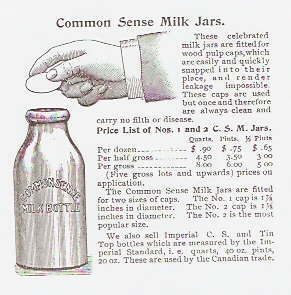 (the patent dates for the closure not the jar itself) and likely dates within a decade or so of 1903. Empirical observations indicate that a large majority, if not all, Phoenix and Giles-type closure accepting jars (like that pictured at the links above) are machine-made (both press & blow and blow & blow machines) and were most common during the first third of the 20th century. This closure type is by far most commonly seen and associated with milk bottles. These waxed paper/cardboard caps were made by different companies that had their own proprietary names for them. Examples of names and types include "San Lac Seal", "Health Milk Bottle Cap", The Perfection Pull Cap", "Kuvercap", and others (Tutton 1994). For simplicity it is just called a capseat closure or cap here. 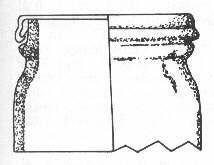 The one-part finish that accepts this closure - also referred to as the "common sense" finish - has a relatively wide bore (mouth) in which there is an edge or ridge about 1/2 cm (1/4") below the inside edge of the rounded finish - see image to the right (Rawlinson 1970). This ridge is where the disposable paper/cardboard cap (usually wax coated) sat to seal the contents from contamination. The bore (inside diameter of the mouth) of most capseat finishes made from the 1910s on are the same diameter - approximately 1 5/8" (42mm) wide. 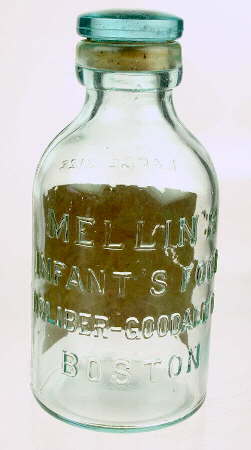 Earlier milk bottles - including mouth-blown examples with hand tooled finishes - varied more in the size of the bore and different size caps were made for them, although the noted size was also commonly used (Tutton 1994). The paper disk was easily removable and easy to put back in the mouth of the milk bottle protecting the contents until the next use. Since milk has a very limited life span, the paper disk only had to last a week or so and were not designed for durability. 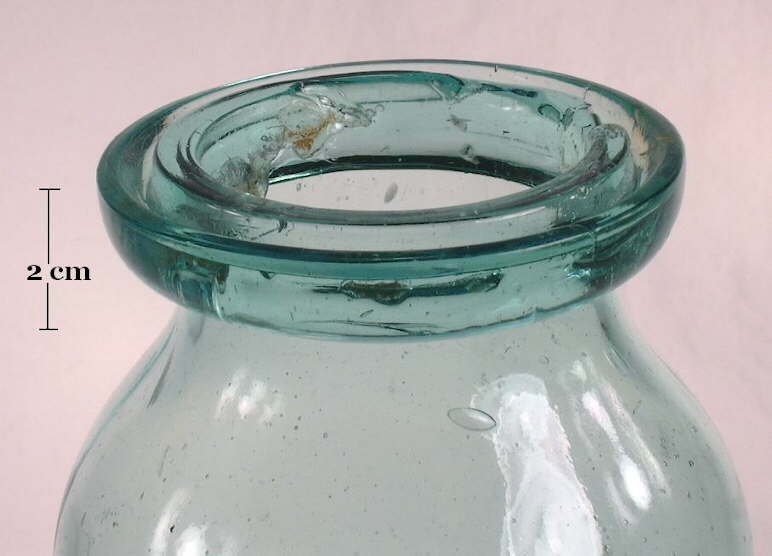 As the pictured milk bottle to the left shows (click to enlarge), the prying of the cap out of the bore of the bottle with a knife or other pointed implement often resulted in chipping or small pressure cracks or "flashes" to the glass on the rim of the finish. 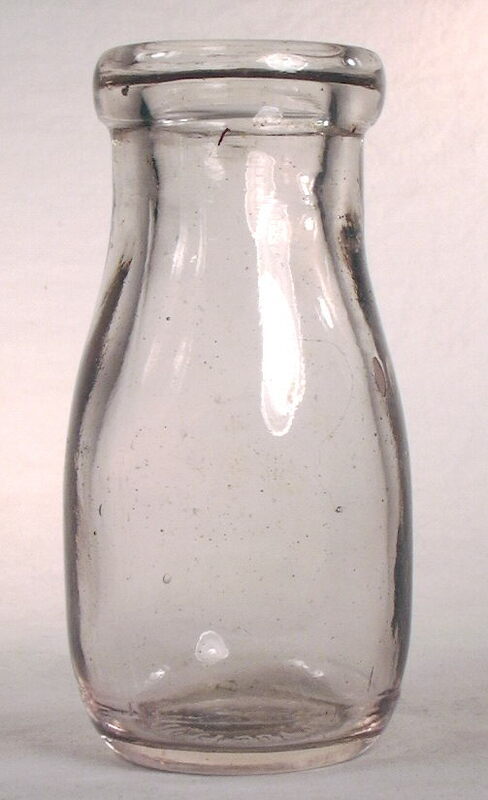 This finish/closure is very diagnostic of all shapes of milk bottles (cylindrical, square, and rectangular) and is usually seen on milk bottles dating from the 1910s up through the 1950s but can occasionally be found on some milk bottles dating back to the 1890s, as the 1899 advertisement above shows. 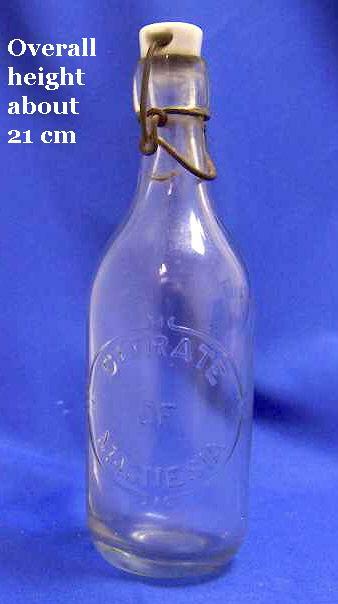 Click Empire 1901 patent milk bottle to view an early 20th century (1901-1910) mouth-blown half-pint milk (cream) bottle that has a tooled capseat finish. 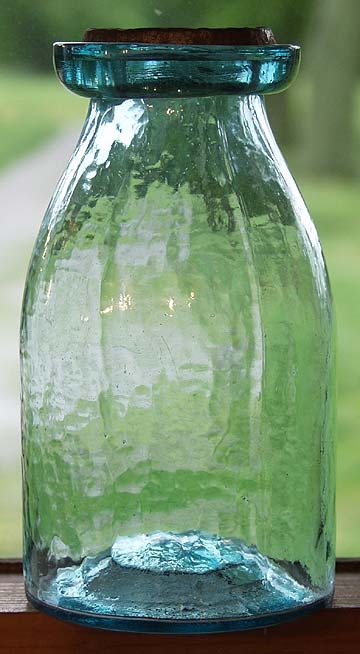 There appears to have been some limited use of this type finish on a few other types of bottles, most notably food bottles made during the first third of the 20th century. Even though the finish has the edge inside the mouth, whether these bottles used the ligneous cap or not is questionable. 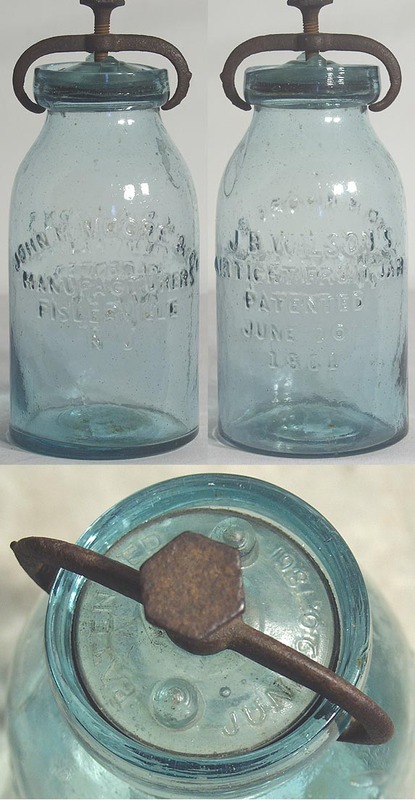 For example, the image to the right is of a small (6 3/4" tall) pickle bottle from the early 20th century that appears to have a capseat accepting finish, though with a bit different finish conformation than the typical milk bottle. 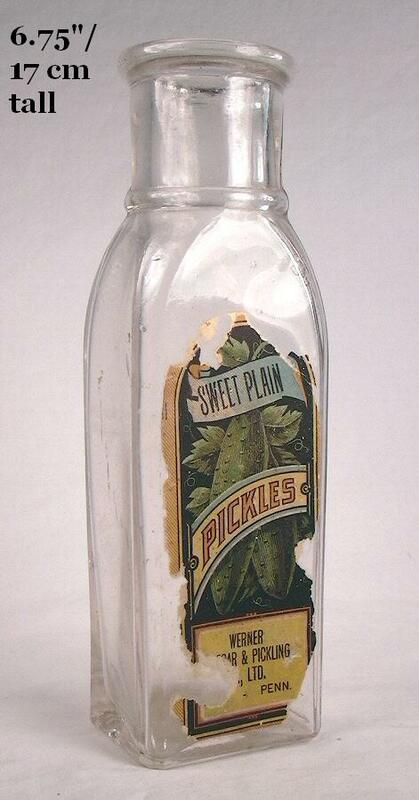 (Click sweet pickle bottle to see the entire bottle.) The base is also embossed with K. G. B. Co. which indicates manufacture by the Kearns-Gorsuch Bottle Co. (Zanesville, OH.) who specialized in "Packers' Ware." However, Kearns-Gorsuch is known to have produced a proprietary closure for food bottles that they called the "Spring Top" closure. It was designed to fit the type of finish on this bottle, which otherwise looks like a capseat. 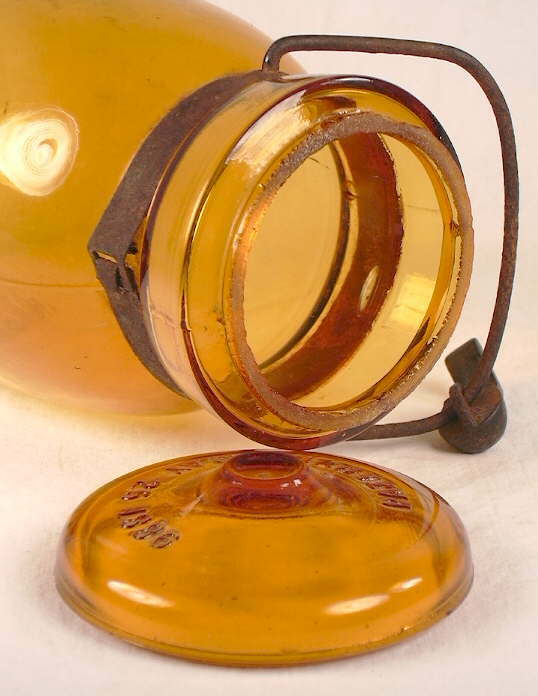 This closure was patented in 1899 and consisted of a round glass lid with a rubber seal that fit into the "capseat" ledge, all of which was held in place by a spring clip that hooked under the lower edge of the finish (Kearns-Gorsuch Bottle Co. 1916). 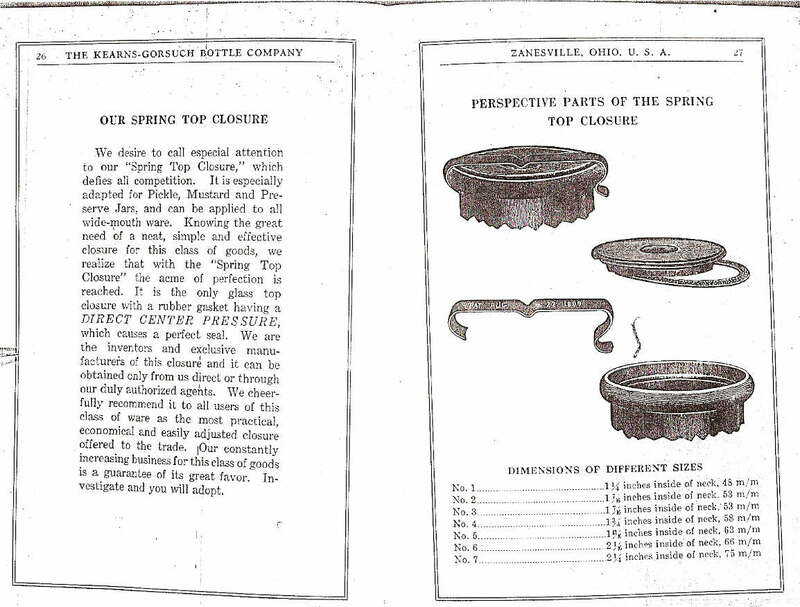 Click spring top closure to view the pages from the 1916 Kearns-Gorsuch catalog that illustrate this closure. So this finish was probably not intended to accept a capseat disk and instead accepted the spring top closure. The majority of liquor flasks produced during the period covered by this website (1800 to 1950s) used either cork (generally pre-1920s), externally threaded screw caps (generally post-1920s but not uncommon as early as the 1890s), or much less frequently some of the closures already noted above. There were, however, a couple other closure types that were utilized on liquor flasks but are rarely if ever seen on other types of bottles. A couple of these unusual closures are covered below. 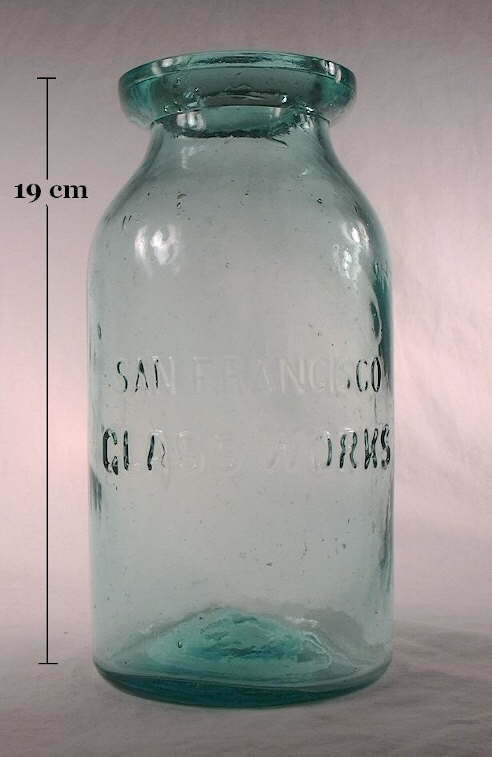 Carlton Newman was a glassblower at the Pacific Glass Works in San Francisco in the 1860s, then went on to co-found the San Francisco Glass Works in 1865, which became the San Francisco & Pacific Glass Works in 1876 where these flasks were likely made (Toulouse 1971). In 1876, he patented a design for a flask which was sealed with a screw cap that was large enough to double as a shot "glass" also. The threads were at the bottom of the shot cap. Embossed on the base of these flasks is C. NEWMAN'S PAT. OCT. 17 1876 which is also stamped on the outside bottom of the shot cup. Click Newman's patent #183,322 to view the original patent. Click Newman's flask & cap to see the example to the left with the cap off; click Newman's flask to see the entire bottle with the cap on (U. S. Patent Office 1876b). These flasks are always mouth-blown and when made in the pint size in amber glass they date between 1877 and about 1880. 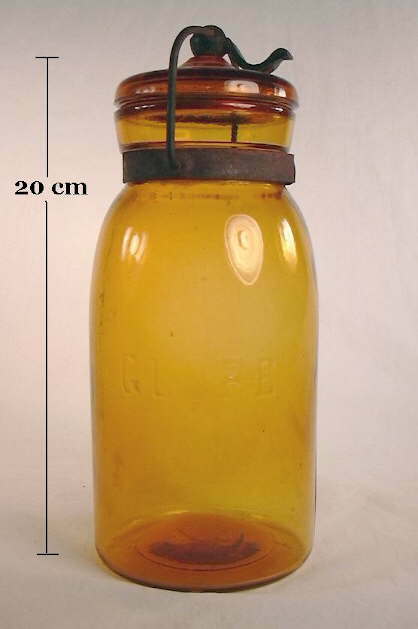 In the pictured half pint size in colorless glass (sometimes amber glass) the flasks date from the 1880s and possibly 1890s (Wilson & Wilson 1968). These flasks are not often seen, but are common enough to warrant mention. It has also been established that these uniquely shaped flasks were made by glass companies outside of San Francisco since one example firmly dated from 1880, has Baker Bros. & Co. (proprietors of the Spring Garden Glass Works, Baltimore, MD.) embossed on the base along with regular base embossing noted earlier (Baab 2005). Since these flasks were always mouth-blown, the top surface of the external screw thread finish (the rim) is ground flat; click Newman finish close-up to view a close-up picture of the threads and ground rim. The double screw cap closure is a variation to the external screw cap closure noted earlier on this page. The difference, as the pictures show, is that there is one screw cap that actually seals the bottle and a second one that screws onto the neck of the flask, fitting over the first cap. The second cap was the "shot glass" for dispensing the typically spirituous contents of these flasks. 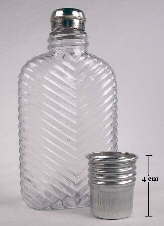 Double screw cap flasks came in many shapes, designs, and sizes and were made by many different glass makers. Most of these types of flasks, however, range in size between 6 ozs. and a pint. Double screw cap flasks can be either mouth-blown - in which case the top surface of the screw thread finish is ground - or machine-made. Machine-made flasks would have a smooth, non-ground rim as well as other machine-made characteristics. The pictured mouth blown double screw cap flask was called an "Imperial Flask" by its likely producer. It is approximately 6 ozs. in size and was almost certainly produced by the Illinois Glass Company between the late 1890s and the early to mid 1910s. It is not makers marked with the symbol for this company, but was specifically listed and illustrated in the companies catalogs during the listed period of time (Illinois Glass Company 1899, 1903, 1908, 1911). Click Imperial Flask in IGCo. 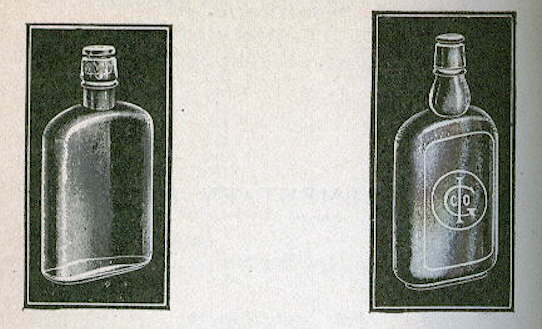 catalog to see a page from the 1908 Illinois Glass Company catalog that shows this specific flask in various sizes with the same exact caps as shown in the picture. The catalog also notes that "This flask makes a very convenient and secure traveling flask for Tourists and Salesmen." No wonder Prohibition was passed! Based on listings in glass makers catalogs and empirical observations, mouth-blown, double screw cap flasks were made from the 1890s until National Prohibition after 1919. Some machine-made versions were likely made in the mid to late 1910s, though most machine-made double screw cap flasks were made after repeal of Prohibition in 1934. This design continues to be somewhat popular and versions are still being made today. This completes an overview of the more common closures used on utilitarian bottles. If you have suggestions for additions to this page please feel free to contact the content manager with your ideas (email address at the bottom of the Homepage). We may have missed some relatively important closures that would enhance the ability of users of this site to date & type their bottles. Importance is in the eye of the beholder, however. Just be aware that the purpose of this page is to cover all the common types of closures found on utilitarian bottles, not to cover every closure that was invented or used for a short time. Some closures were just used so rarely that to devote much time to them accomplishes little since the odds of finding a bottle with that closure are very low. In addition, many types of closures are very subtle variations of the popular closure styles, usually dating during the same time range. Return to the Bottle Finishes & Closures page.